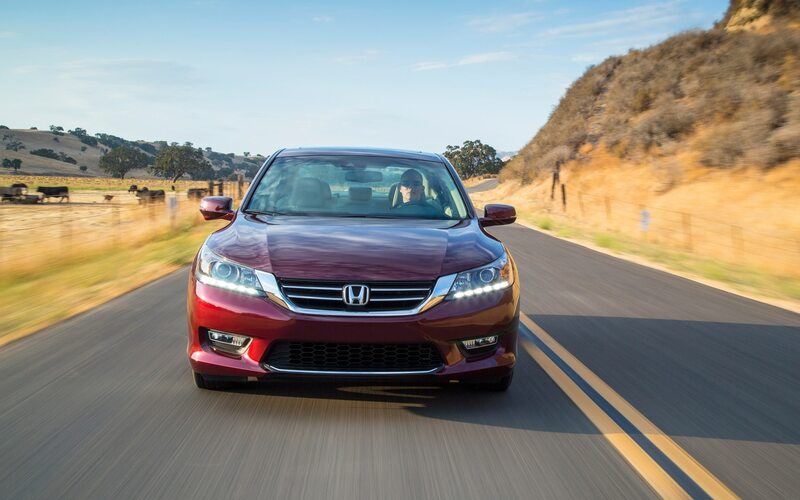 It may be hard for our younger readers to believe, but there was a time when enthusiasts cared about the Honda Accord, and even looked forward to a new Accord hitting the streets. 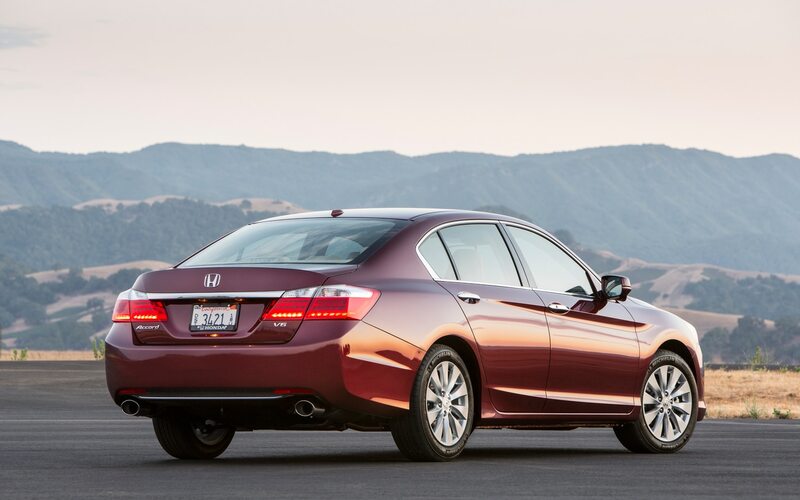 That excitement faded over the years as the Accord became bigger and softer, and when the last generation — an EPA-recognized full-size car — debuted in 2008, it seemed as though the Accord was aimed straight at the old, Buick-driving ladies of a certain age. 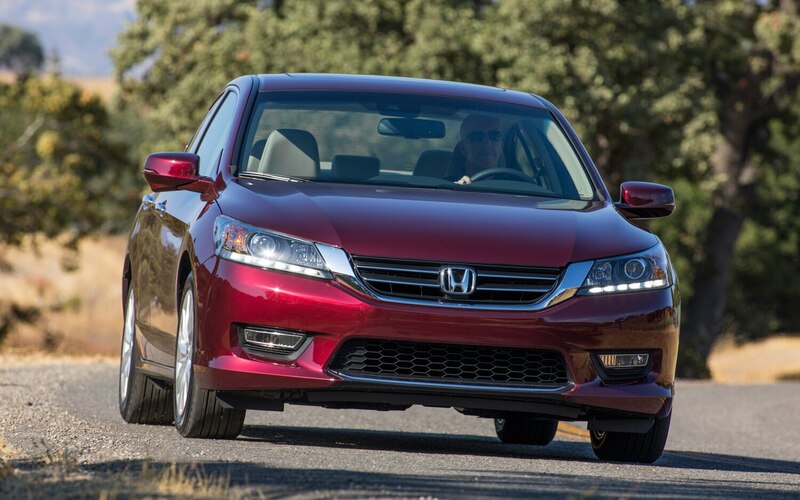 So as it enters its 37th year, we approached new-for-the-ninth-time Honda Accord with somewhat subdued enthusiasm. 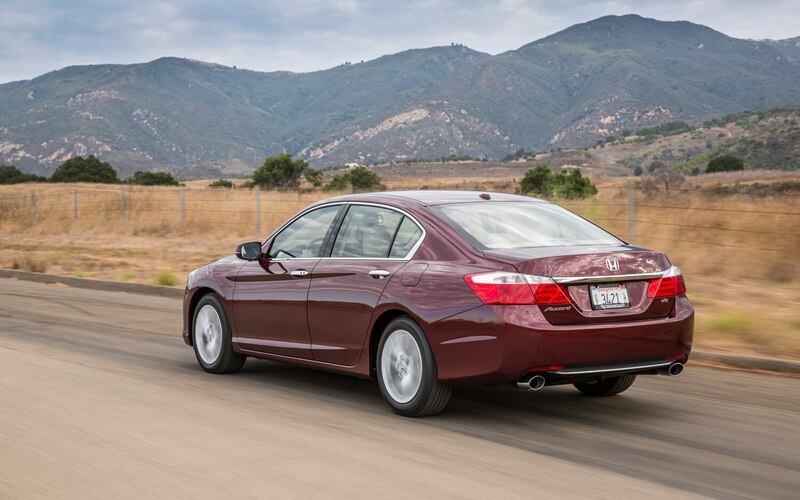 The last-generation Accord wasn’t just big; thanks to bulbous styling, it wasn’t shy about its size, either. 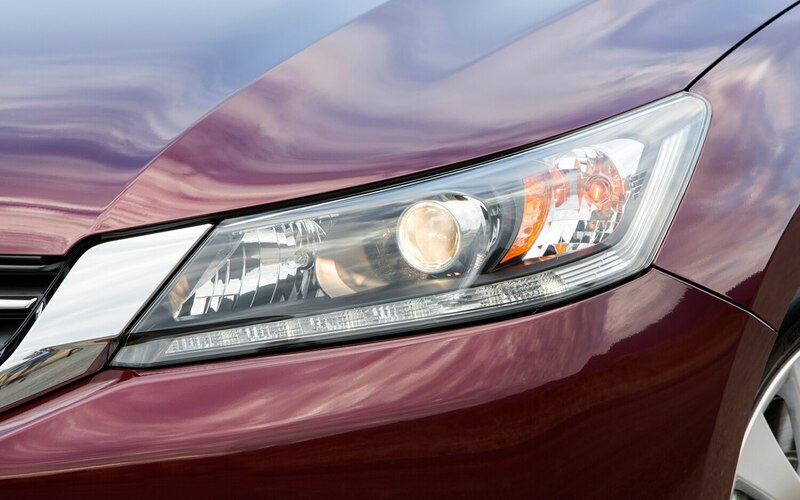 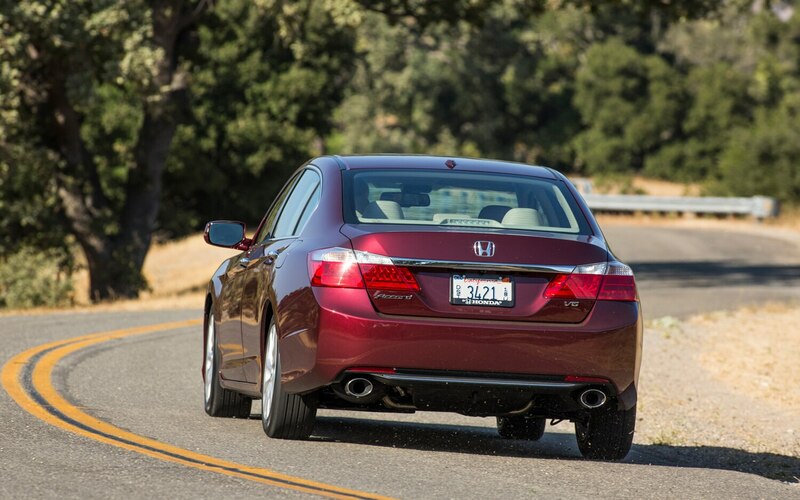 Honda has toned the 2013 Accord down slightly, but it’s still a very familiar shape. 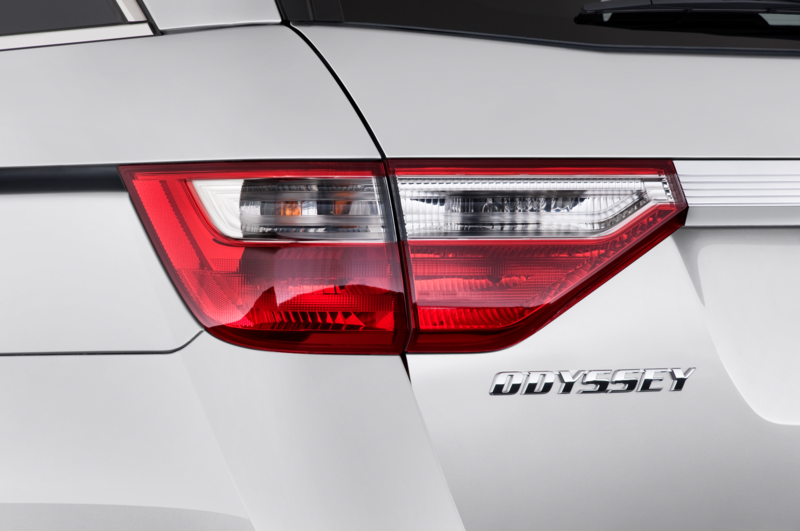 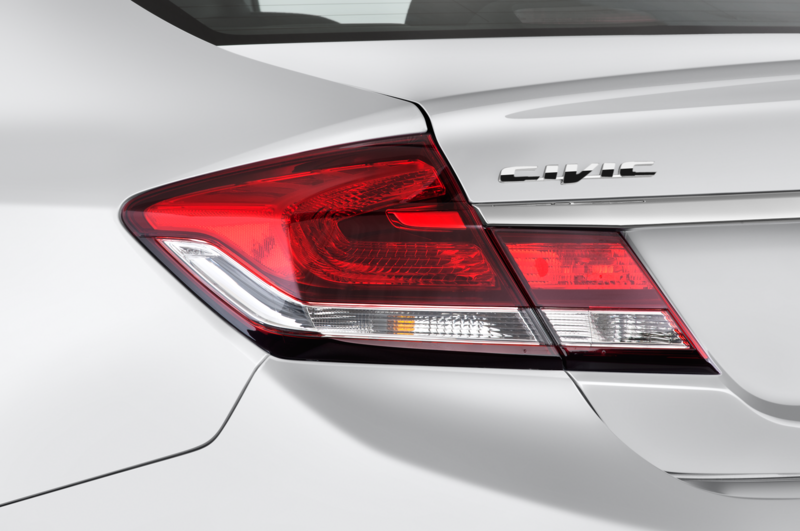 (Even if that means it looks like other cars — the rear is virtually indistinguishable from a Hyundai Genesis, the optional front LED DRLs are a dead ringer for those on the current Lexus.) 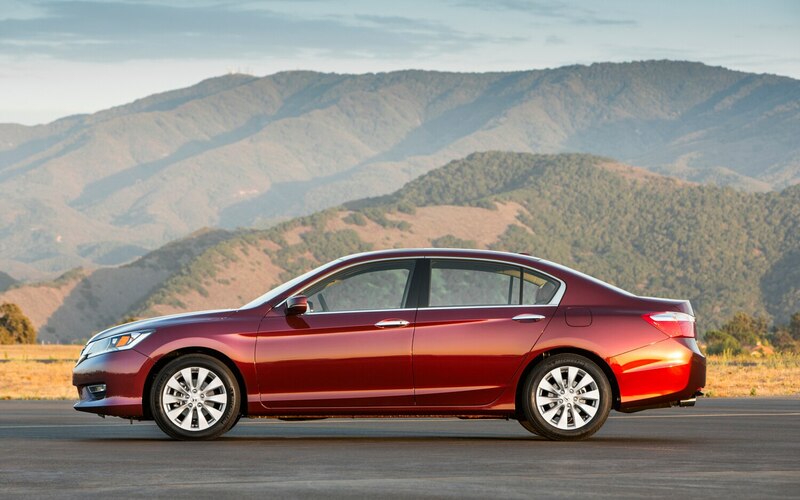 Overall, the Accord’s dimensions have shrunk somewhat: length is down by 3.5 inches, the wheelbase is trimmed by 0.9 inch, and the roof is 0.4 inch lower. 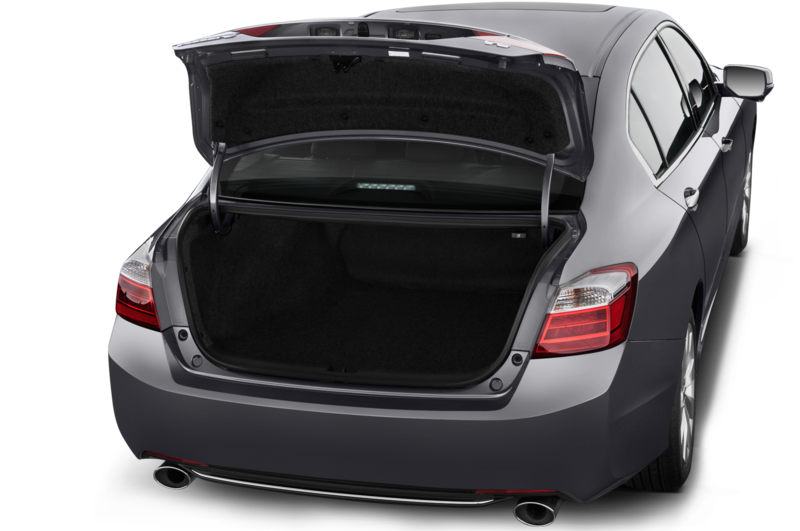 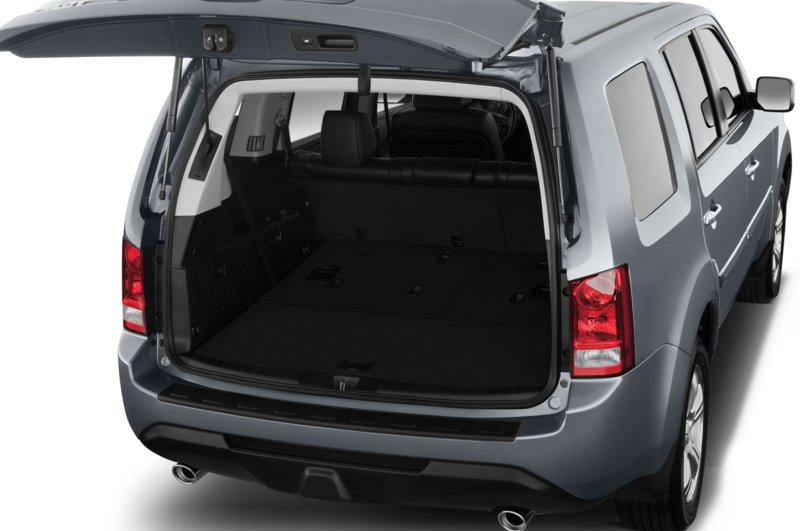 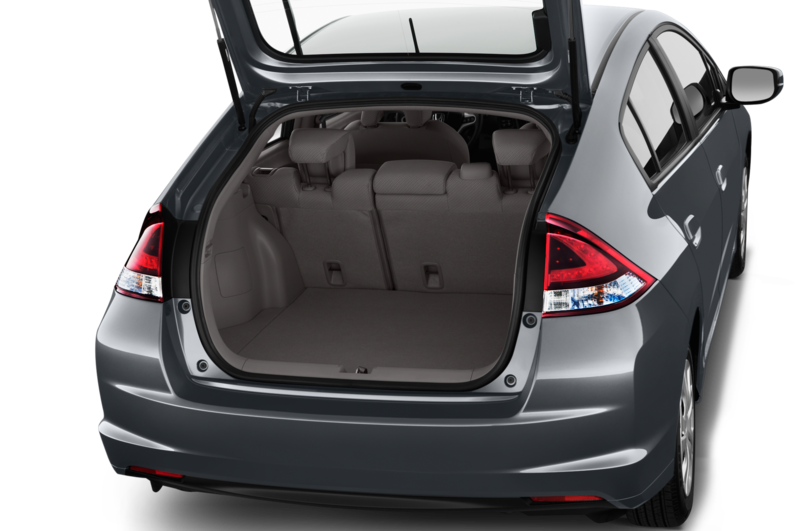 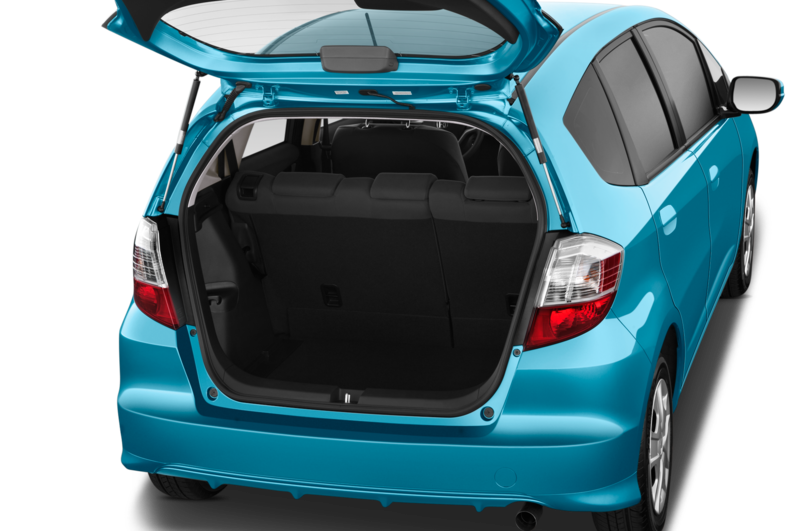 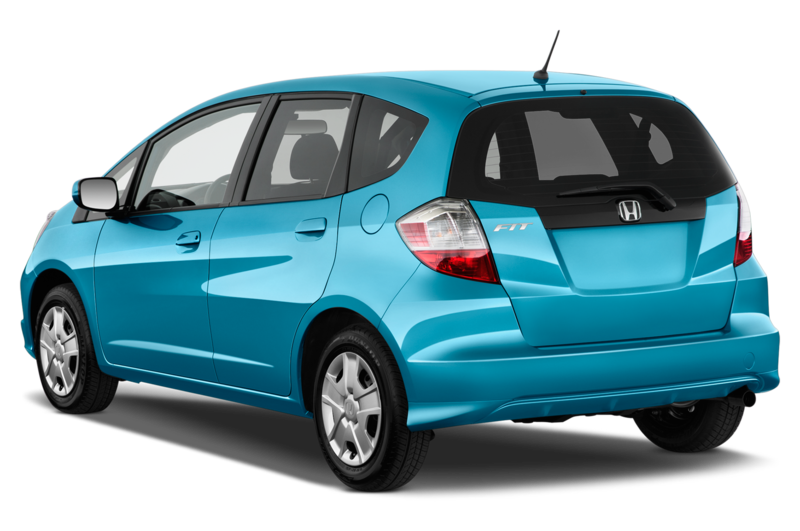 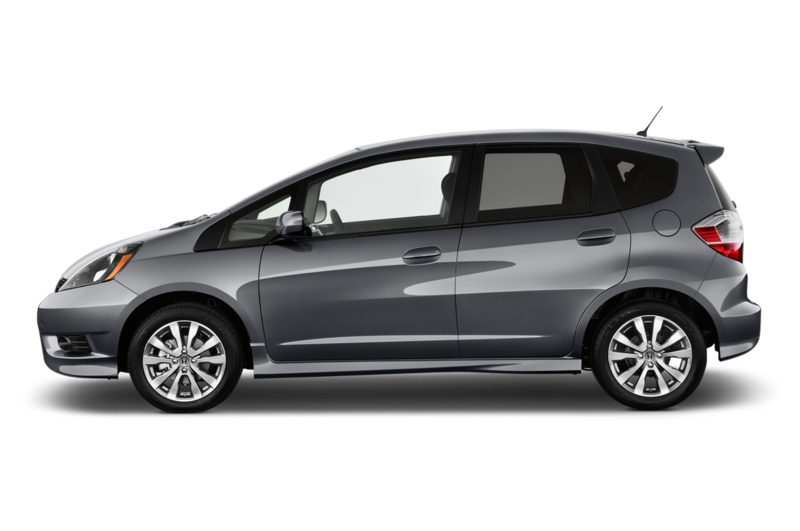 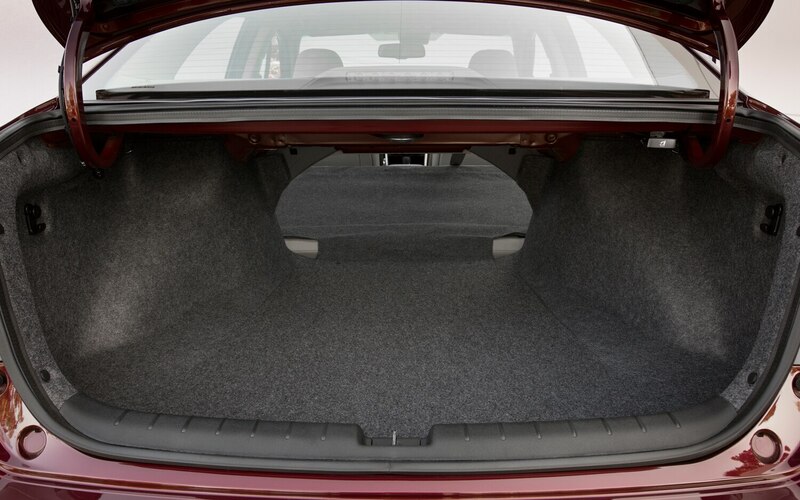 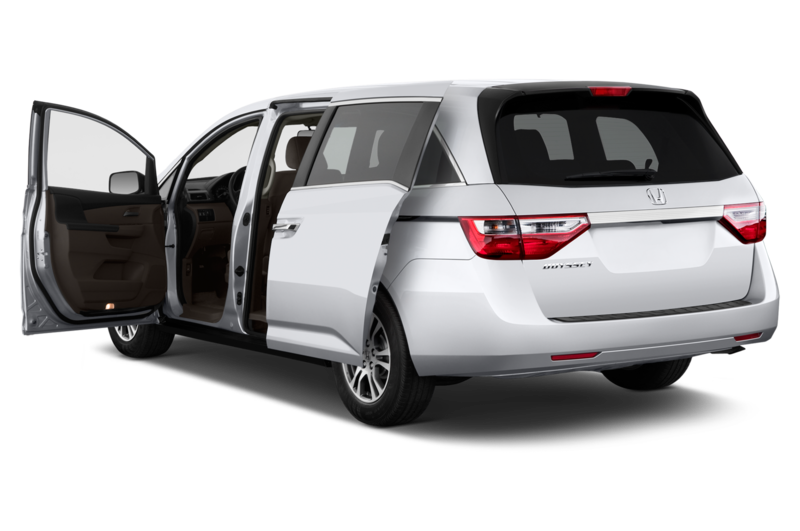 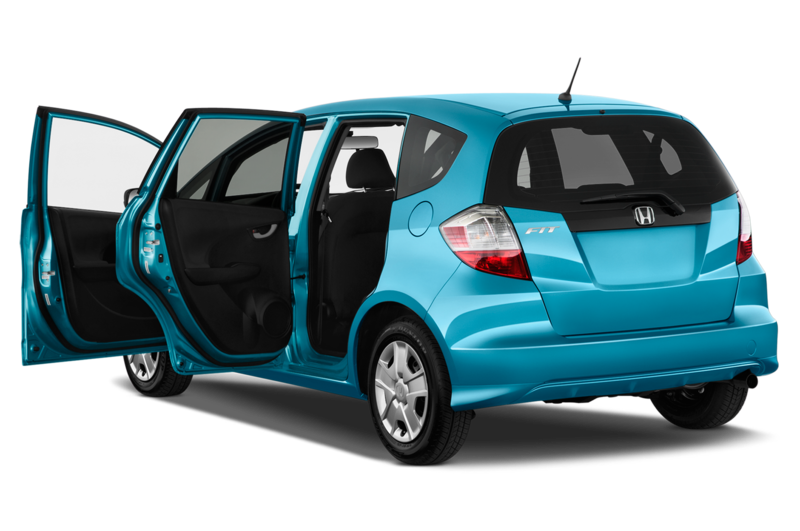 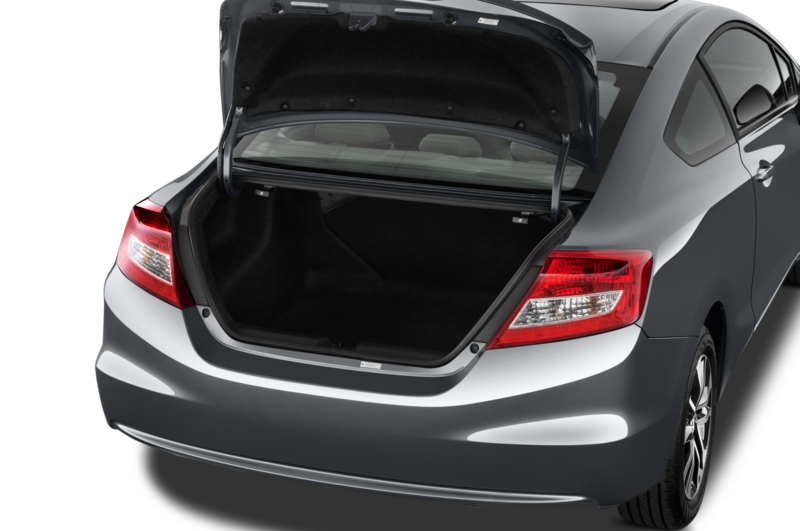 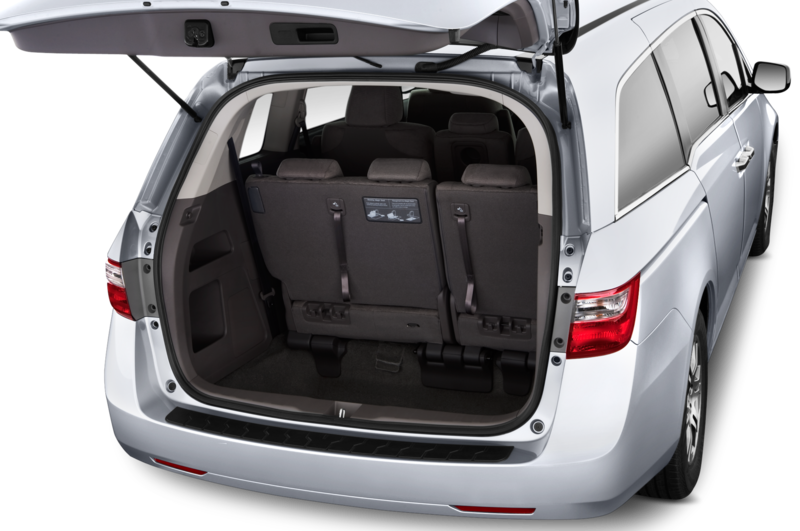 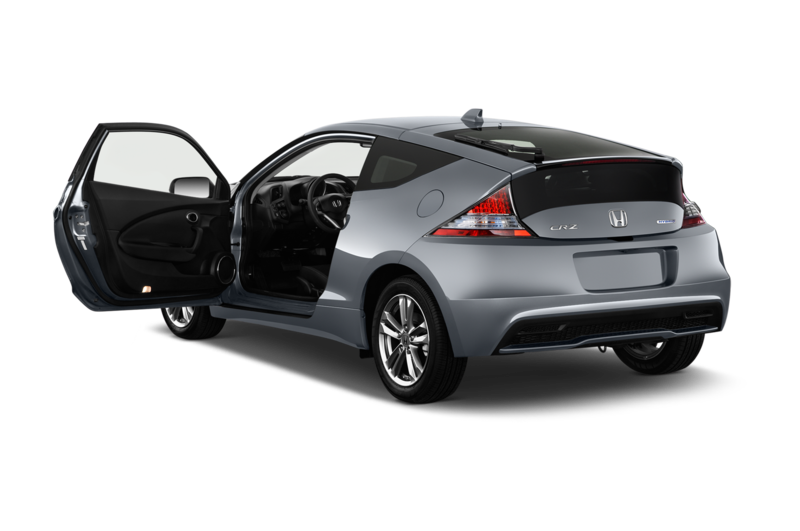 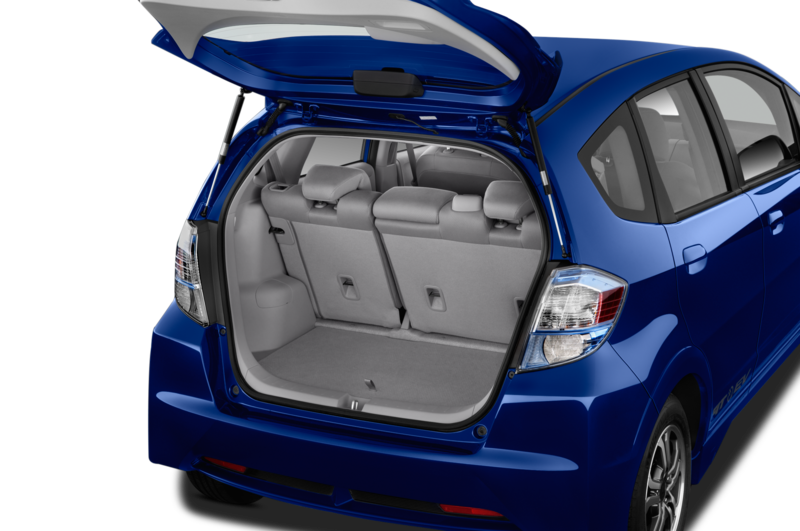 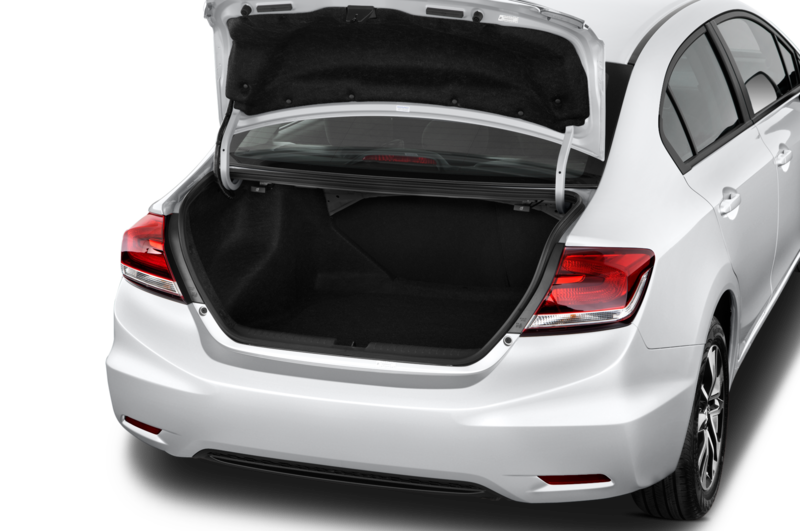 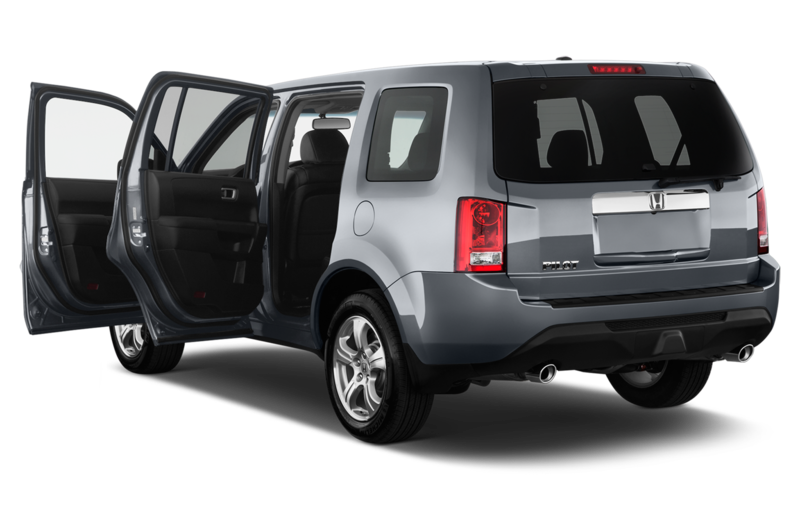 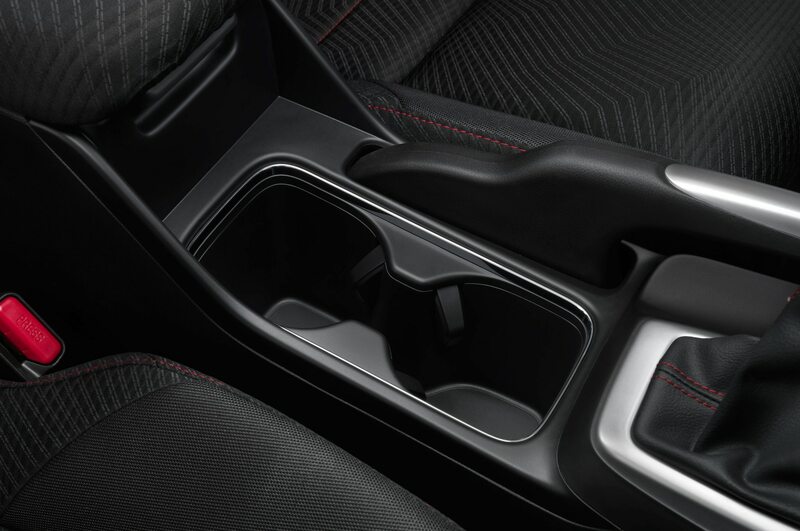 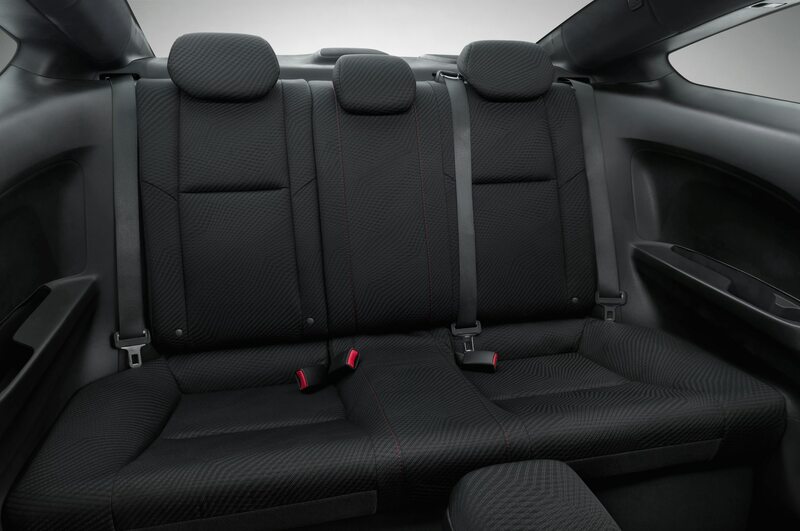 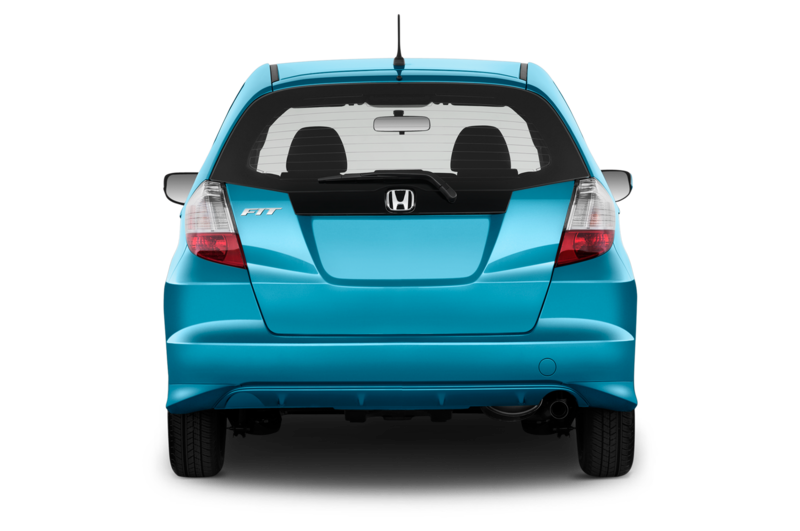 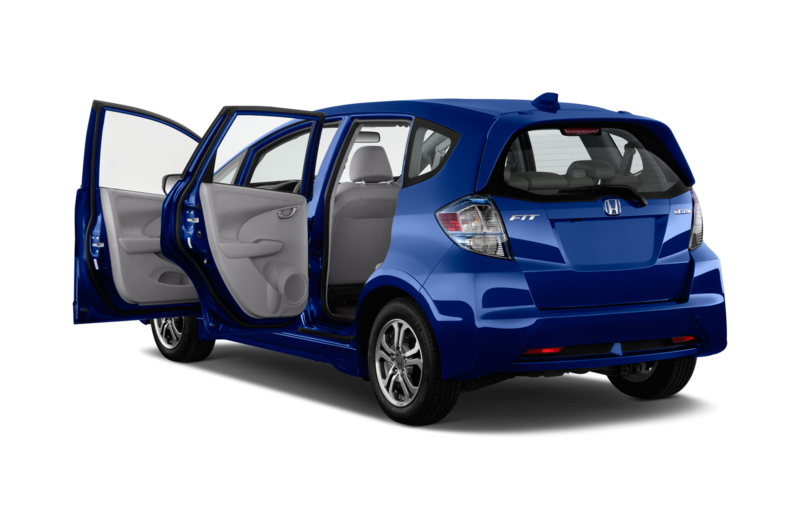 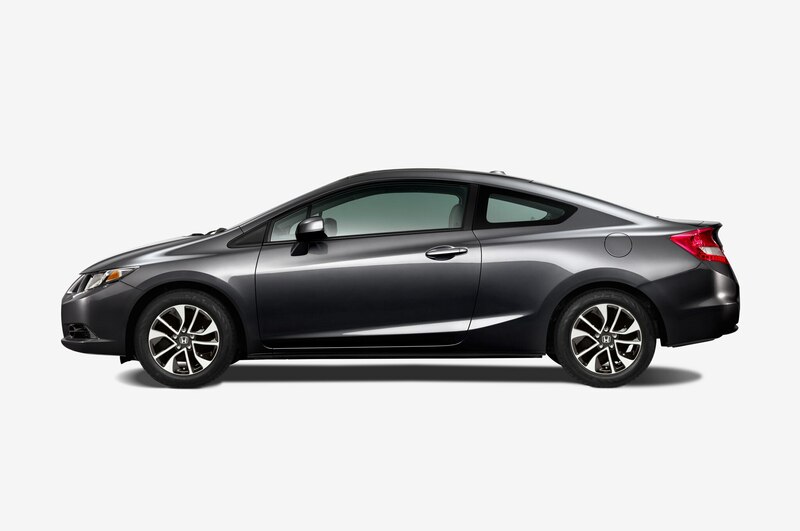 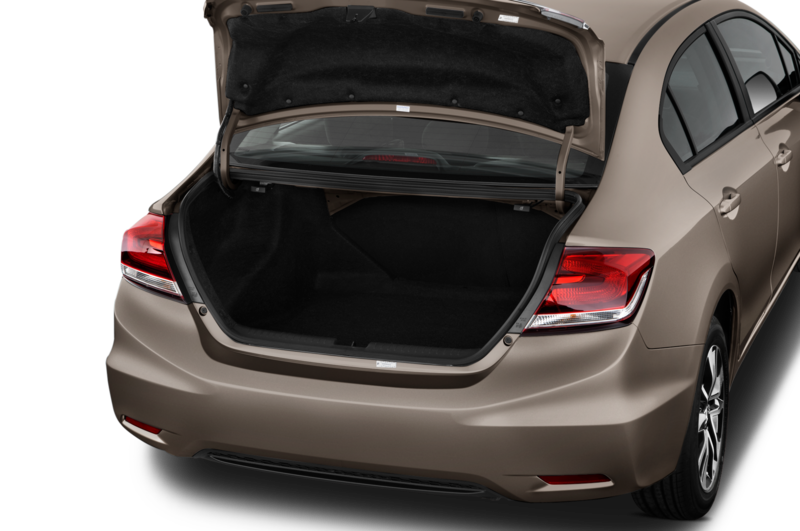 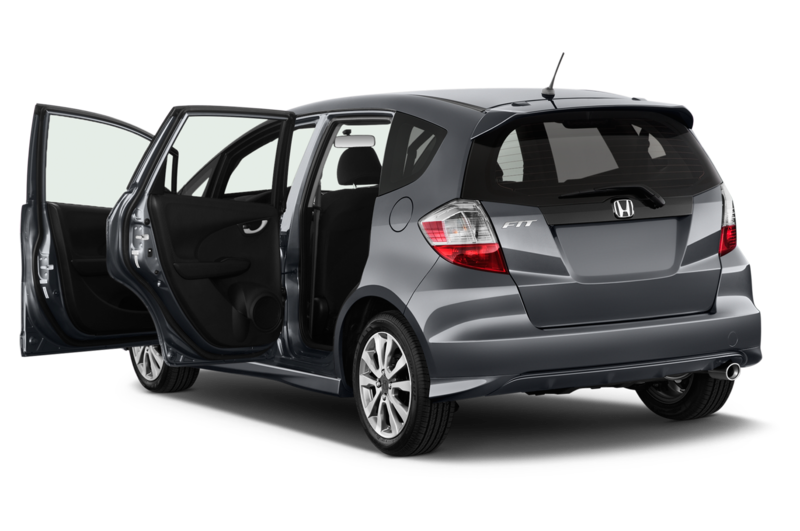 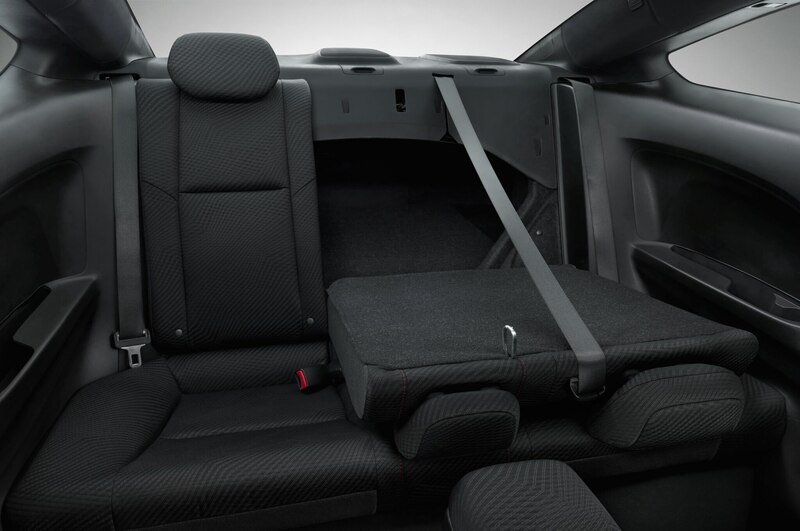 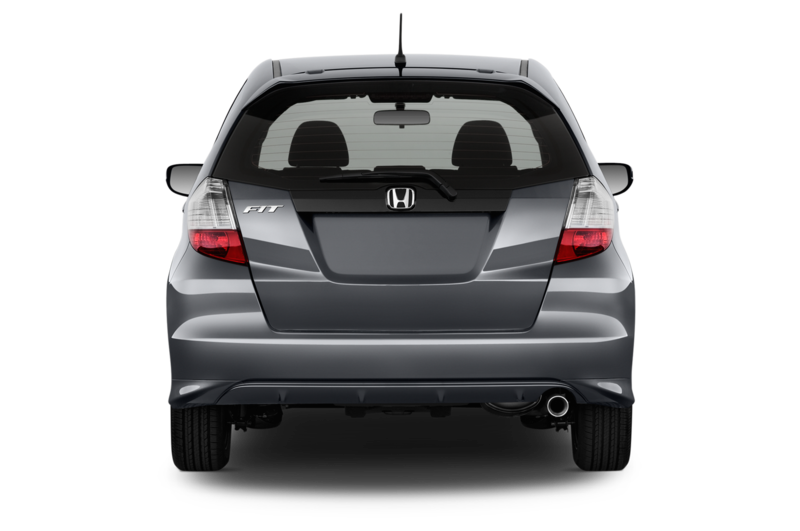 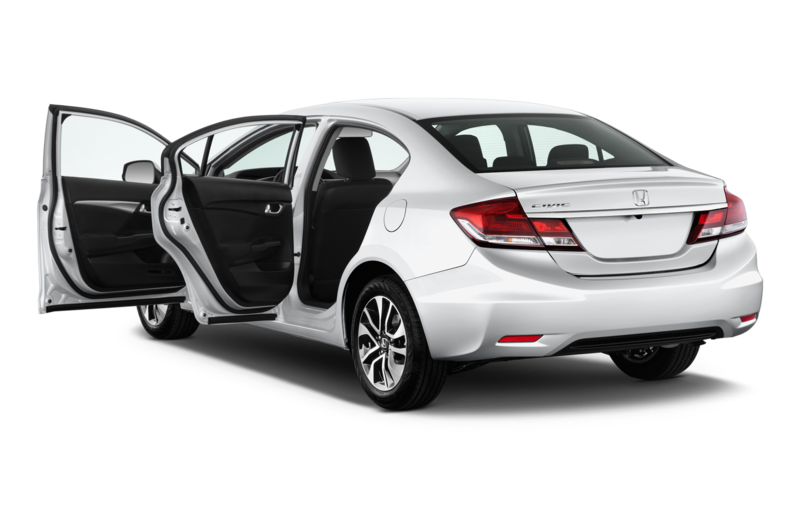 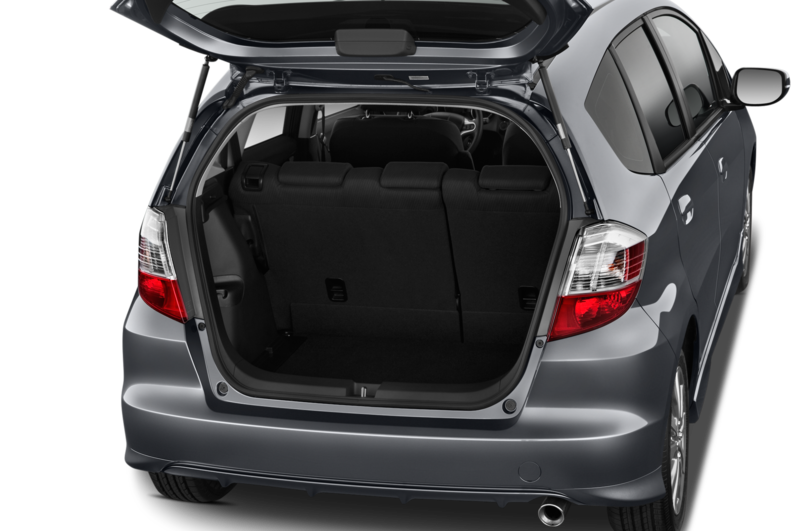 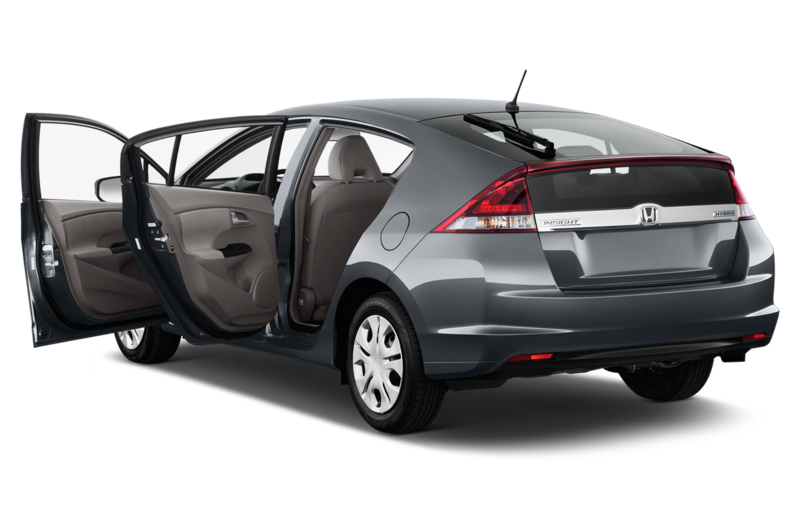 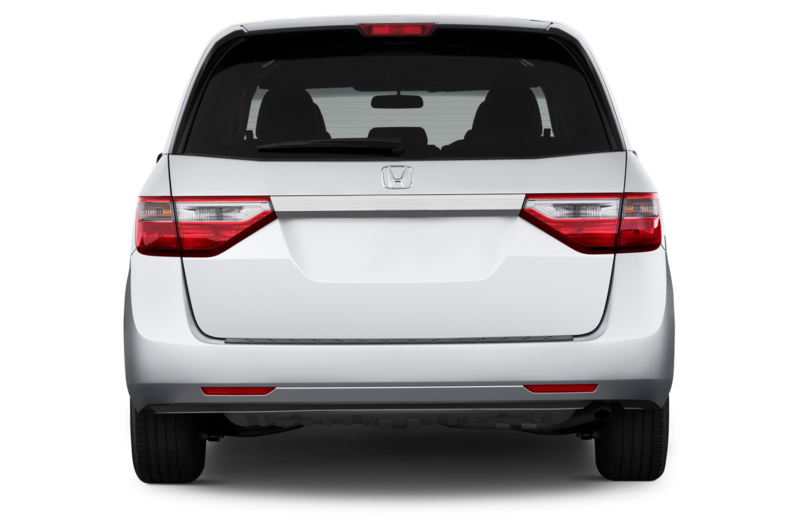 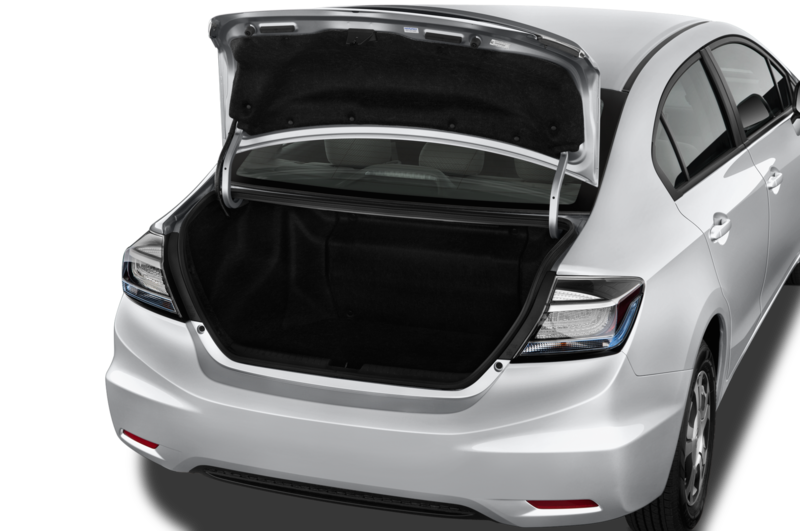 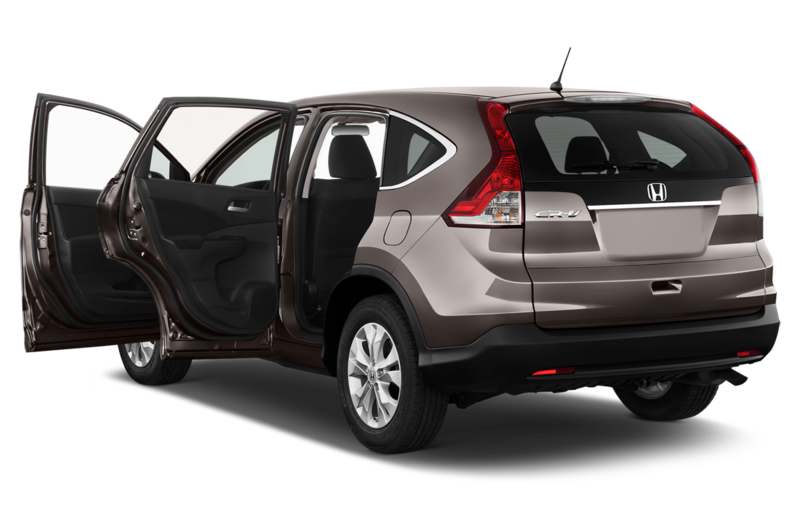 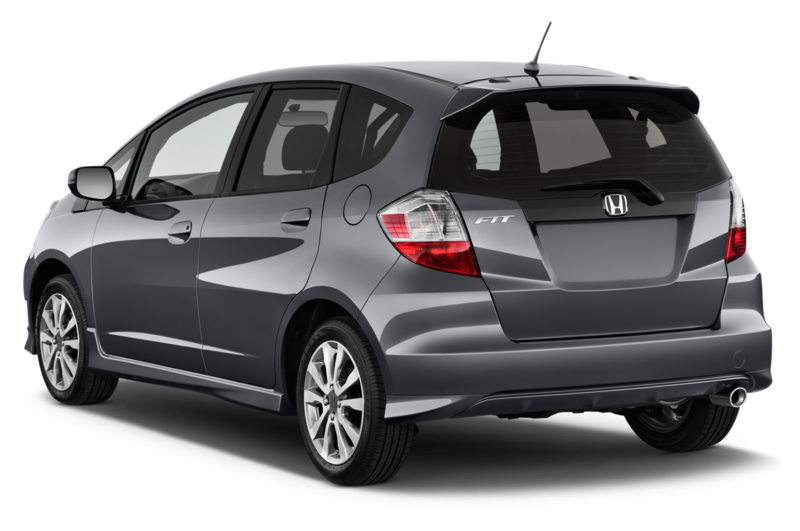 Width crept up fractionally, but the bigger news is that Honda has regained some of its packaging mojo: despite the smaller exterior, trunk space has increased 1.1 cubic feet, and almost all interior measurements increase slightly despite a smaller total interior volume. 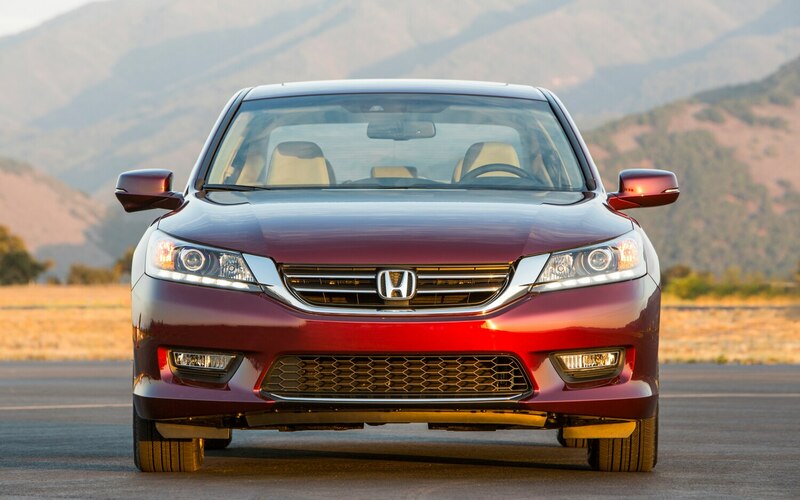 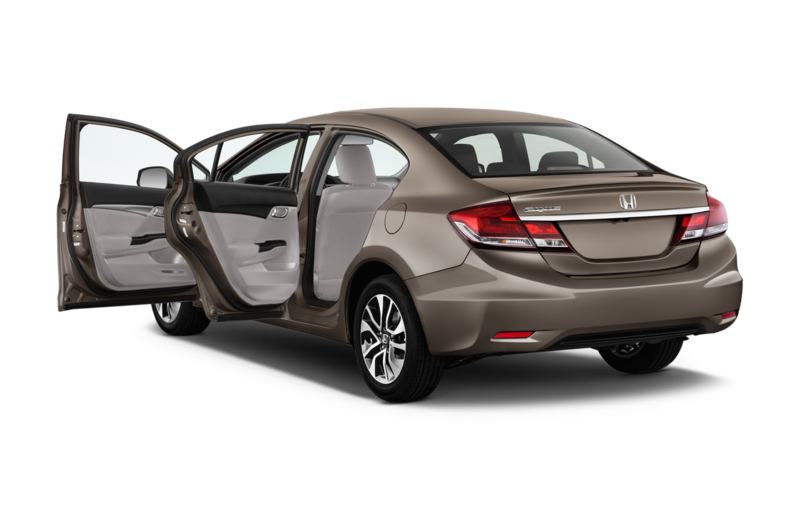 Rest assured: the Accord is still huge, especially in the back seat. 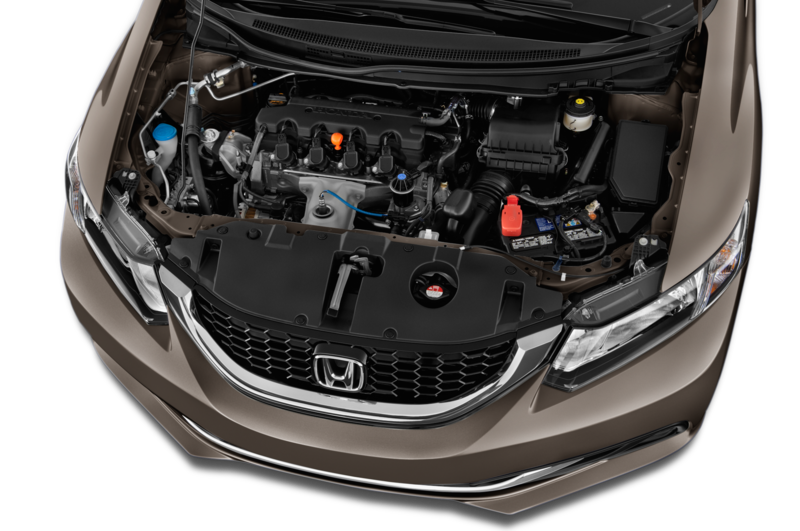 Though its bore and stroke are unchanged, the DOHC 2.4-liter four-cylinder is basically all new, and features direct injection for the first time. 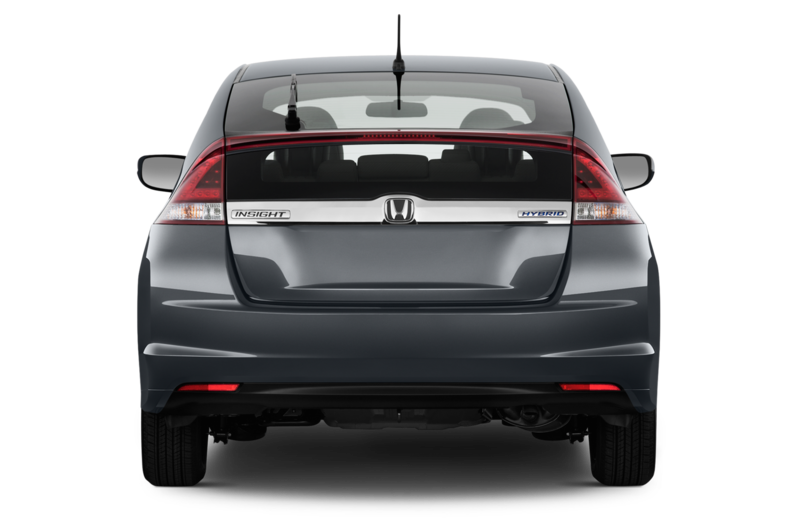 The engine’s transverse layout remains, but the exhaust has been moved to the front side of the engine for packaging reasons (like it was two Accords ago). 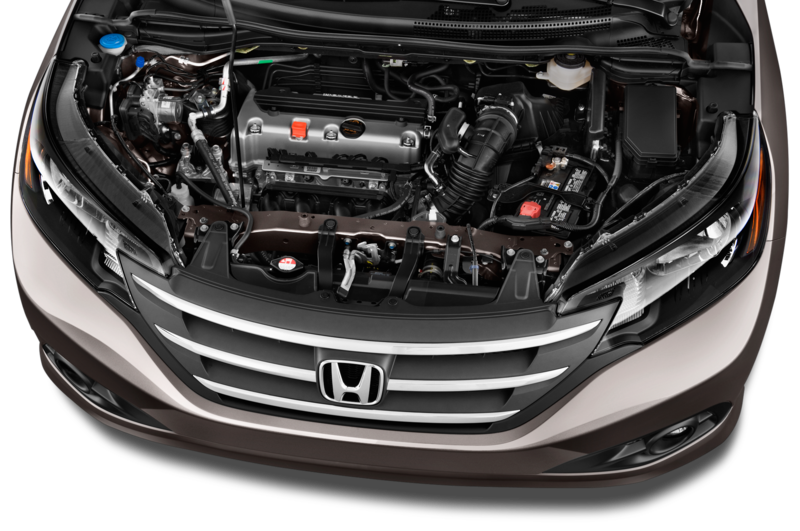 There is now only one engine calibration. 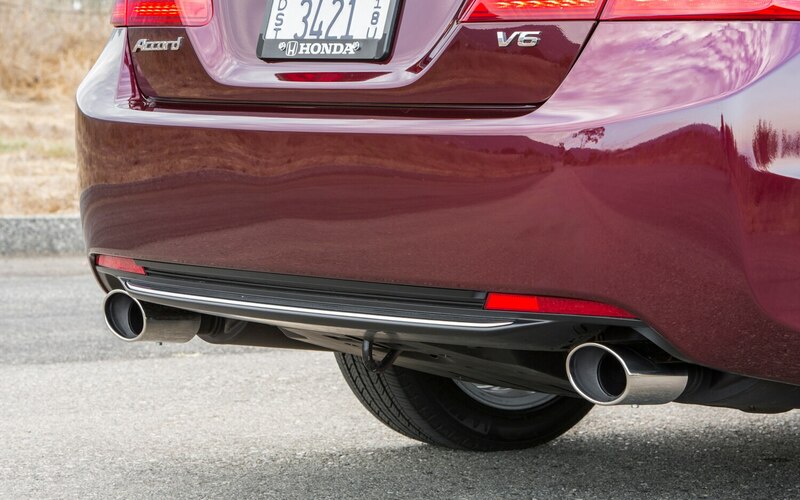 It produces 185 hp and 181 lb-ft of torque with the standard exhaust or 189 hp and 182 lb-ft with the sport exhaust — depending on which model you compare it to, that’s a slight bump or loss in power. 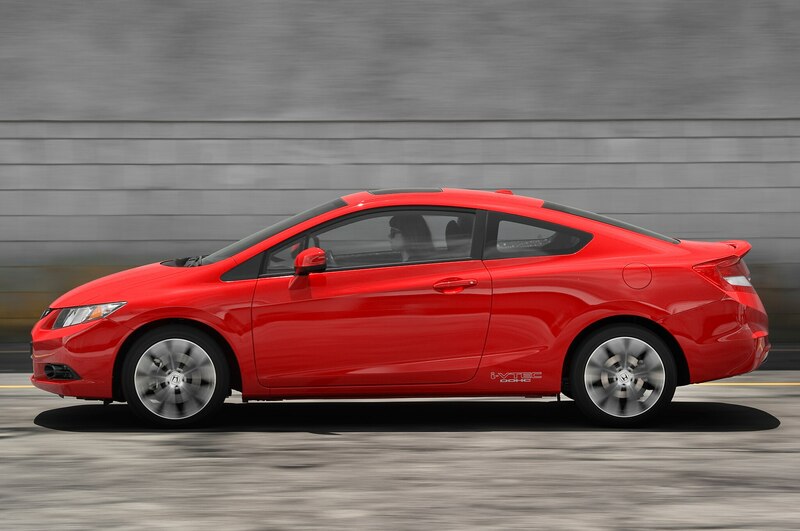 More importantly, peak torque has grown by some 20 pound-feet. 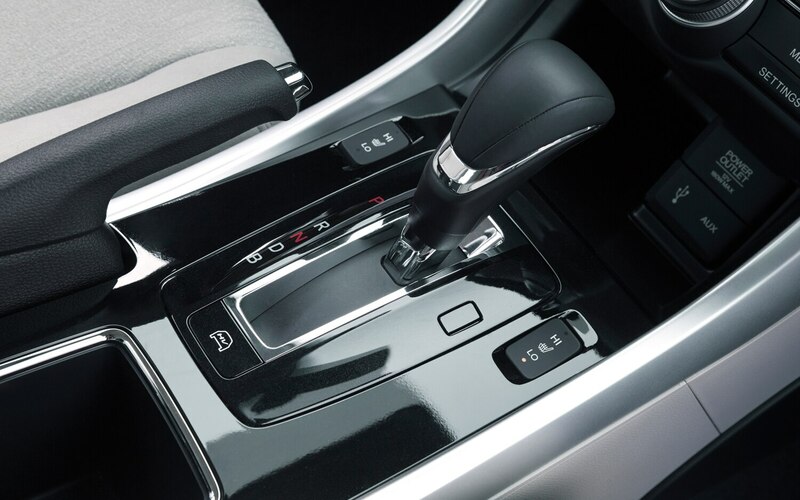 The Accord’s base transmission remains a manual, which now has six forward gears instead of five. 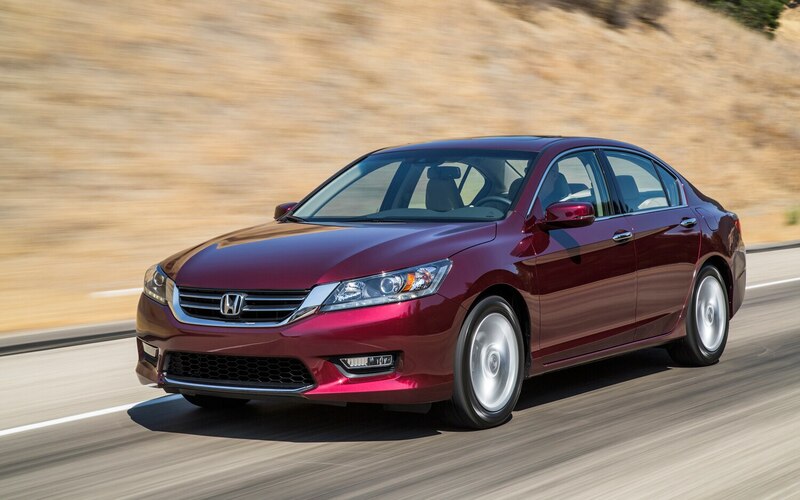 It’s a slick-shifting unit, as you’d expect, and suits this large car surprisingly well. 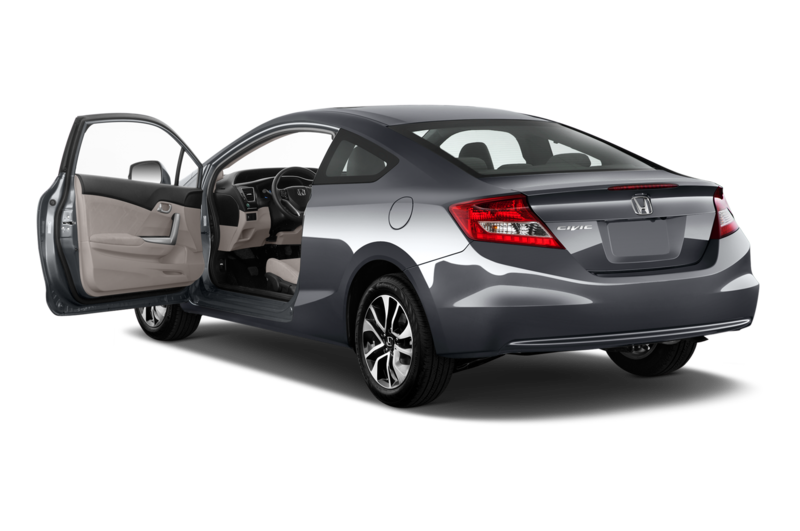 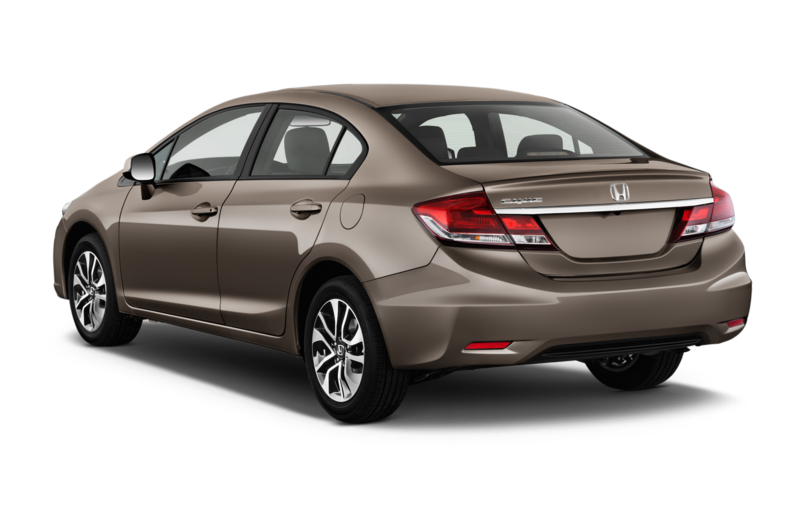 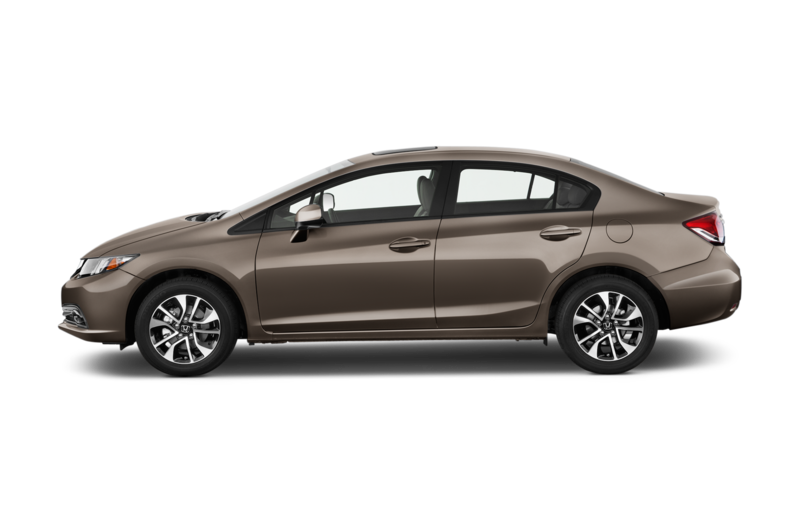 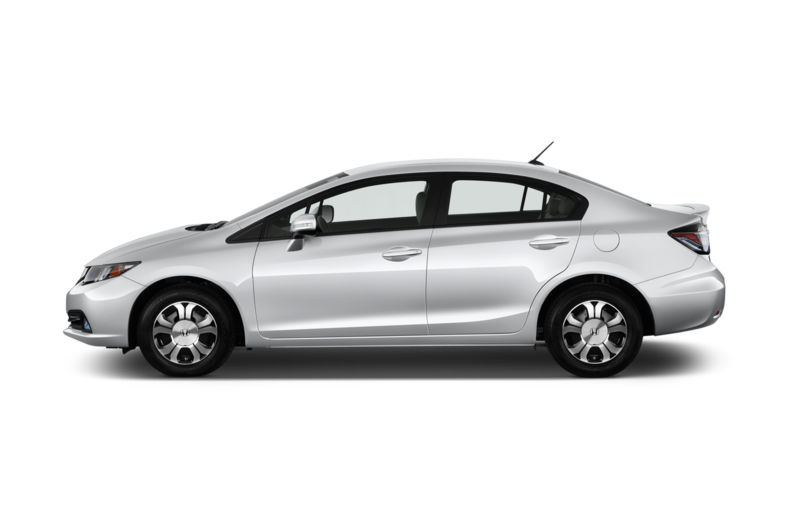 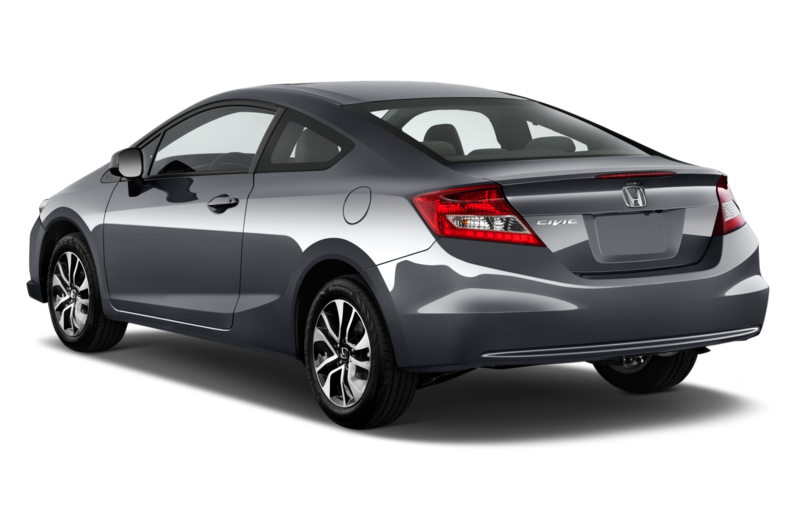 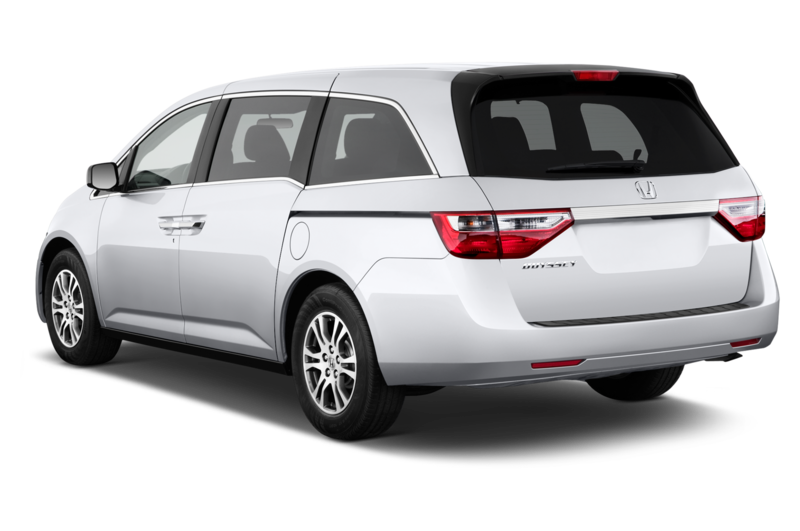 Of course, most buyers will opt for a two-pedal Accord, and the optional automatic has been replaced by a CVT — Honda’s first in this size car. 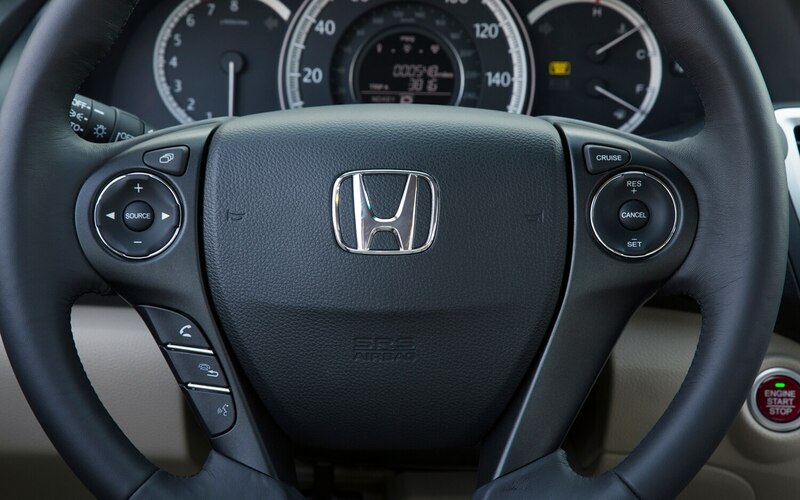 CVTs are a wonderful compromise between efficiency, smoothness, and acceleration when programmed correctly, and the Accord’s CVT is among the best. 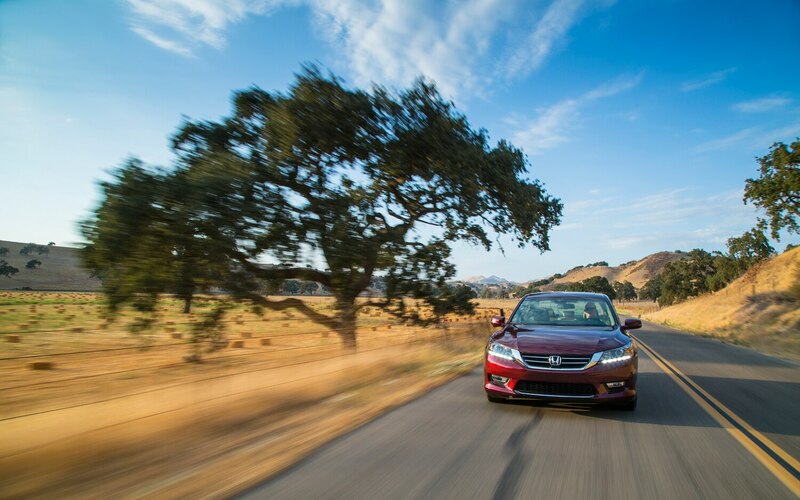 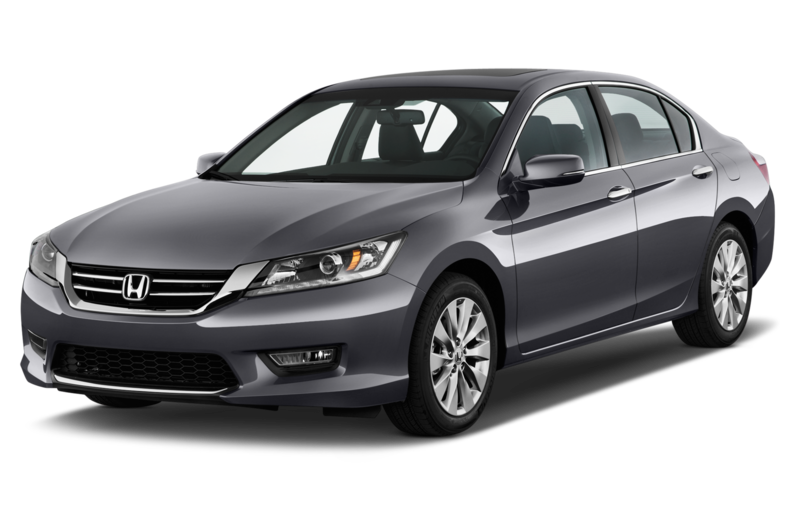 Enthusiasts will want the stick, of course, but regular Accord buyers will love the CVT’s shiftless operation, and will be subjected to underhood mooing only when driving in a manner unbecoming to… well, Accord drivers. 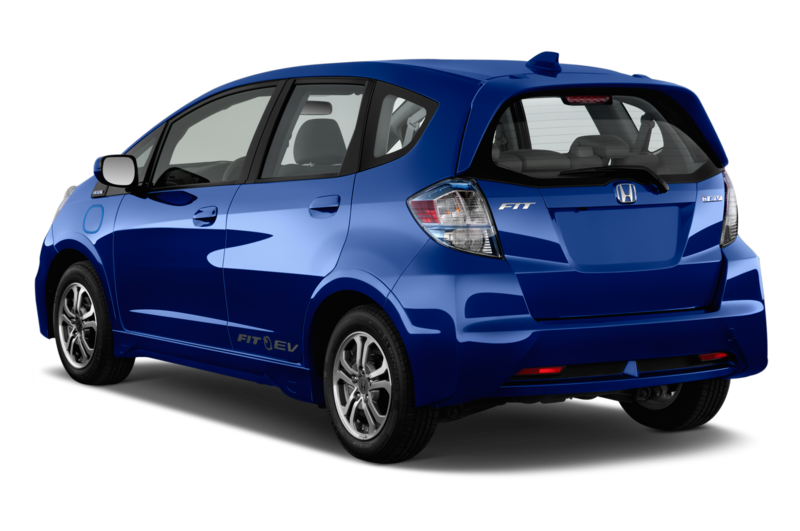 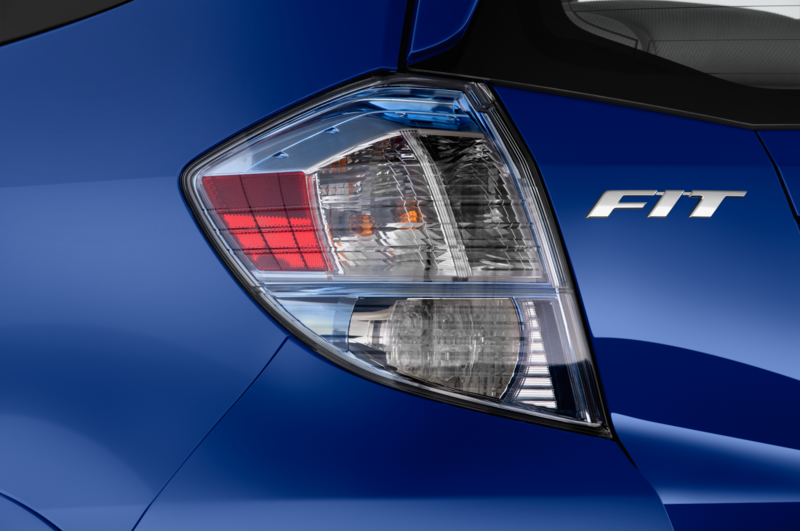 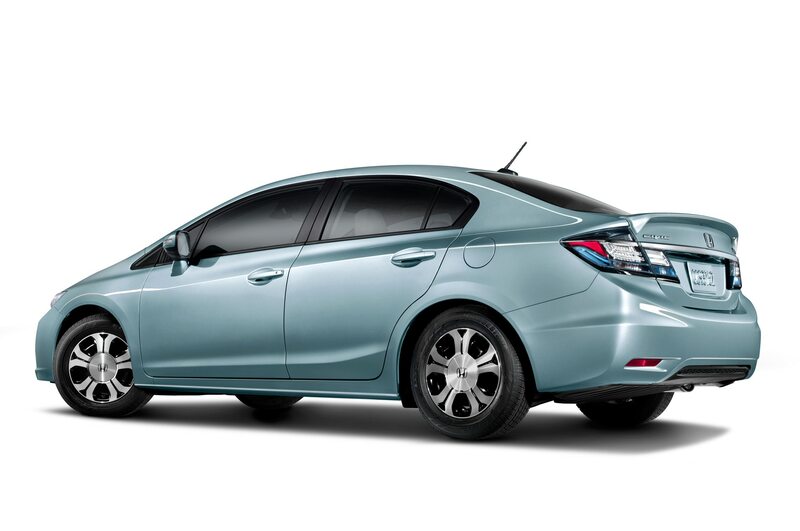 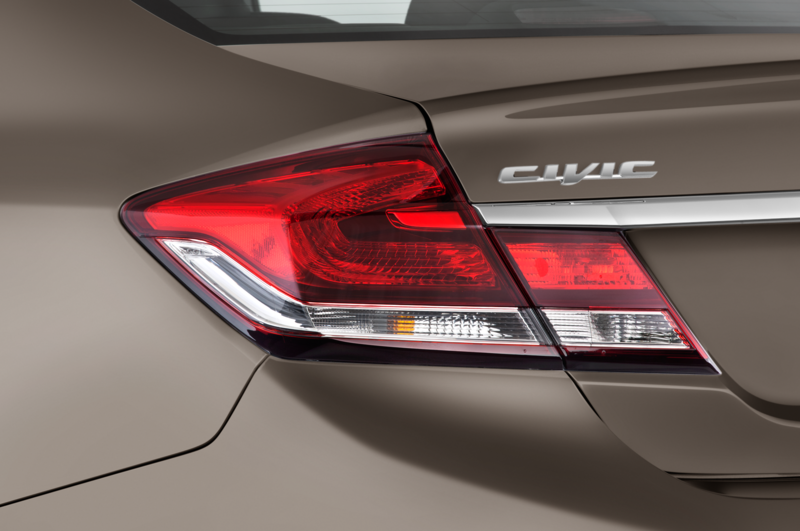 EPA city/highway ratings soar to 27/36 mpg with the CVT and 24/34 mpg with the stick. 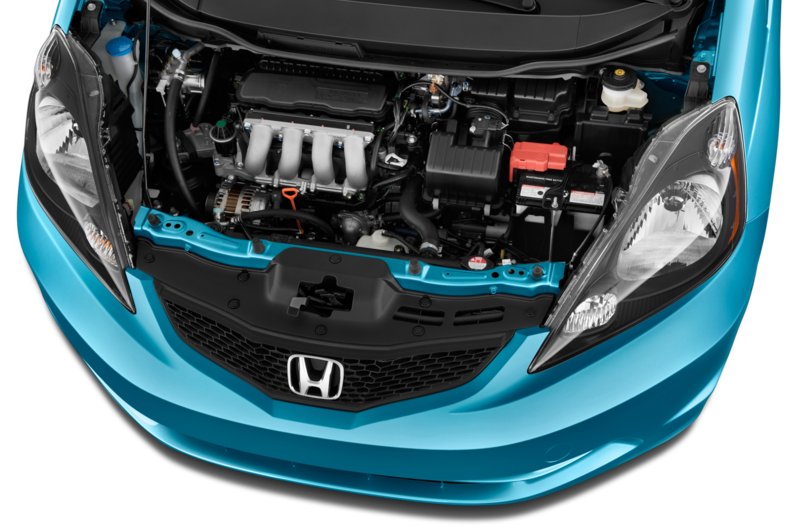 Bucking the turbo trend, Honda has wisely stuck with its optional V-6. 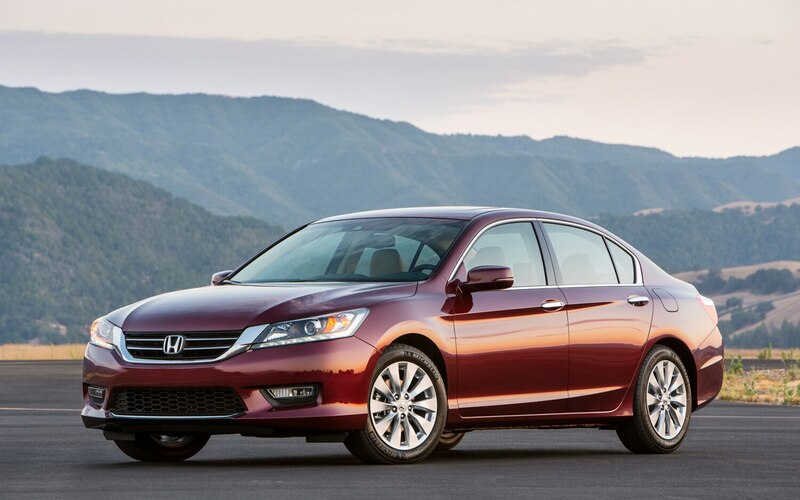 The company stresses that its V-6 customers just plain want a six-cylinder under the hood, so Honda has fitted the Accord with a revised version of the corporate SOHC 60-degree 3.5-liter. 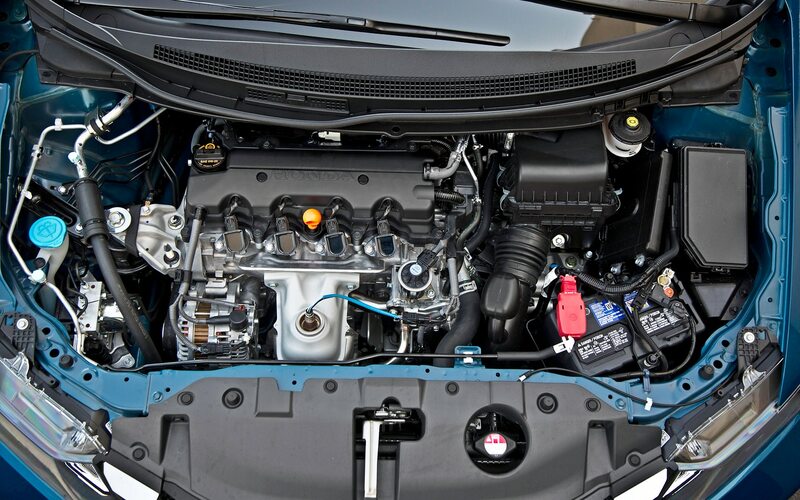 It doesn’t use direct injection, but the V-6 does have a new version of iVTEC that can not only switch between high and low cam lobes, but on the rear bank of cylinders, can keep the valves closed completely. 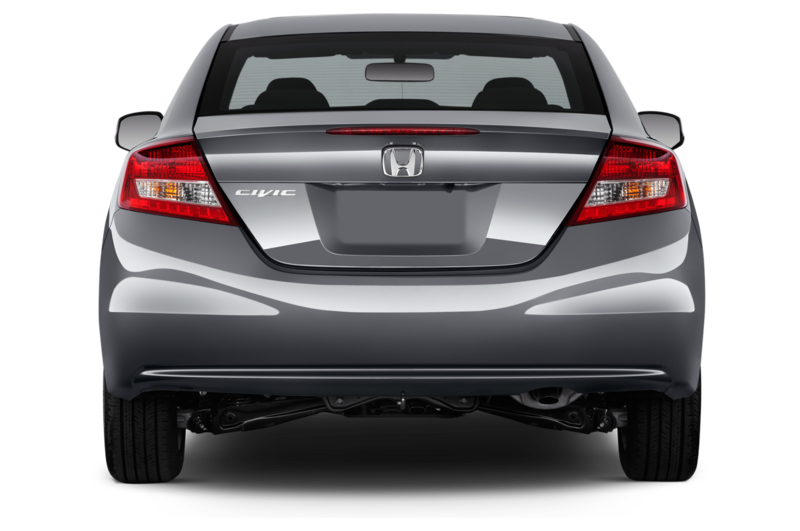 This makes it the first Honda V-6 that has both VTEC and VCM (variable cylinder management) — that latter available only with the automatic transmission. 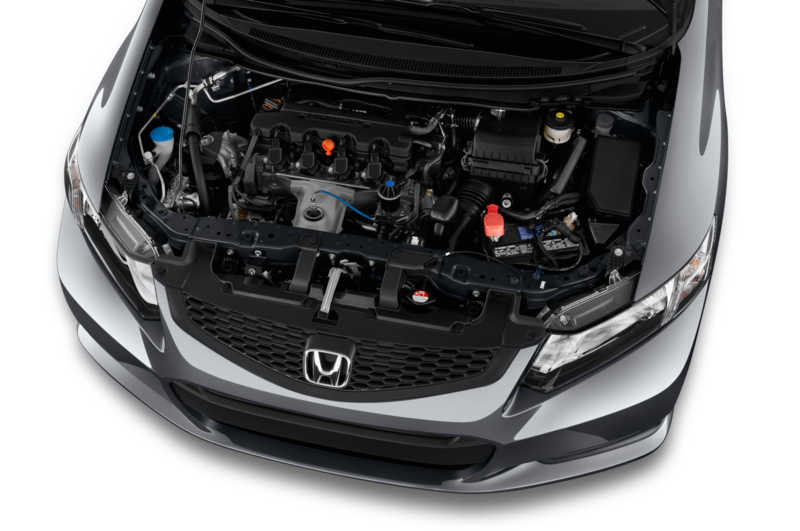 Gone is the last engine’s ability to run on 4 cylinders — the new engine can run on either 3 or 6. 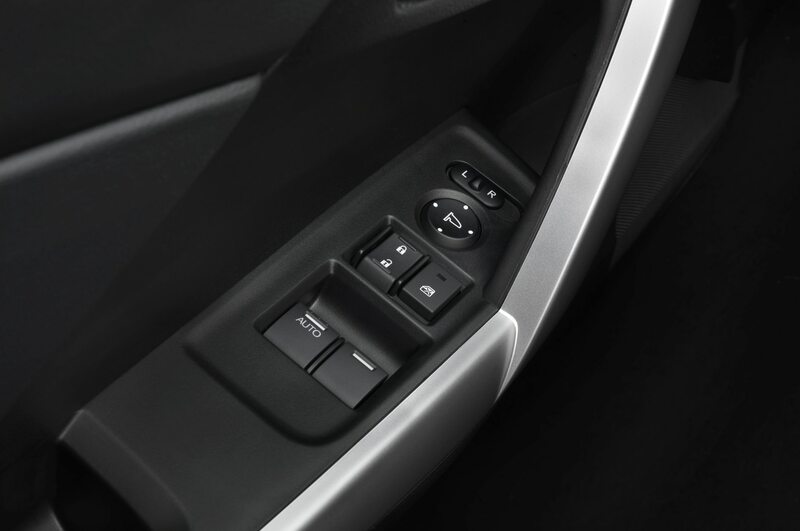 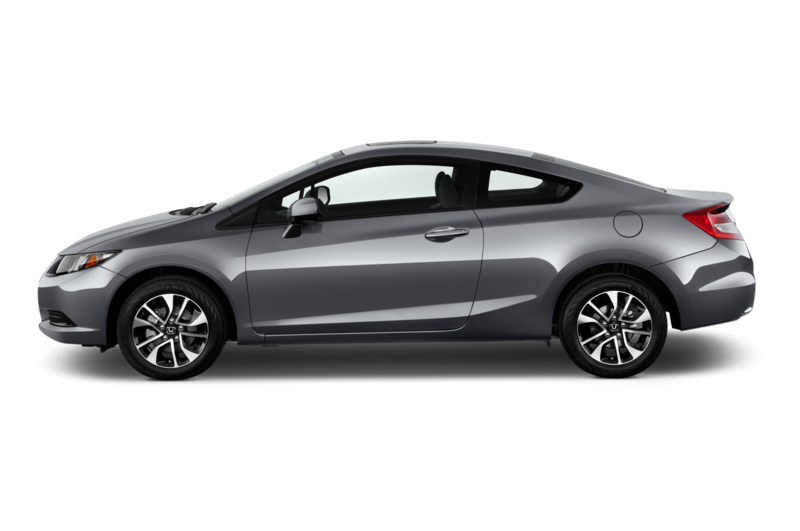 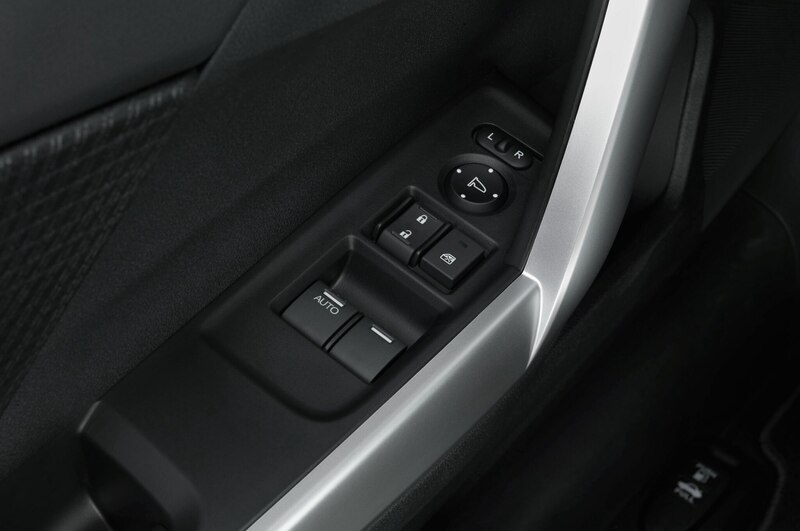 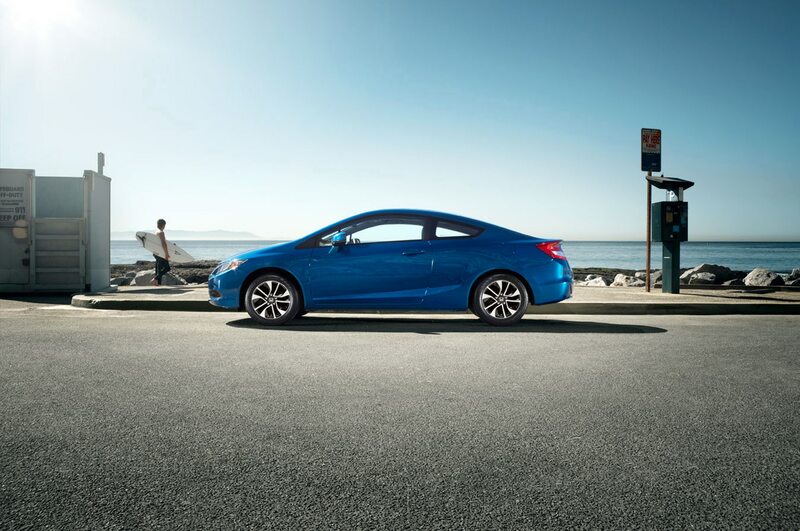 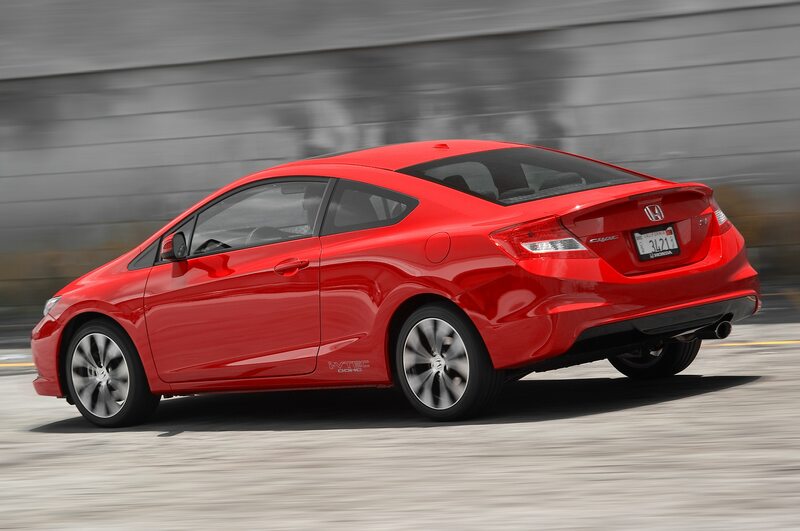 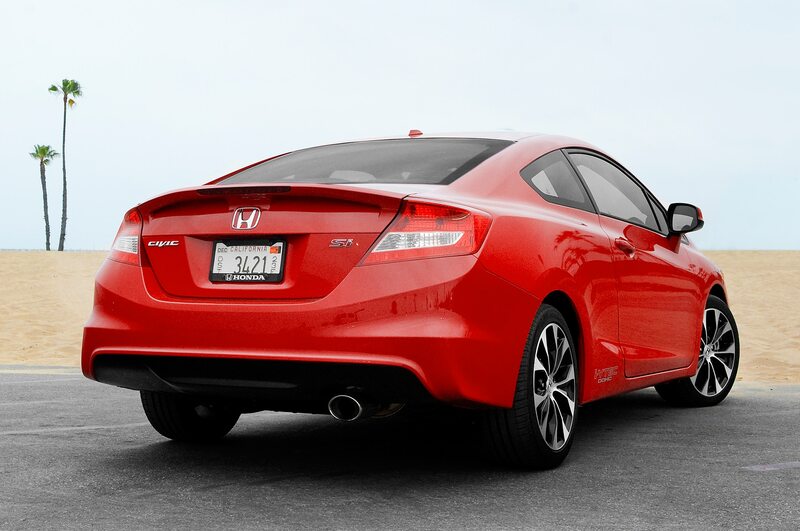 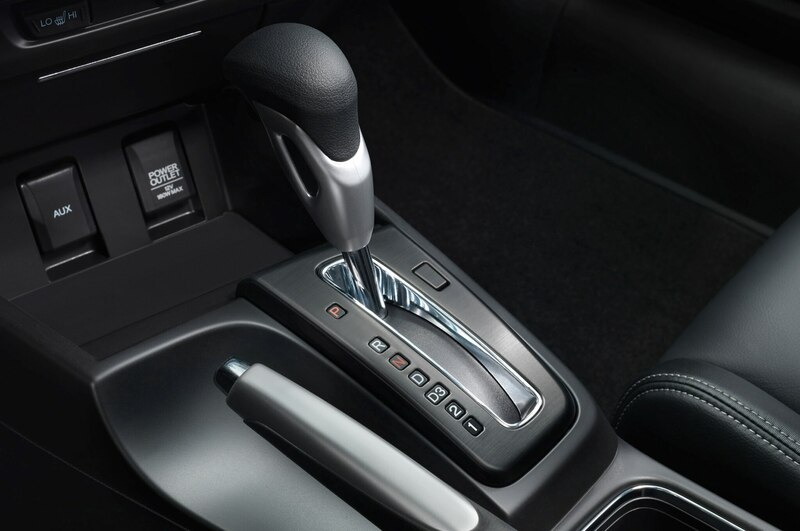 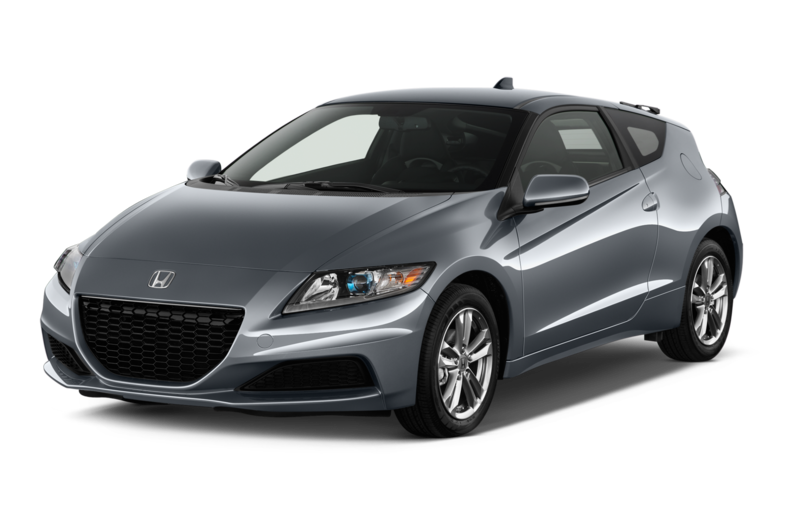 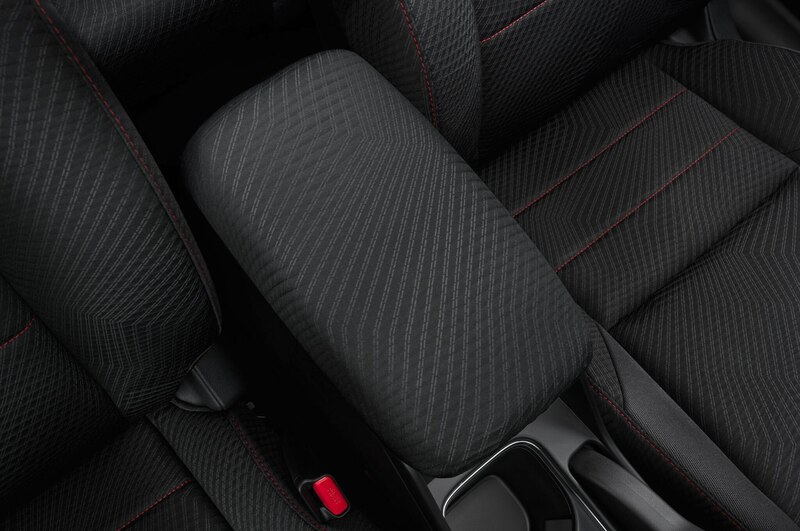 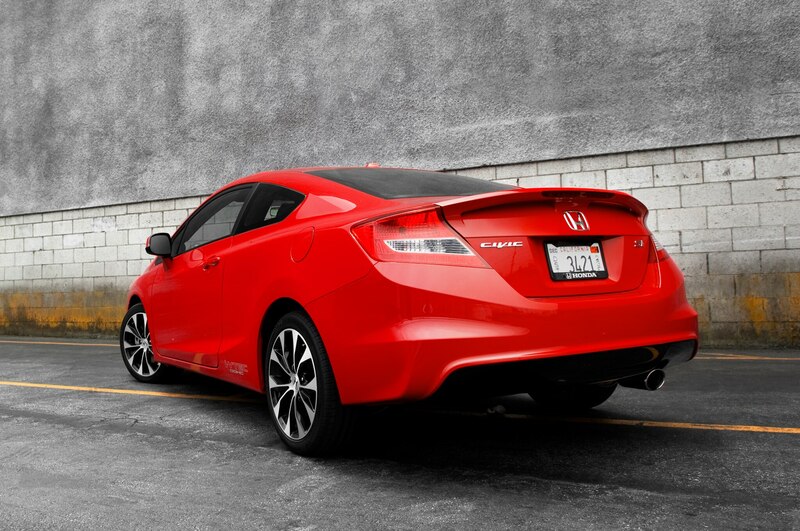 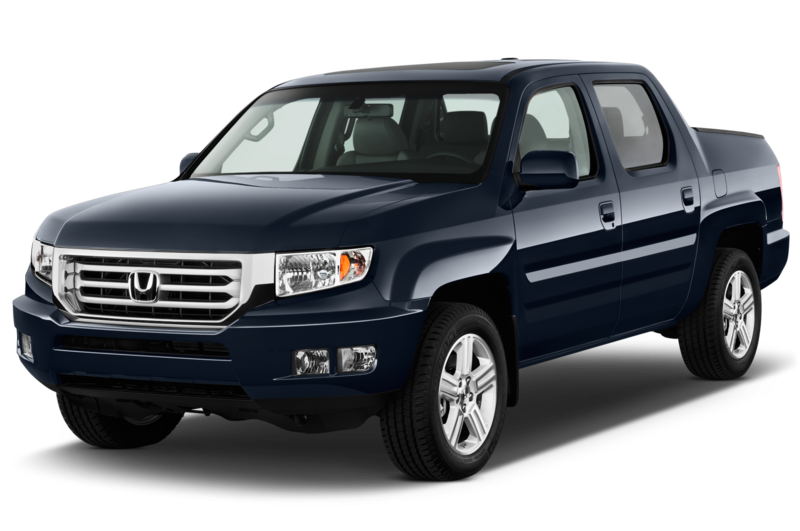 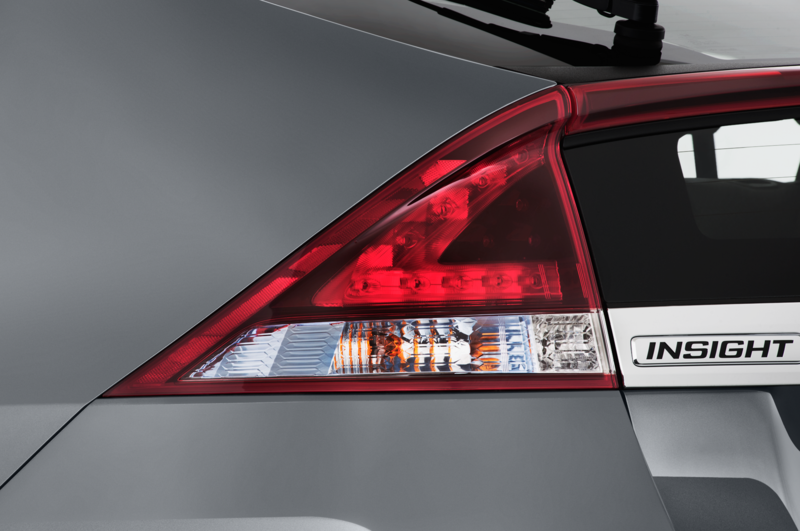 A non-VCM version of the V-6 is available with a six-speed manual transmission in Accord Coupe models. 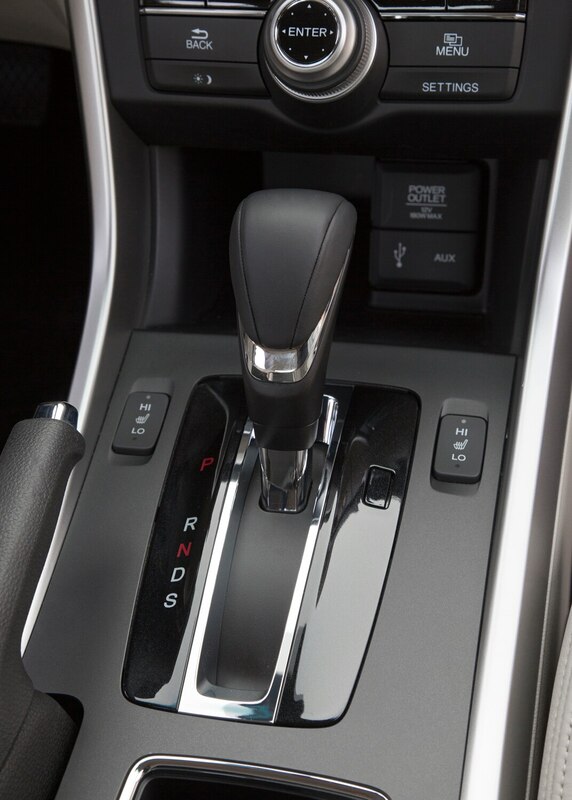 Otherwise, six-pot Accords use a new six-speed automatic, up a gear from last year. 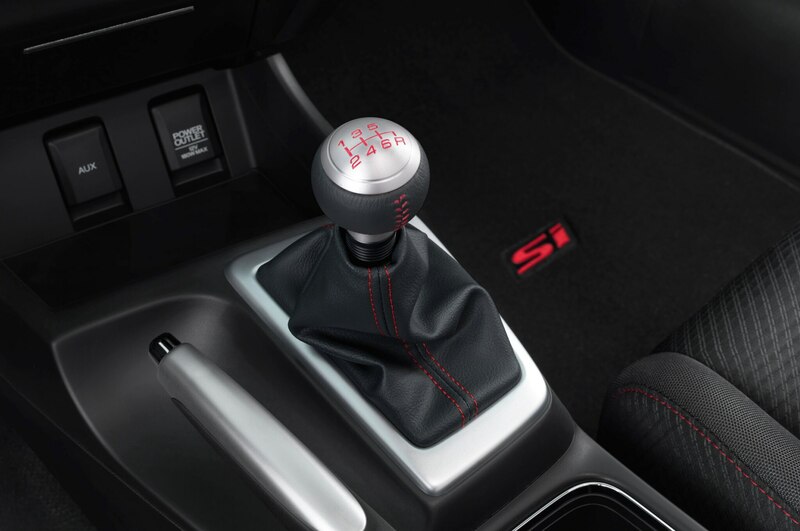 The automatic suits the engine far better than the stick, though it occasionally fumbles upshifts and doesn’t rev-match on downshifts in sport mode. 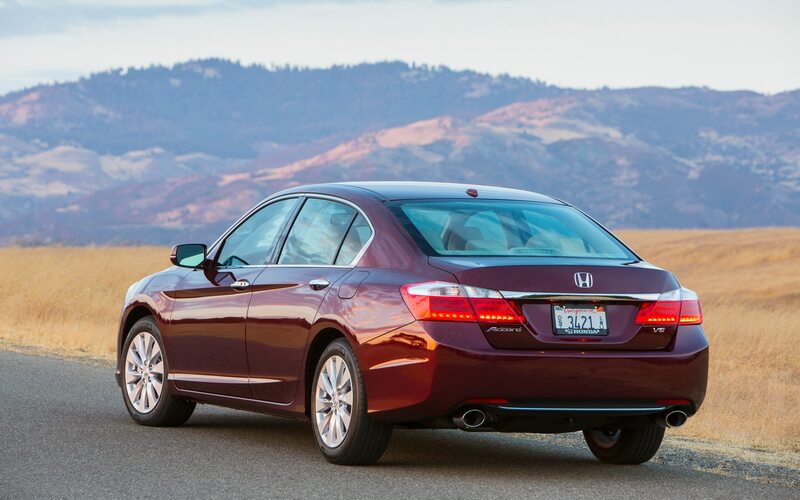 Despite the traction issues inherent in a heavy, front-wheel-drive car, the Accord tends to encourage bad behavior, mostly because of how good the V-6 sounds. 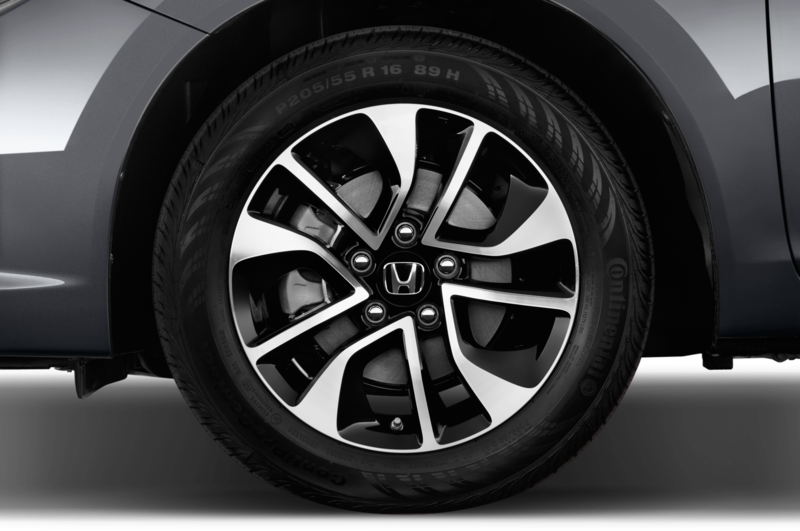 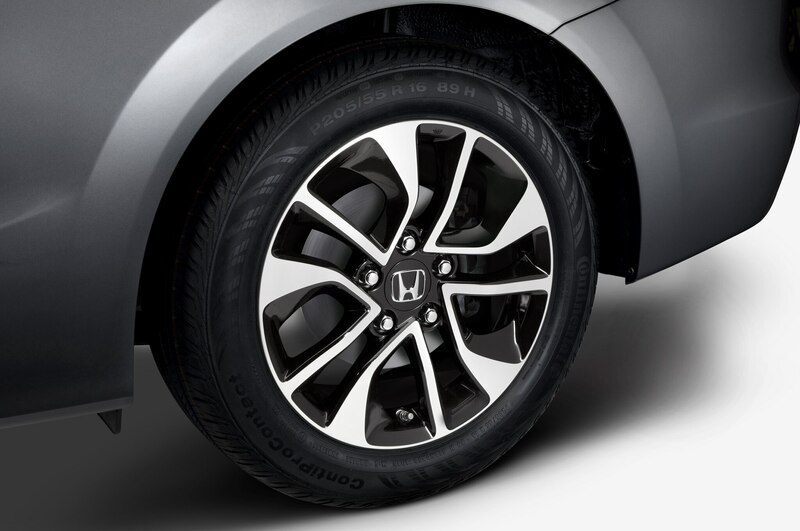 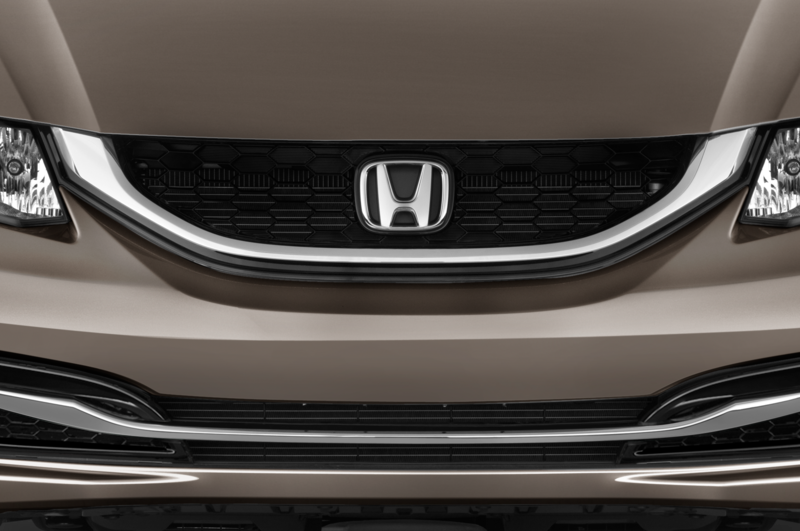 In place of the Accord’s traditional control-arm front suspension is a new strut-type arrangement that, according to Honda, is not only lighter but offers better NVH performance. 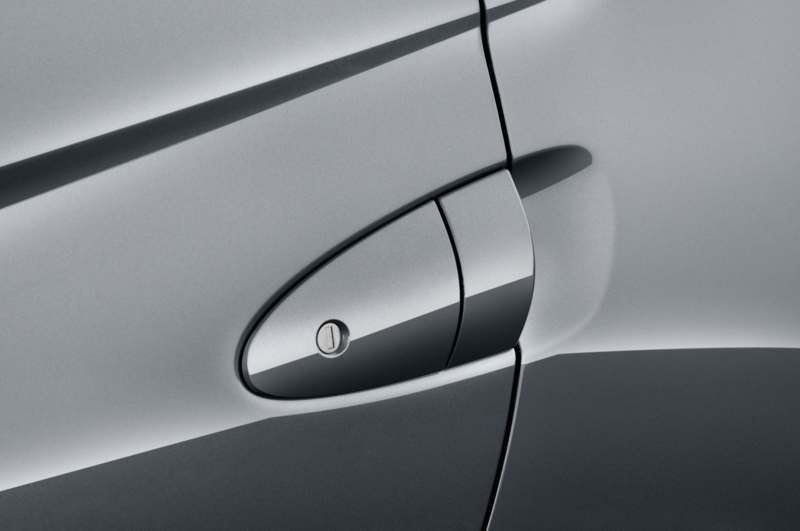 There was some groaning about this during the technical presentation (as there was when the Civic switched to a strut front suspension several years ago), but we’d like to point out that the Porsche Boxster uses strut suspension all around. 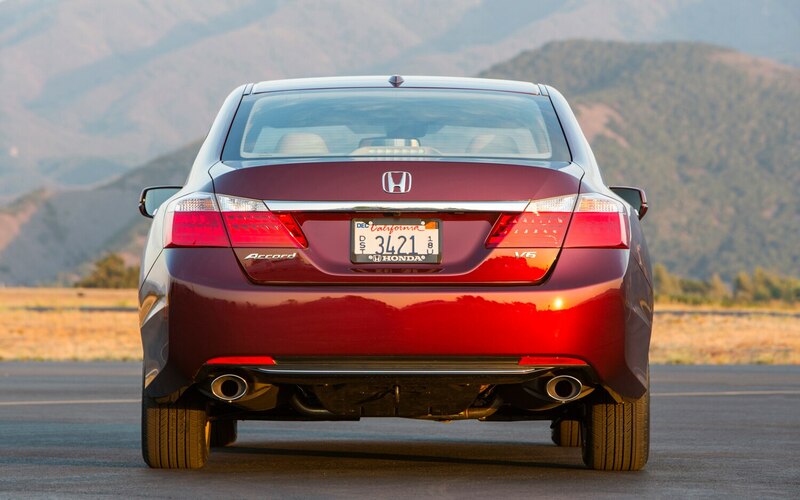 When done properly, struts can be made to do wonderful things. 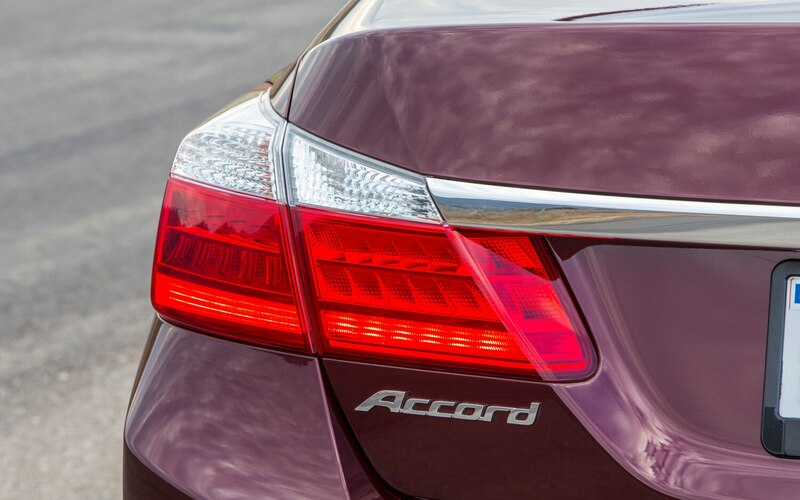 Unfortunately, the kind words don’t extend to the EPAS in the Accord V-6. 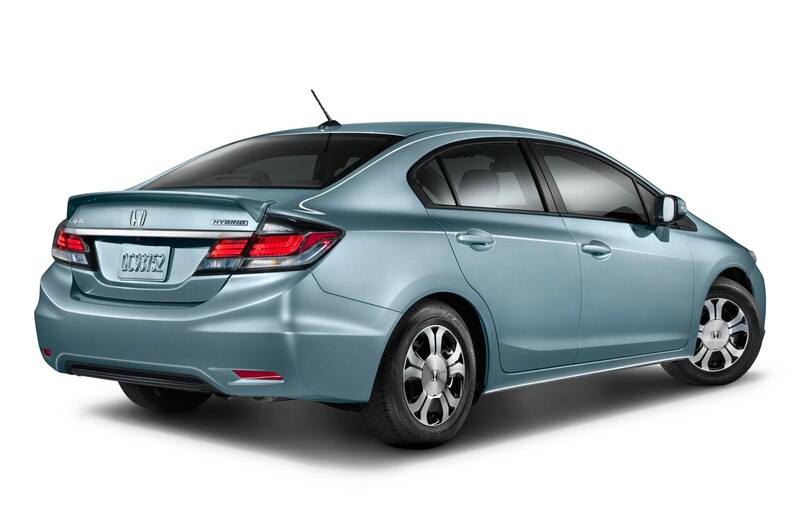 With an assist motor mounted on the rack for packaging reasons (rather than the pinion-mounted motor on four-cylinder models), the Accord V-6’s steering is, by comparison, dreadful. 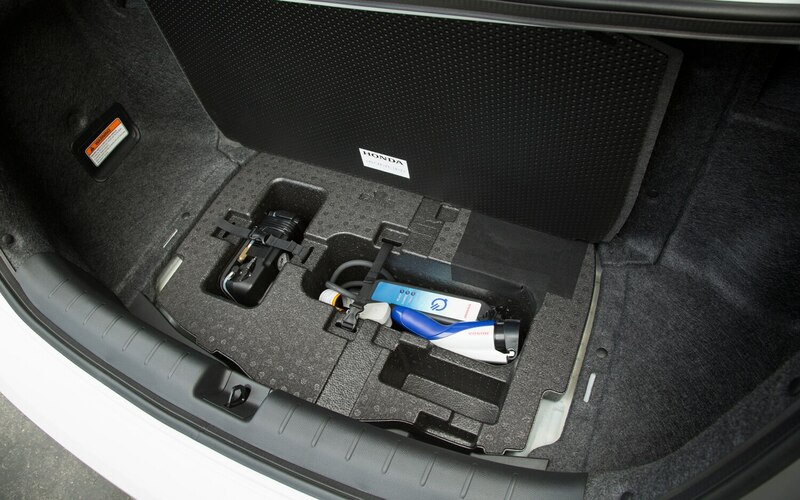 It isolates the driver far better from torque steer than last year’s hydraulically assisted system, but the programming is in need of a major revision. 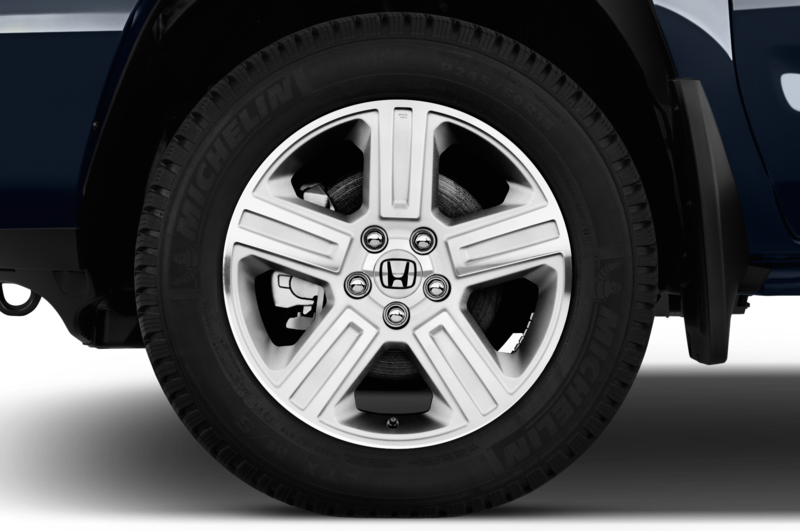 Effort seems to change on a whim, and in quick transitions, the system continues to want to turn the wheel after you’ve stopped. 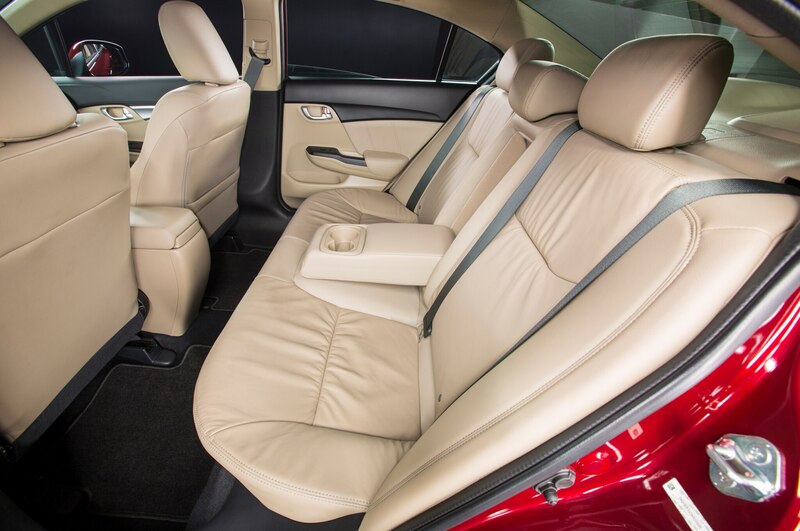 Owners of the old Accord will feel like they’ve landed in a luxury hotel the second they slip into the new interior. 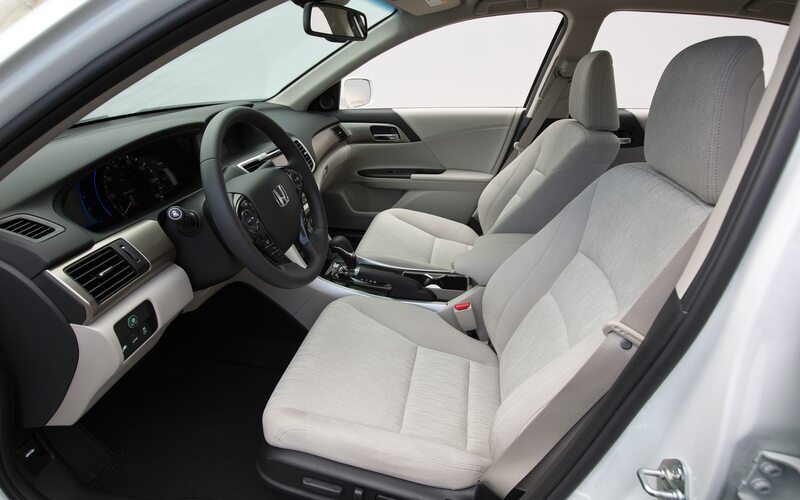 The seats — previously rock-hard and unsupportive — are now soft and coddling. 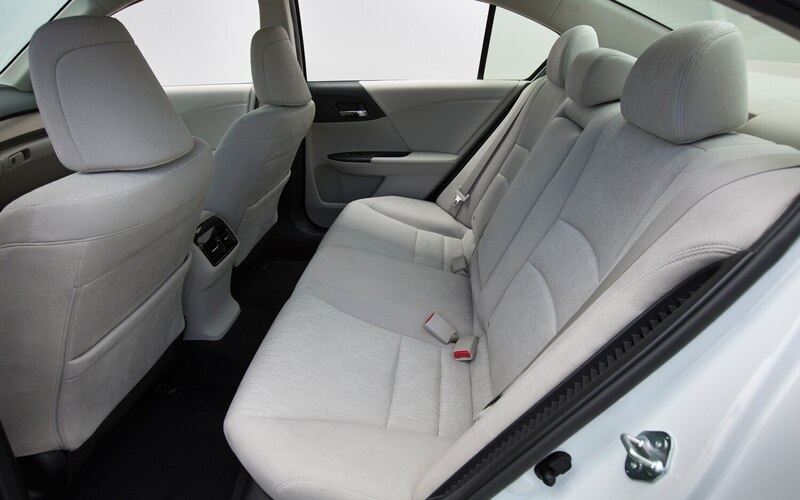 The cabin no longer smells like a wet dog, and all interior materials appear richer. 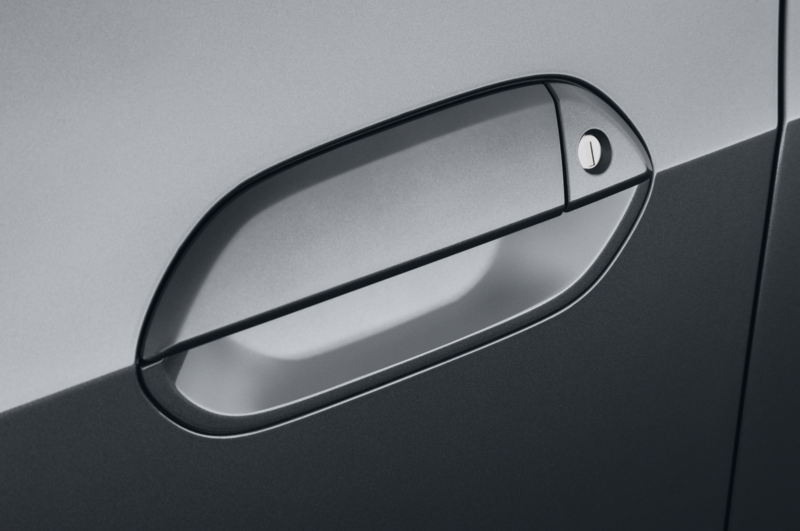 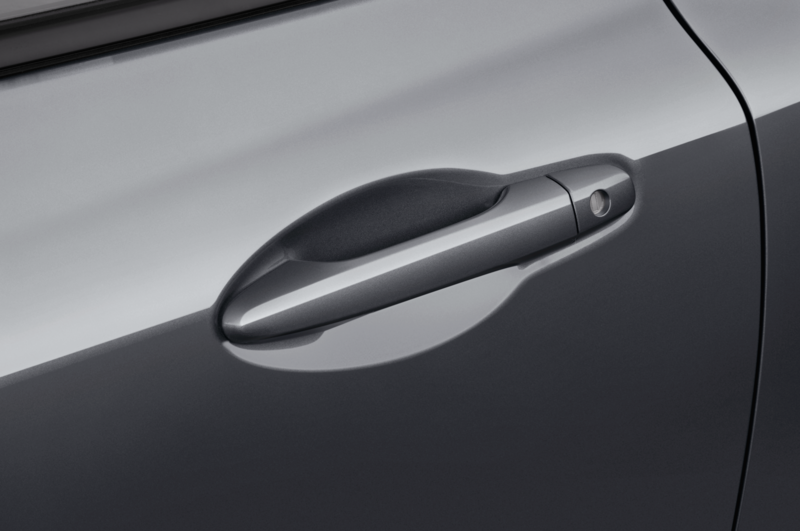 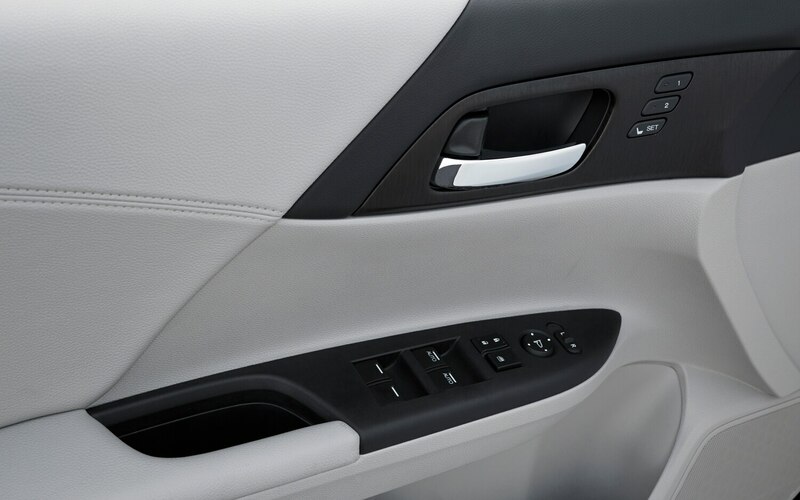 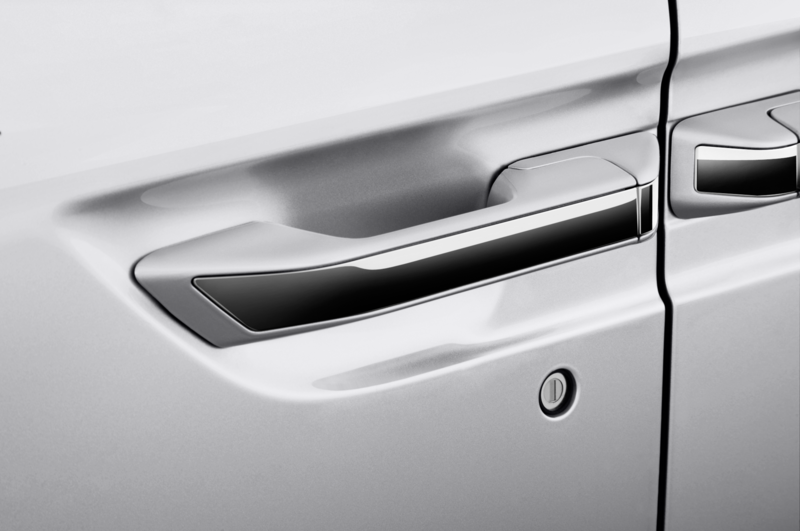 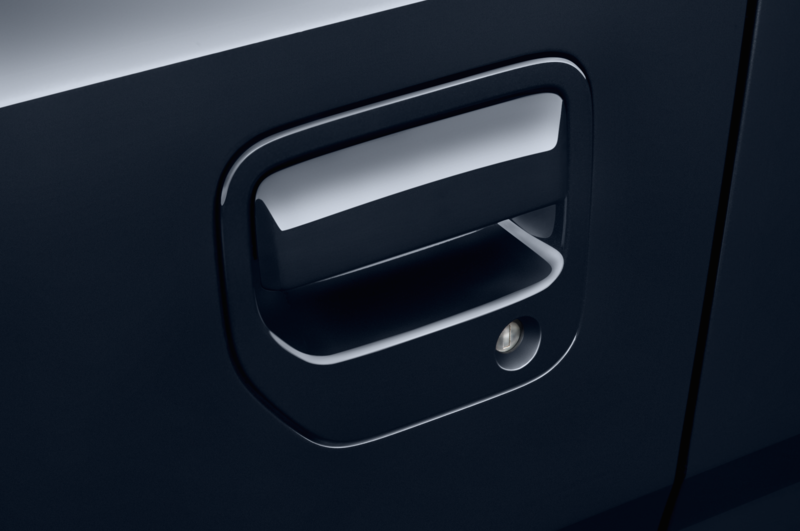 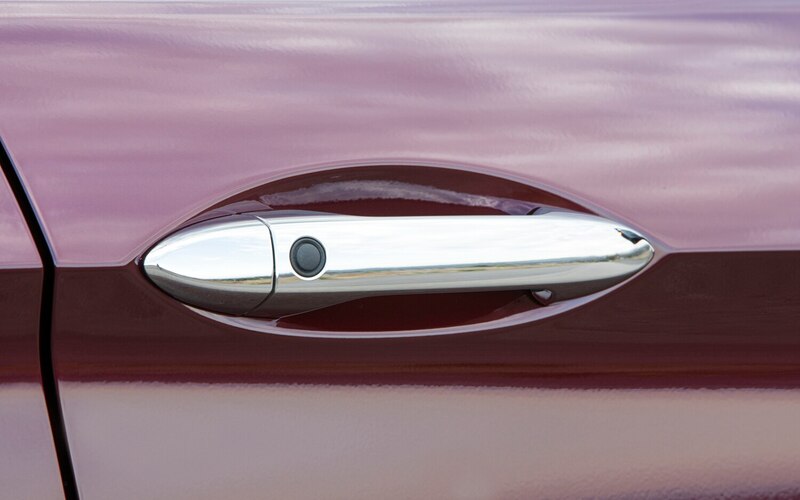 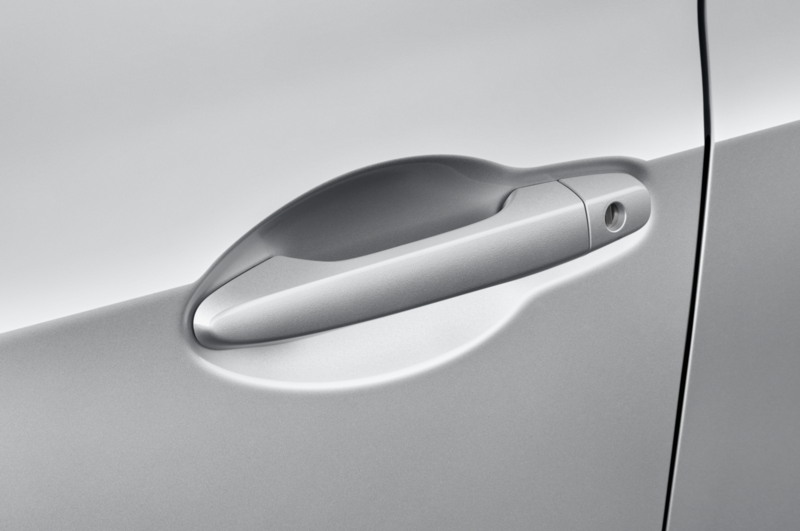 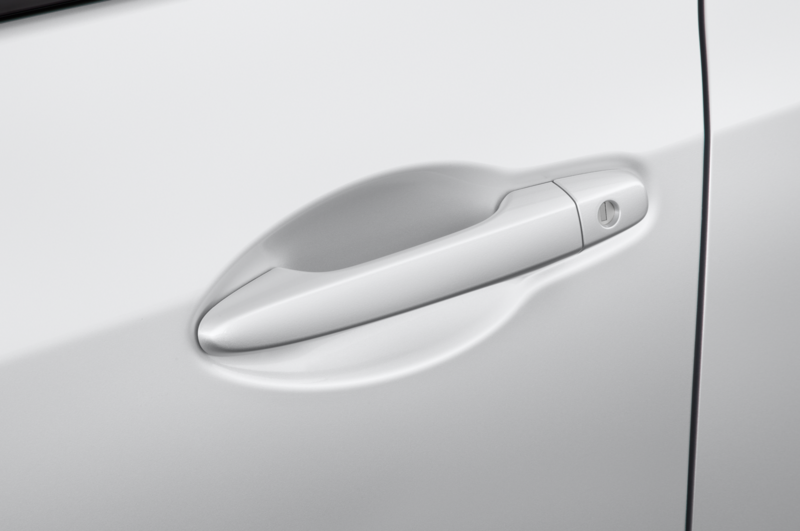 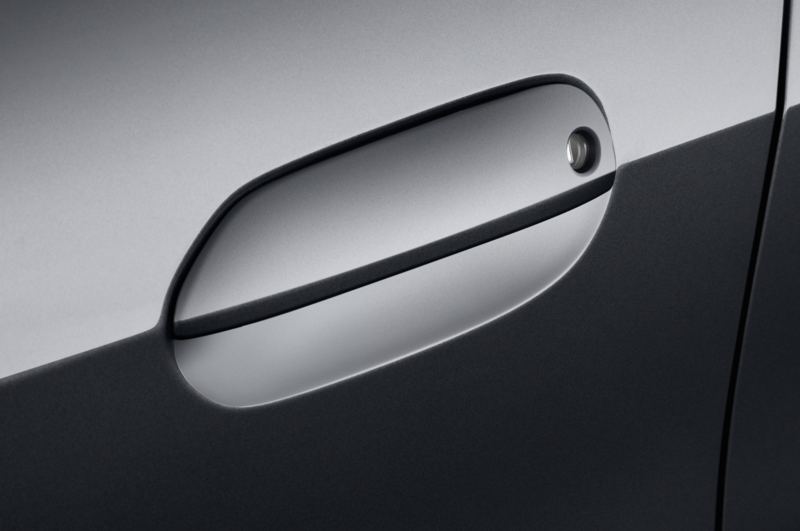 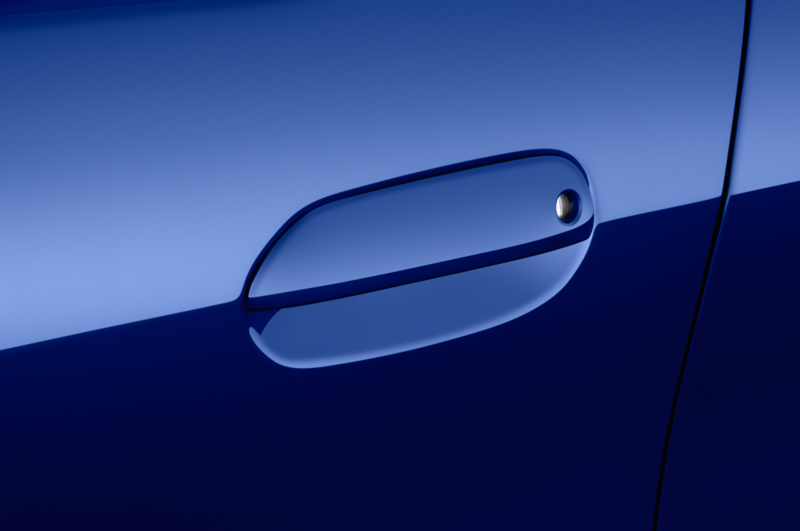 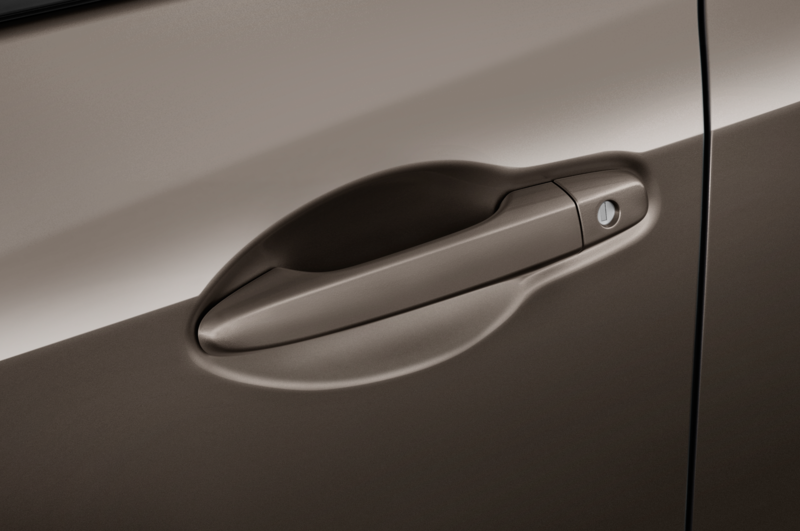 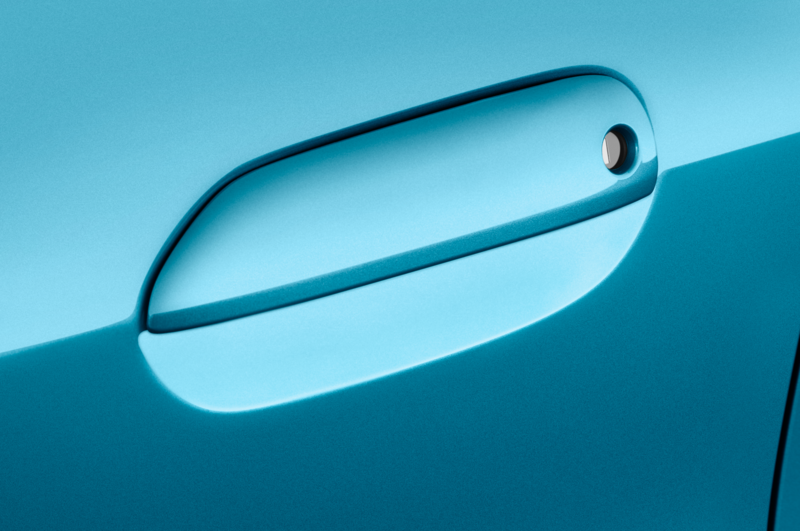 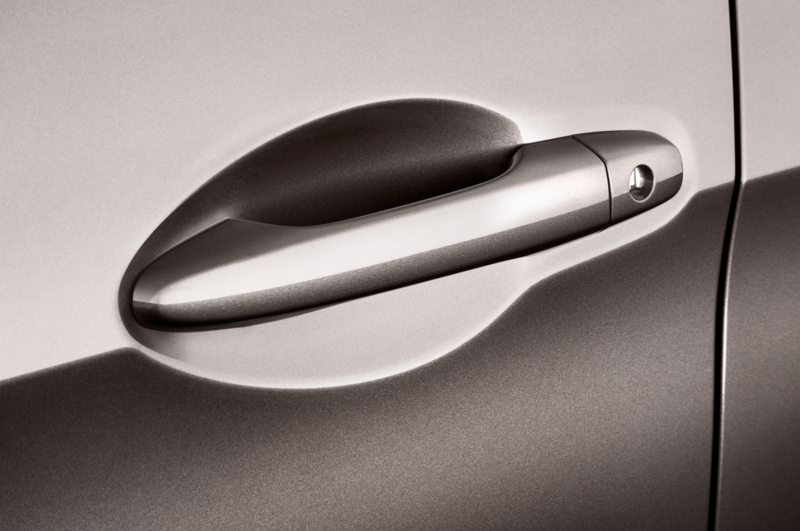 Simple pleasures abound, like the positive feel of the interior door handle: you can actually feel the point at which it disengages the latch. 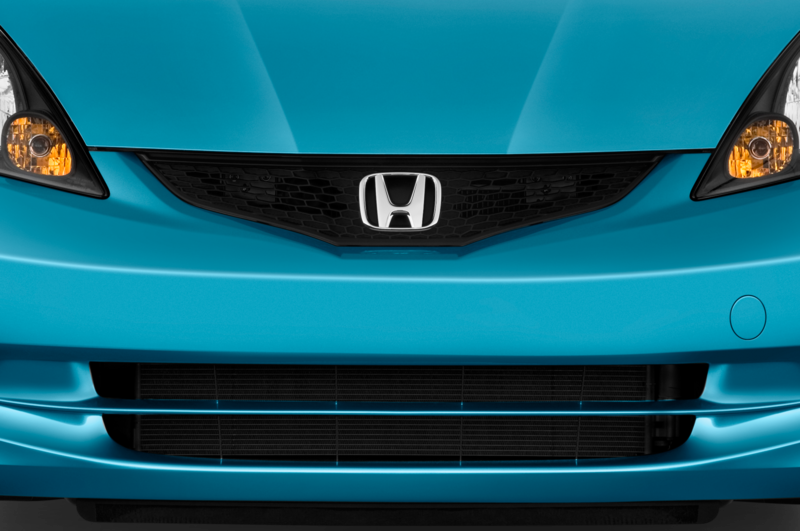 Such a wonderfully Honda touch, that. 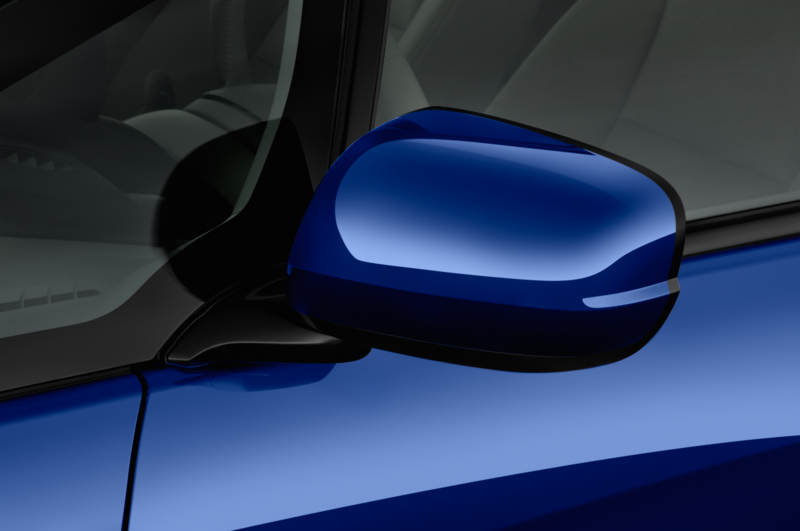 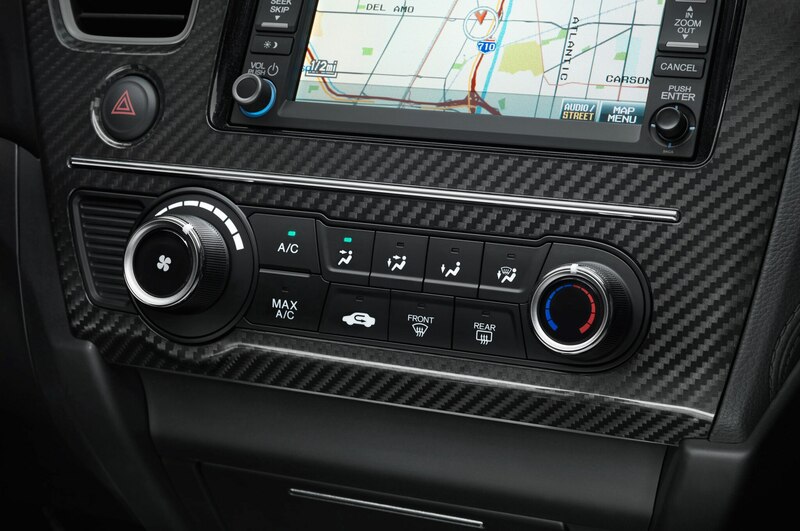 Material foibles are limited to a high-gloss black trim plastic that, thanks to glitter in its finish, looks dusty when it’s not, and a chrome bezel on the shifter that distractingly reflects sunlight. 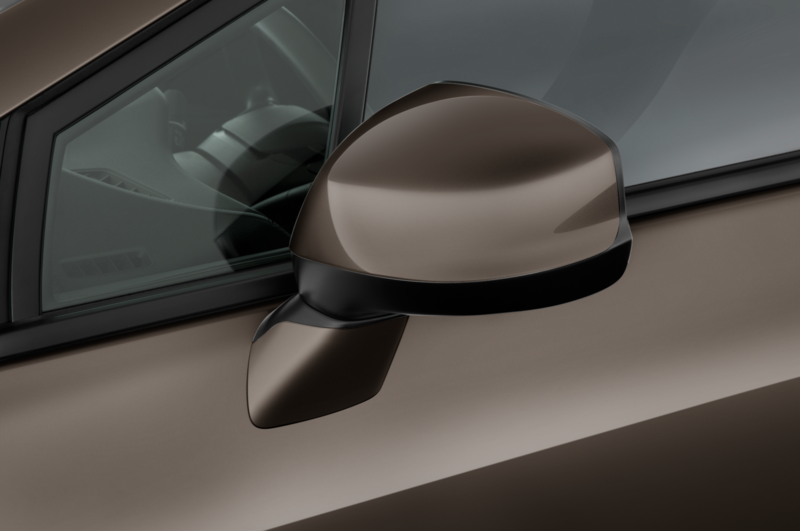 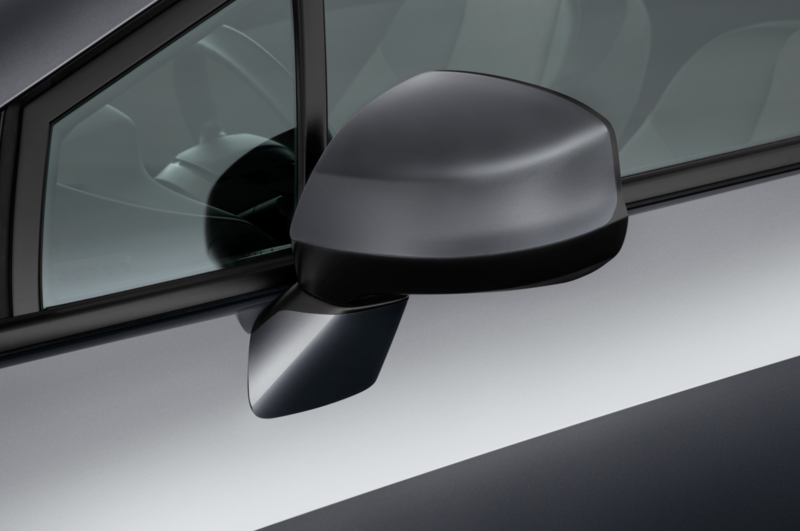 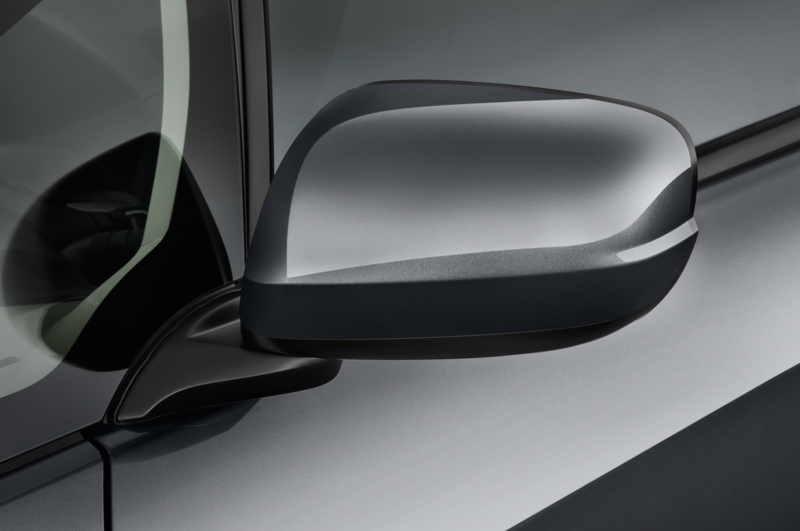 The horn sounds great — and you can actually give a quick toot, unlike some cars, which will allow either nothing or a half-second obnoxious “Get Out Of My Way!” The wiper arms are thick and meaty, and articulate to cover a very big portion of the windshield. 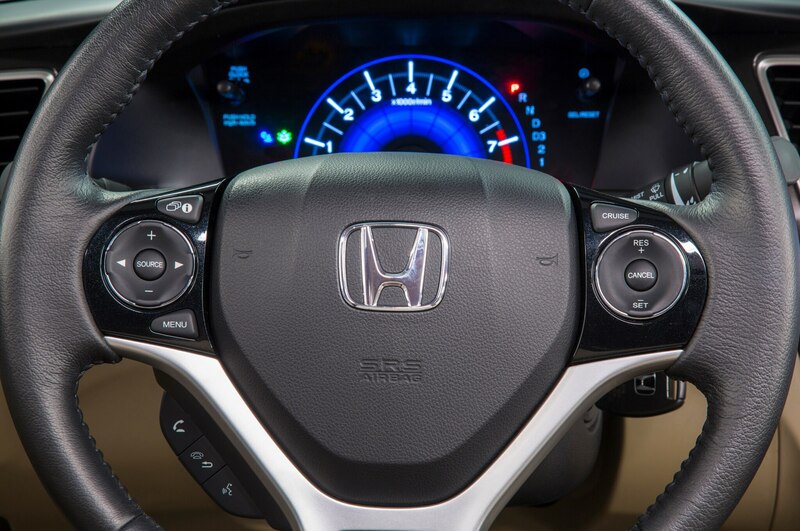 The gauges are clear and legible, and the steering wheel is well shaped. 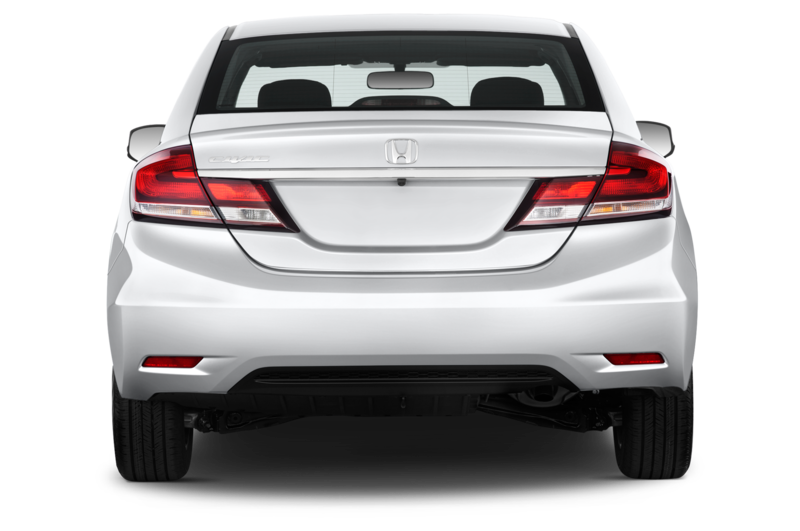 The 2013 Accord’s center stack is dramatically less complicated than the old one, which looked like someone sneezed at it with a mouthful of buttons. 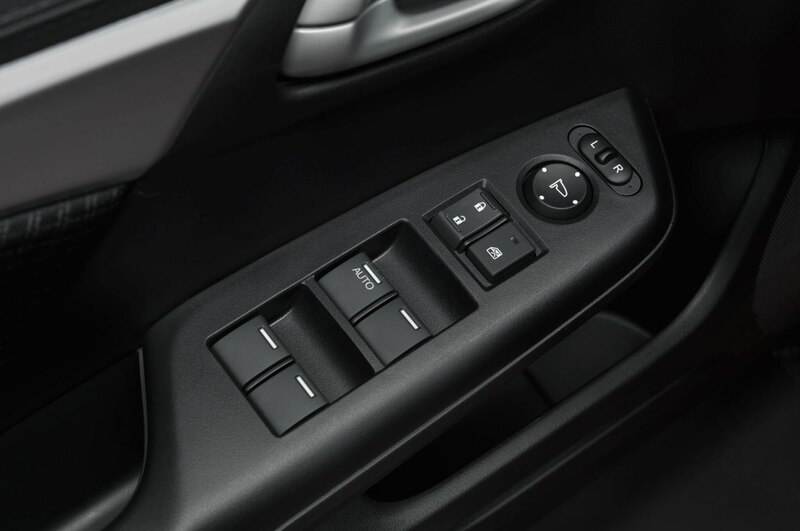 HVAC controls are mercifully separated into their own, clearly delineated panel. 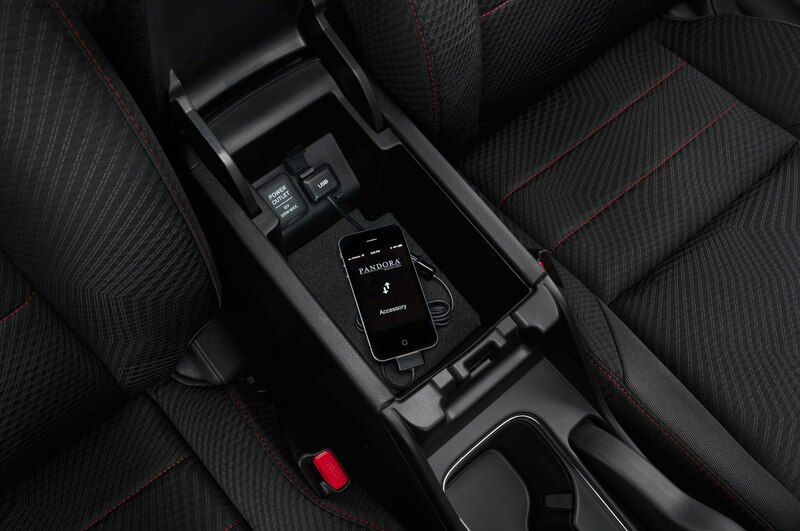 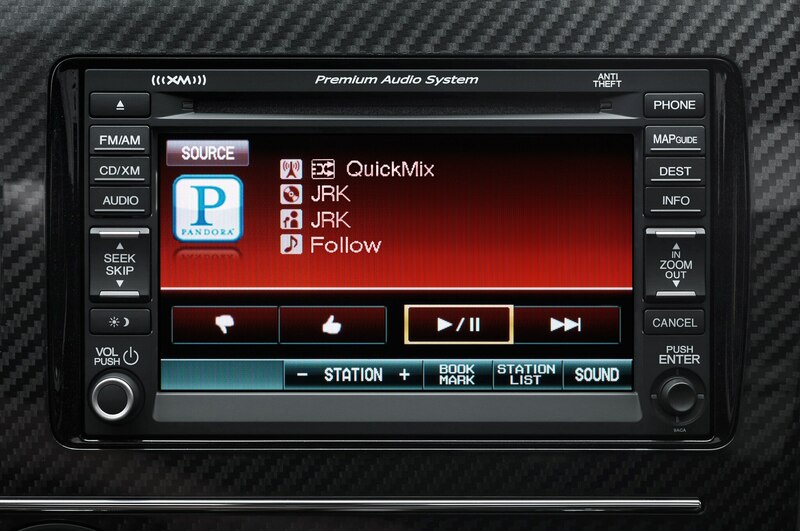 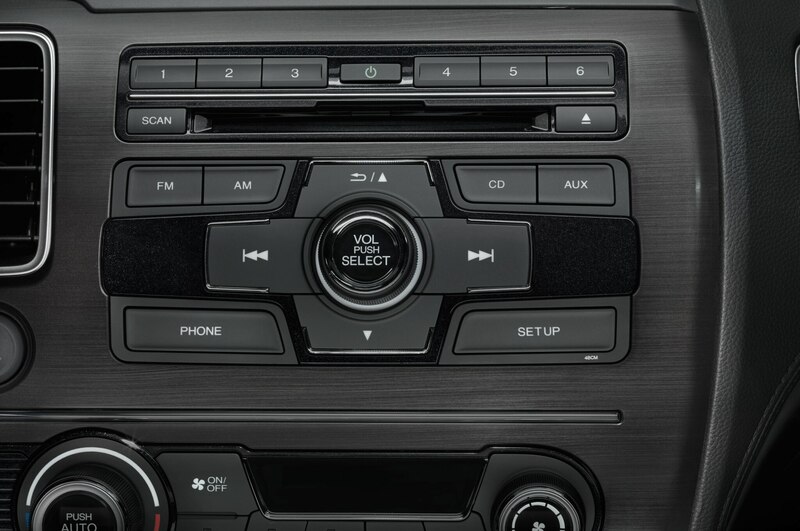 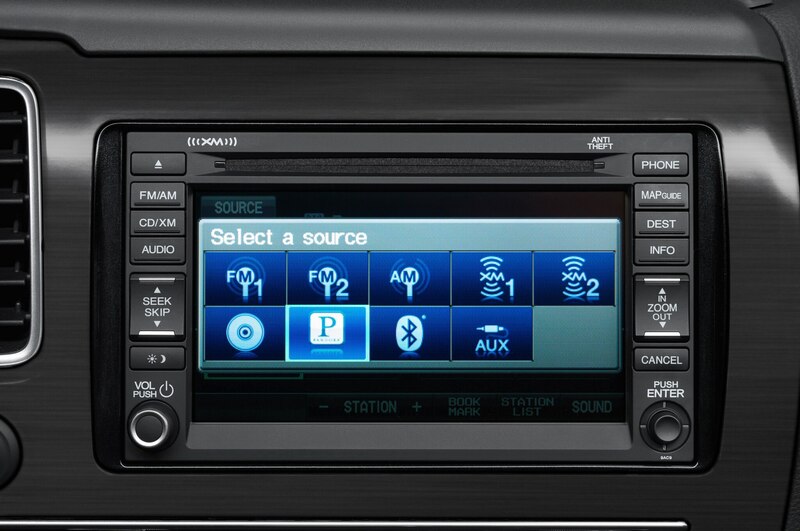 All of the radio controls are logically arranged and easy to use. 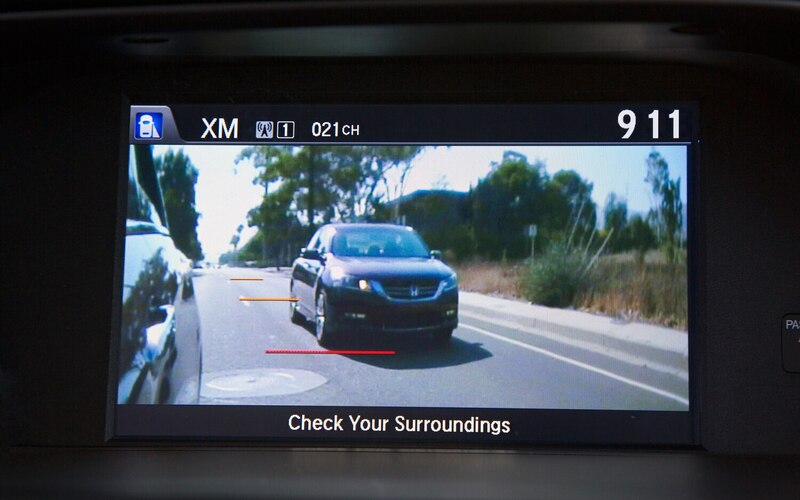 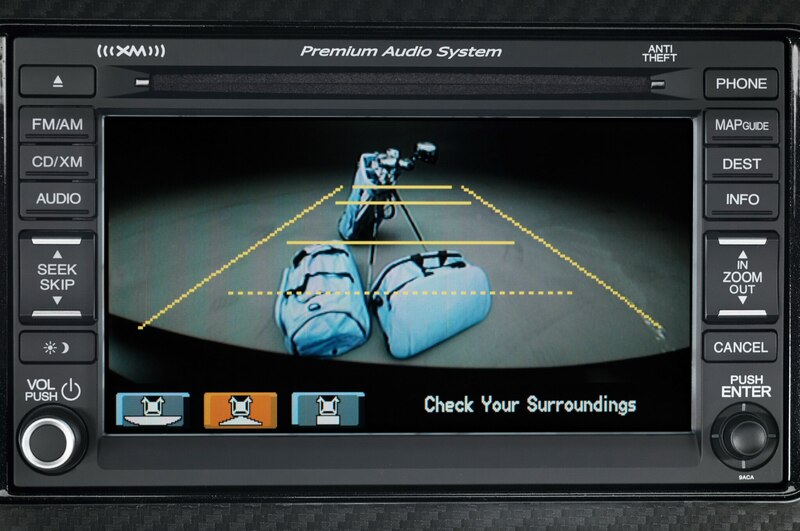 A standard eight-inch LCD display mounted up high performs backup camera duty (the camera is standard), and also provides entertainment details — sadly in the smallest font known to man. 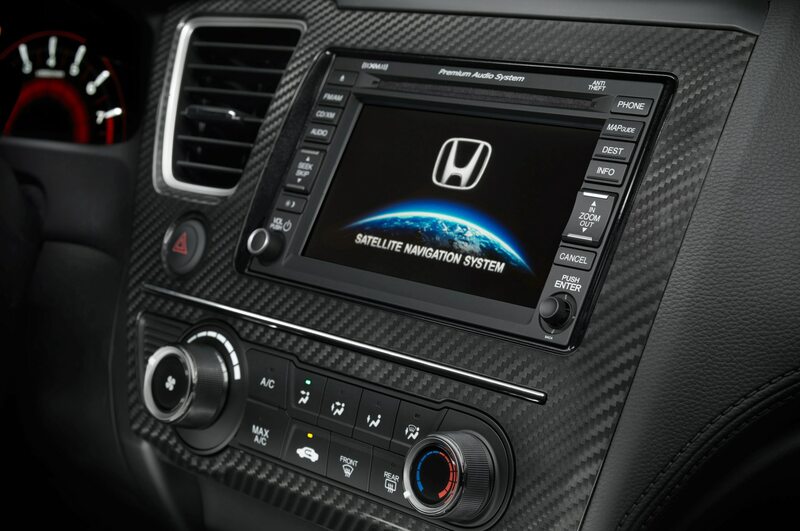 The colorful graphics are a big step forward from last year’s monochromatic menus, but the system doesn’t properly take advantage of the screen’s size. 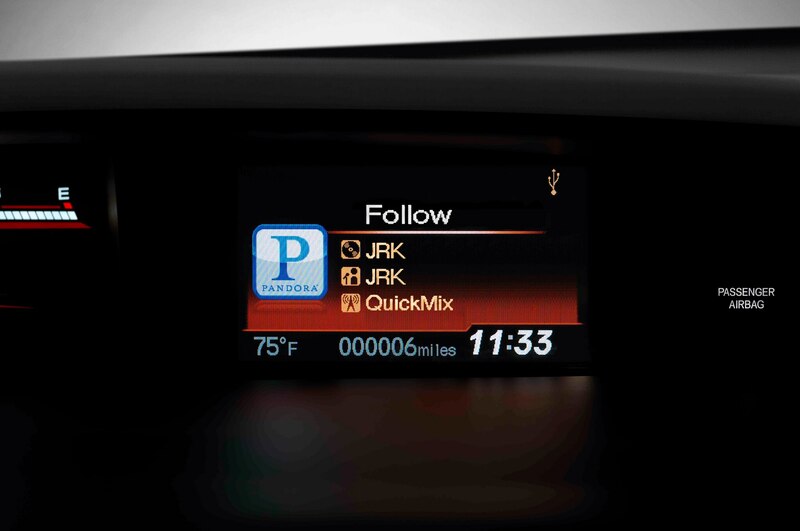 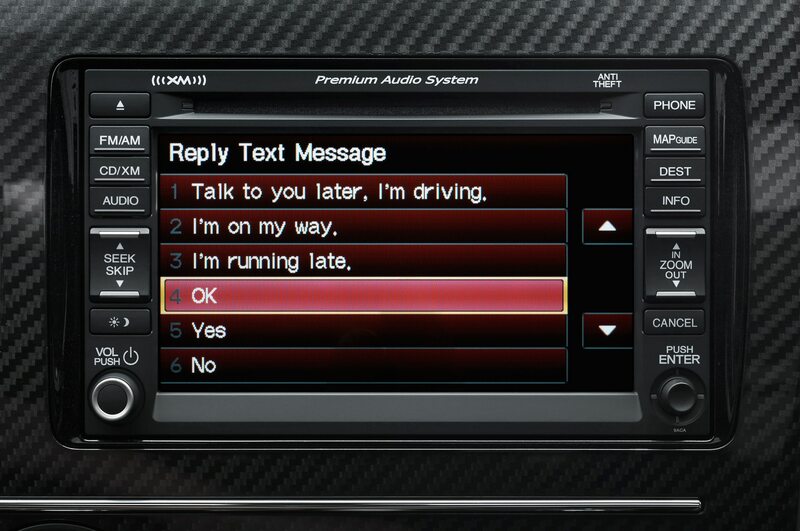 That is, unless you get the optional navigation system. 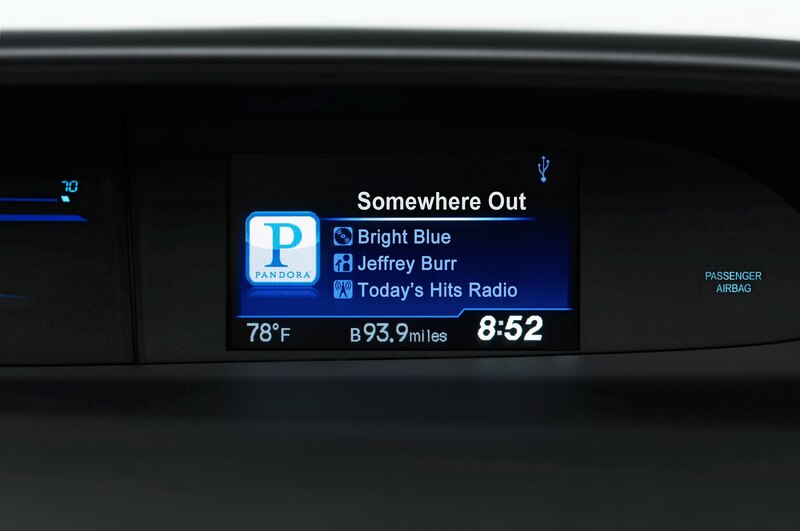 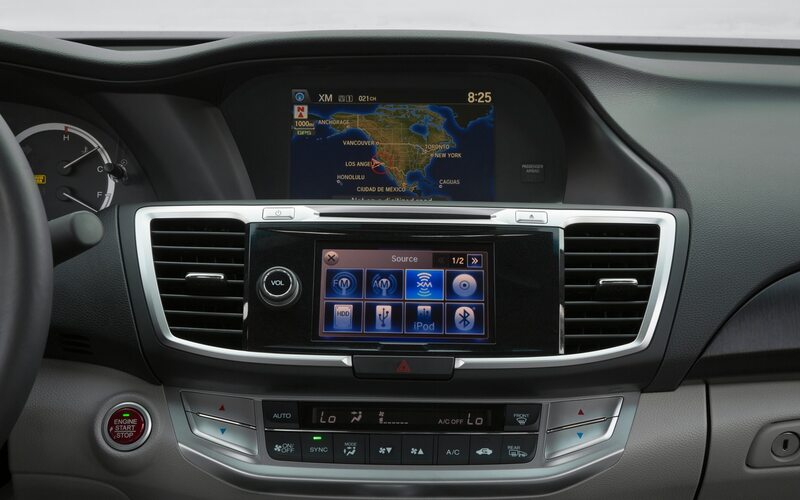 With navigation, you get a higher-resolution version of the upper screen (800×400 pixels instead of 480×320), but the buttons in the center stack are replaced with another LCD touchscreen, ostensibly in the name of reducing clutter. 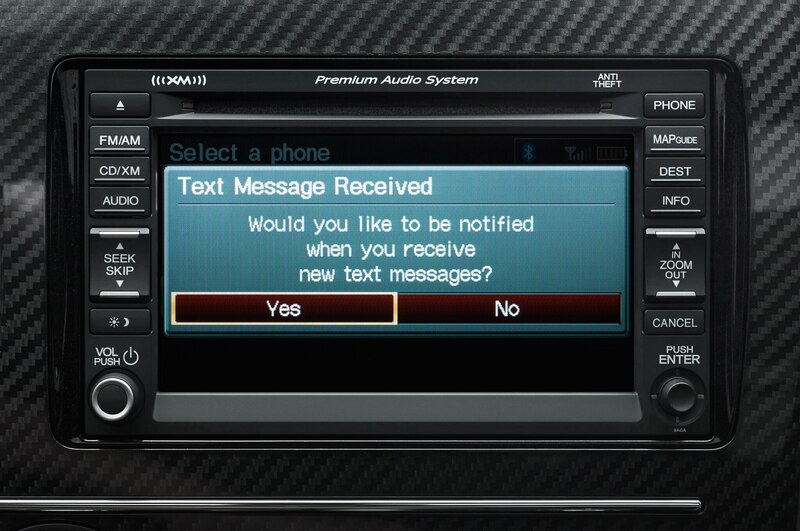 What it does, in fact, is occasionally display the same information in a different format and confuse the driver with illogical menus. 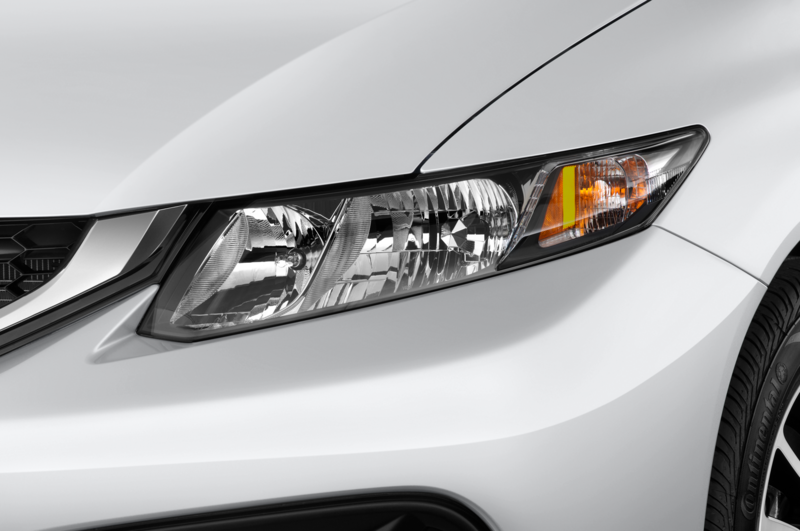 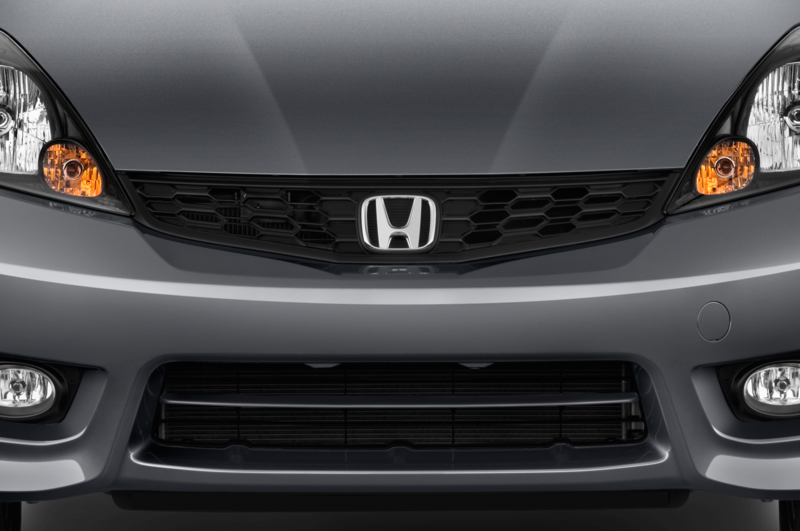 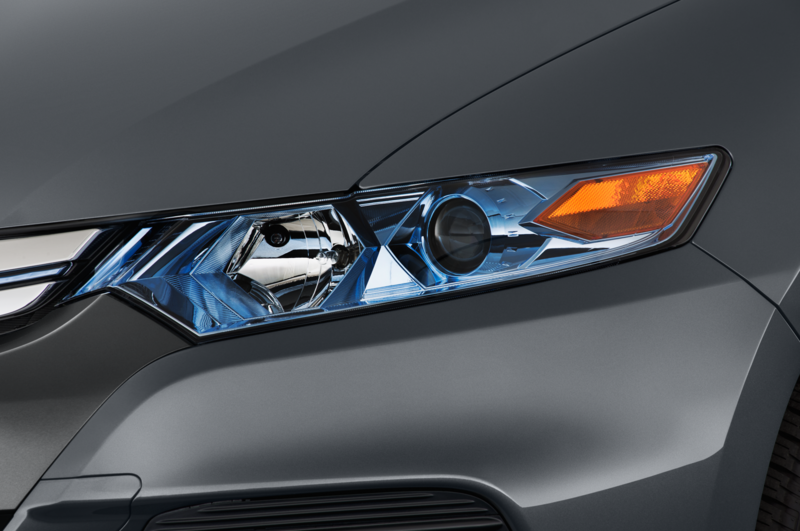 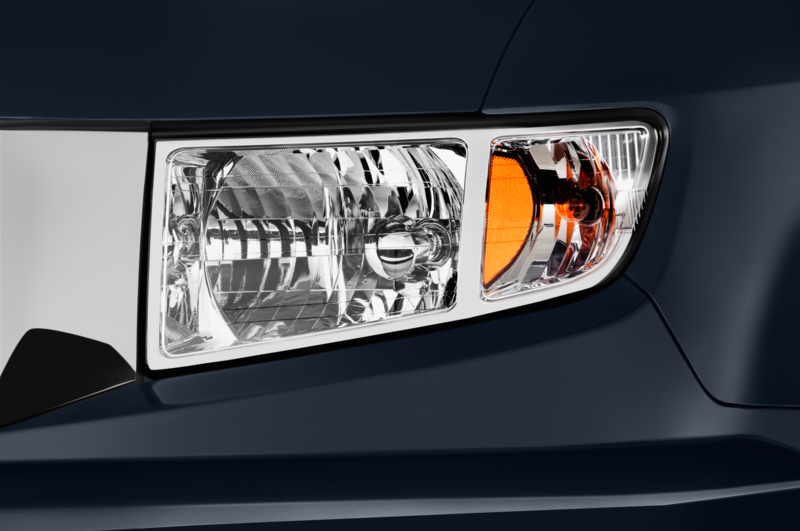 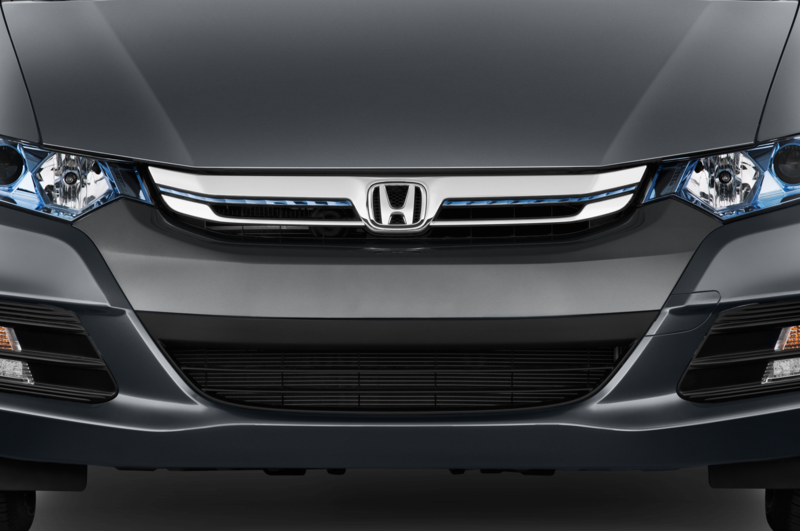 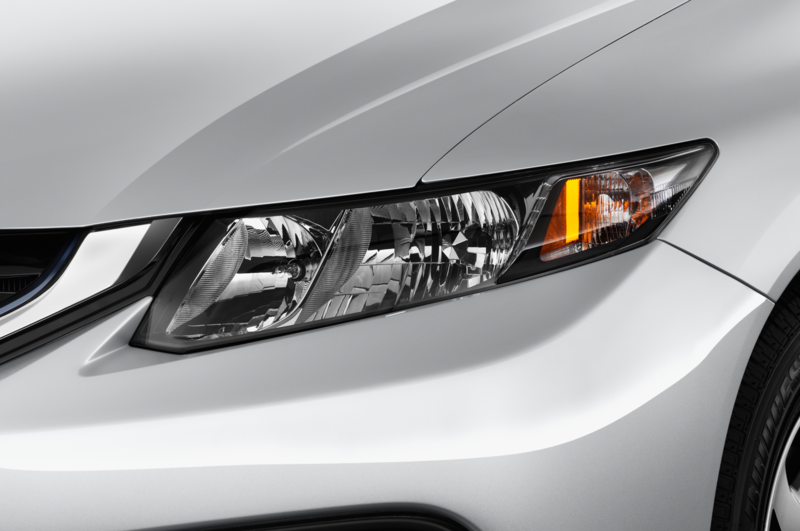 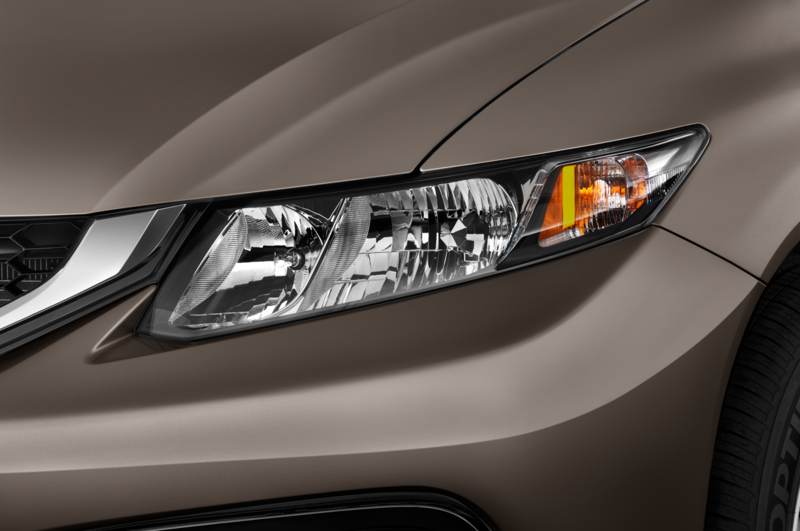 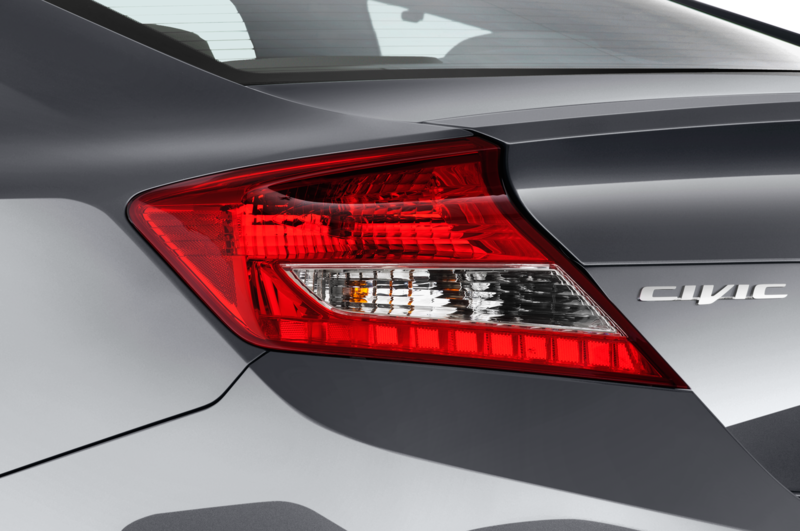 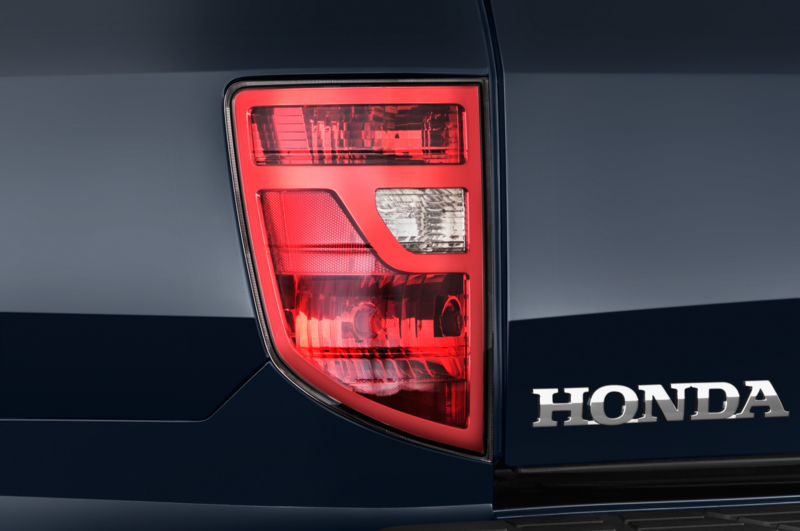 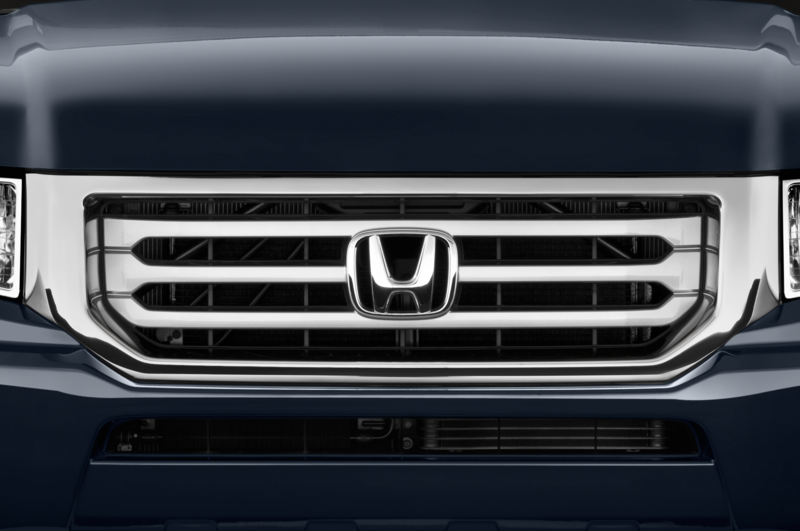 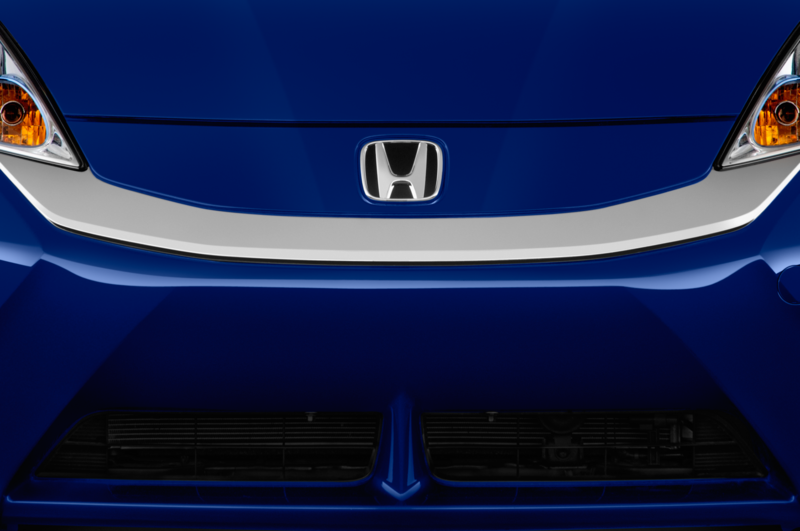 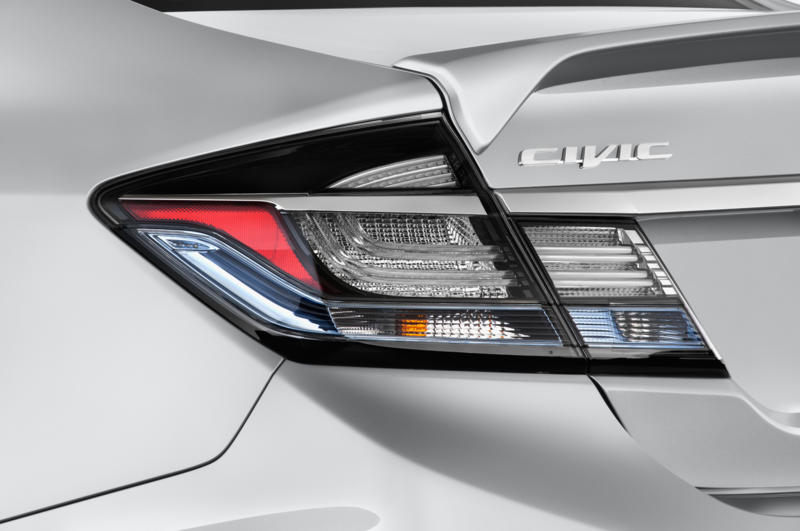 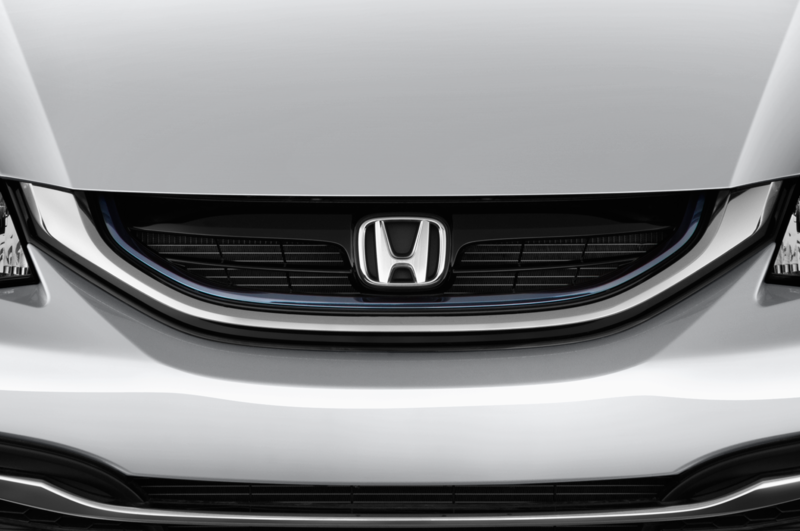 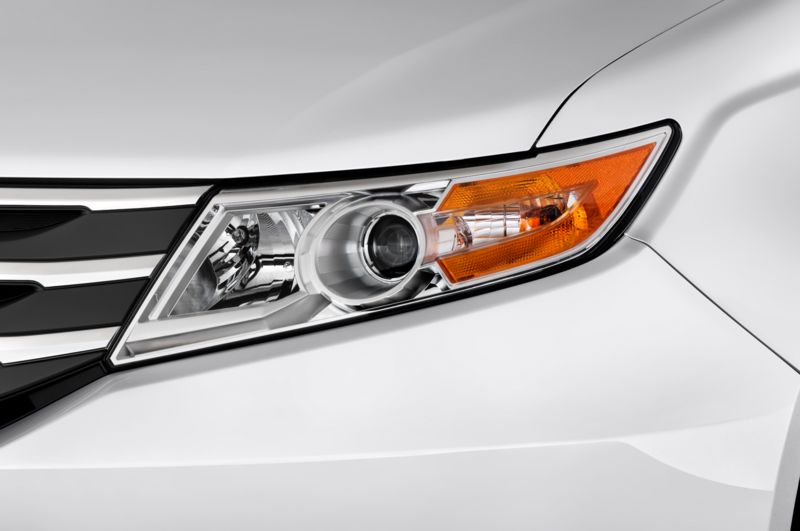 Additions to the higher-trim versions of the Accord include LED headlights (which inexplicably use halogen high-beams), adaptive cruise control (which, thankfully, can be used in conventional mode), forward collision warning (which is more nervous than a driver’s ed instructor), and a novel feature Honda calls LaneWatch. 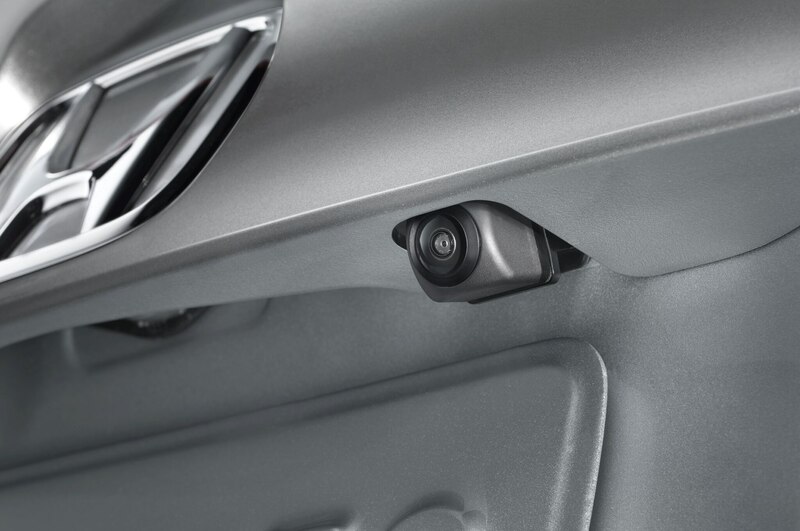 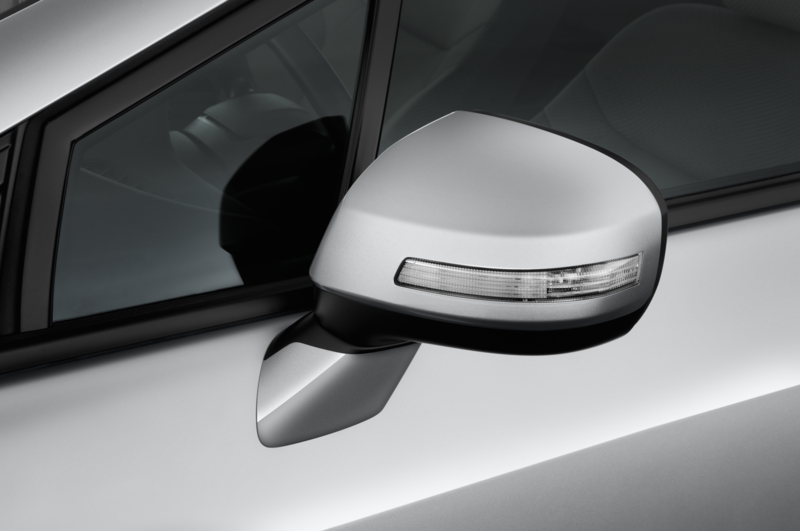 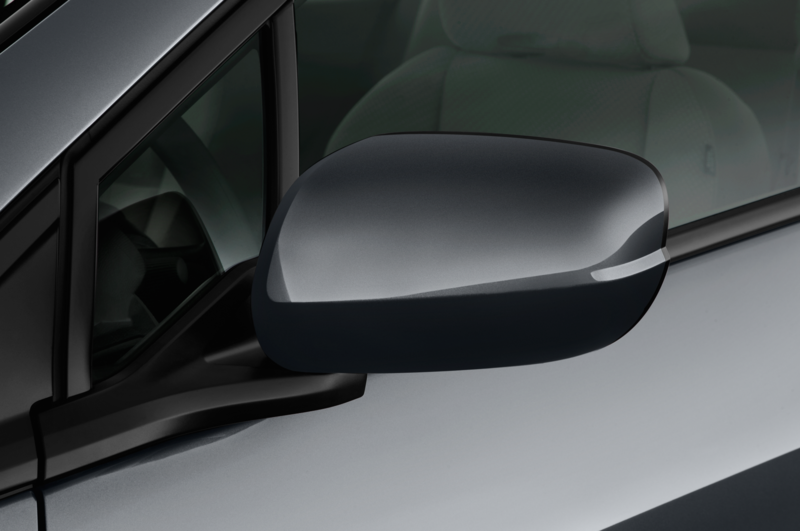 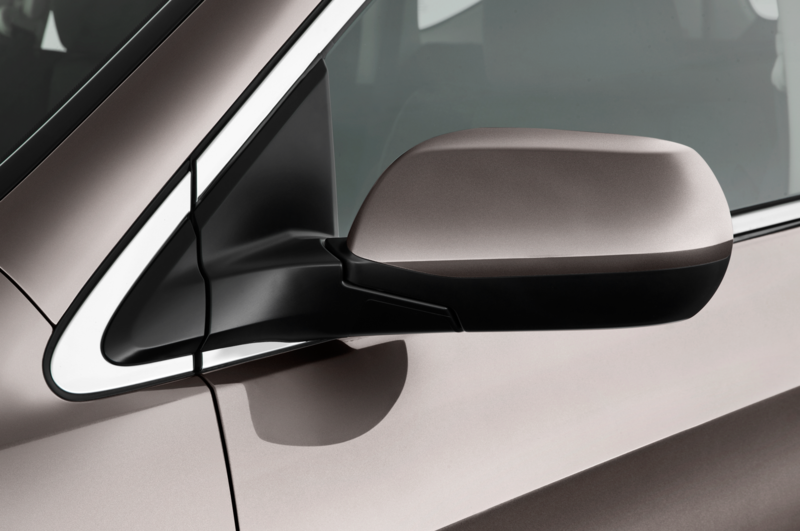 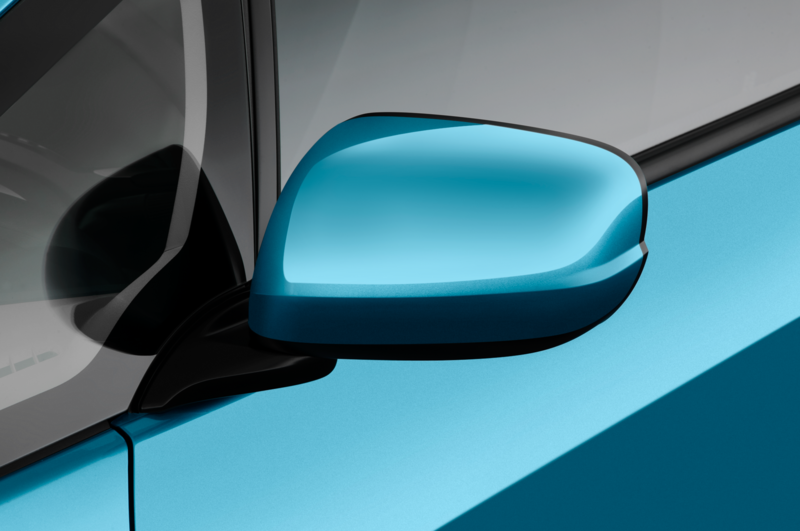 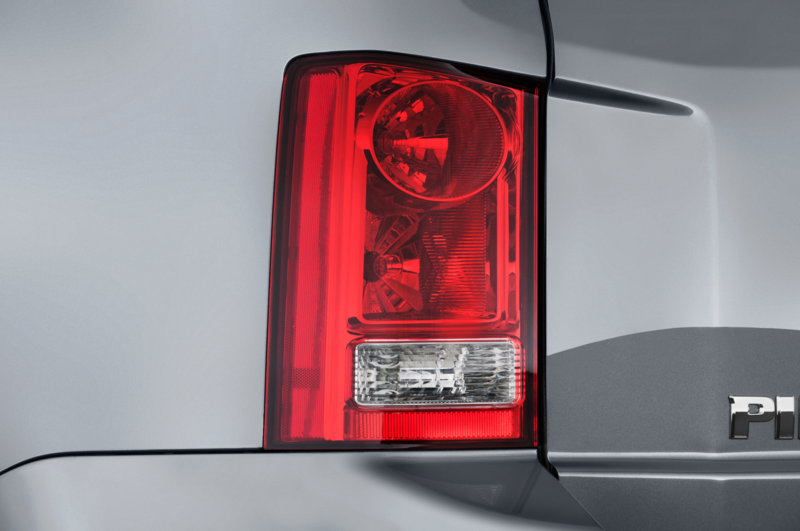 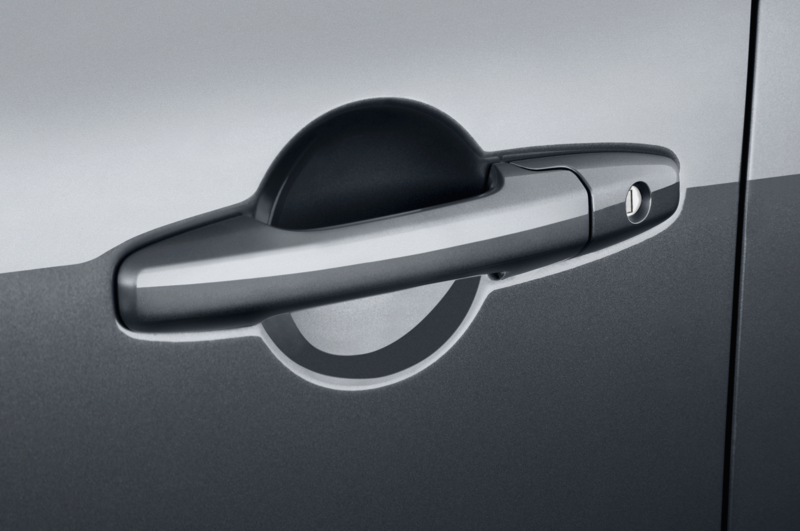 This system, activated by turning the right-side turn signal on or pressing a button on the end of the stalk, displays a wide-angle image taken by a camera in the right-side side-view mirror. 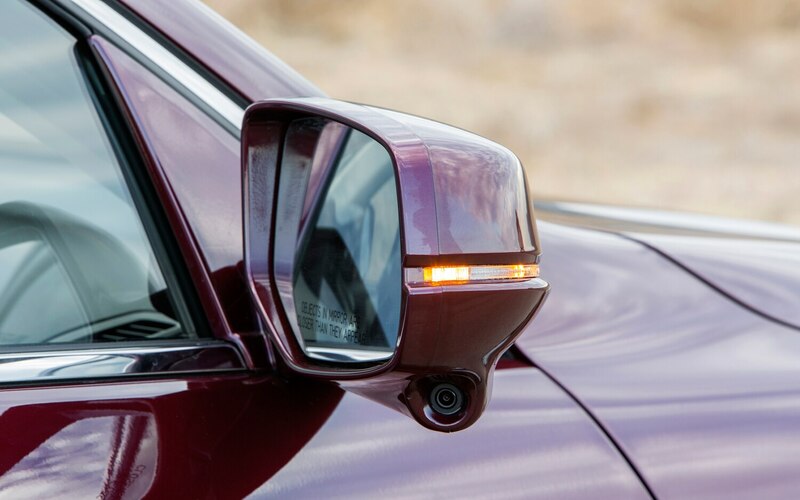 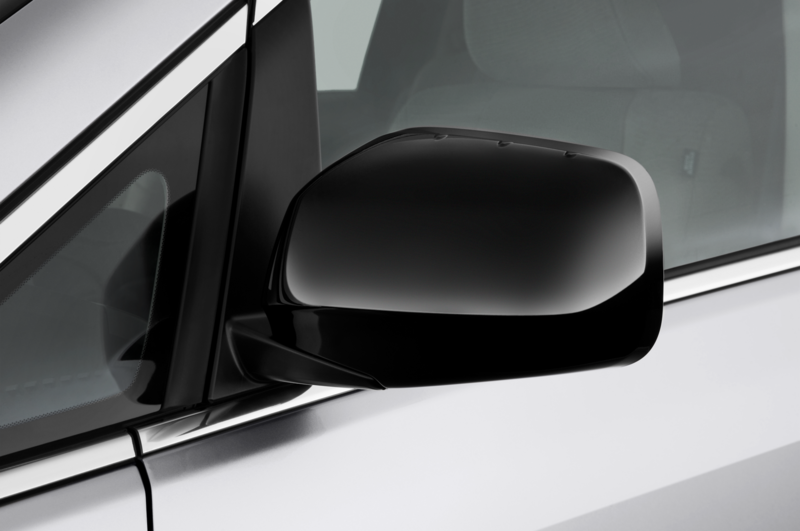 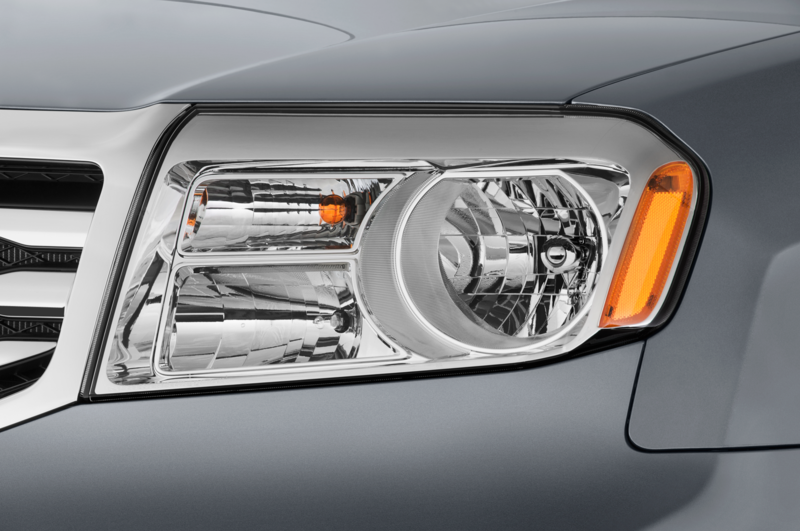 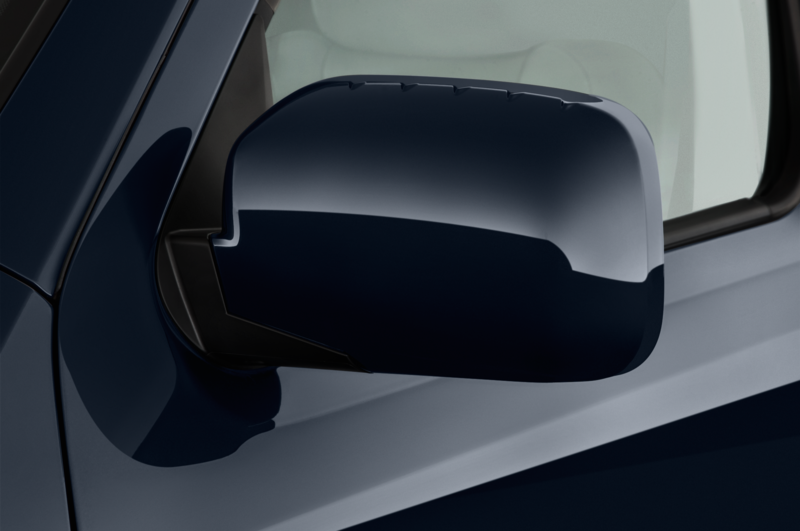 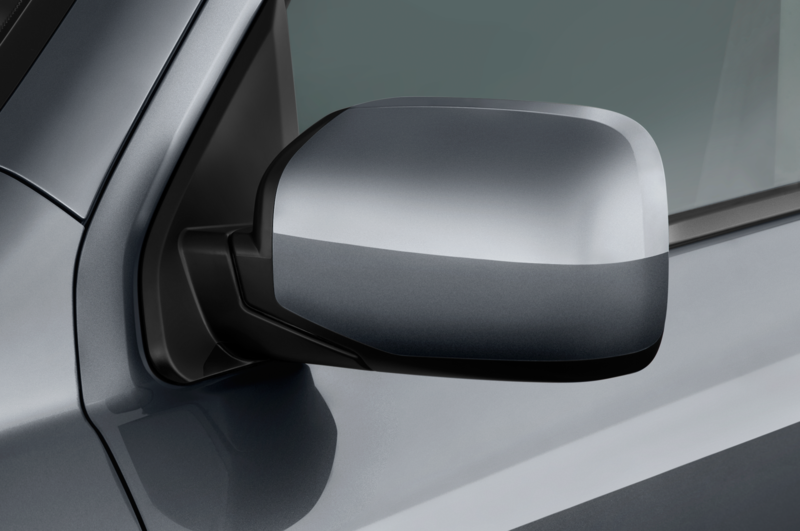 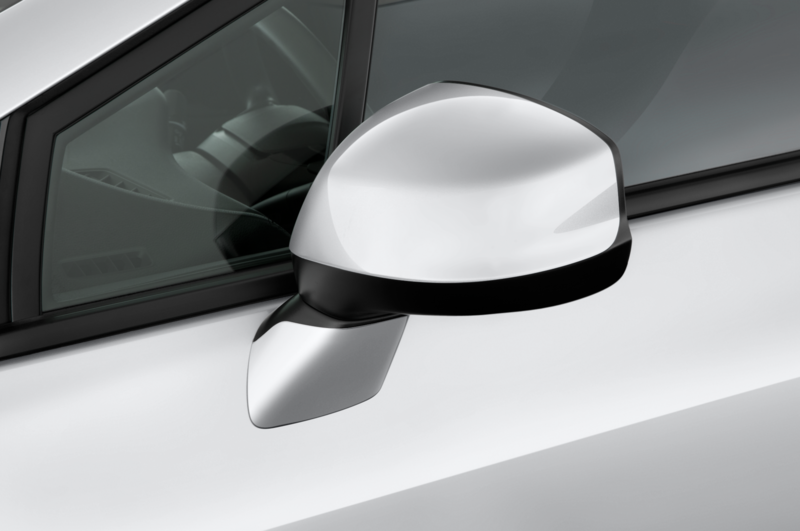 It’s an interesting alternative to other blind-spot monitoring systems, but it doesn’t function on the left side (where, arguably, you need it more). 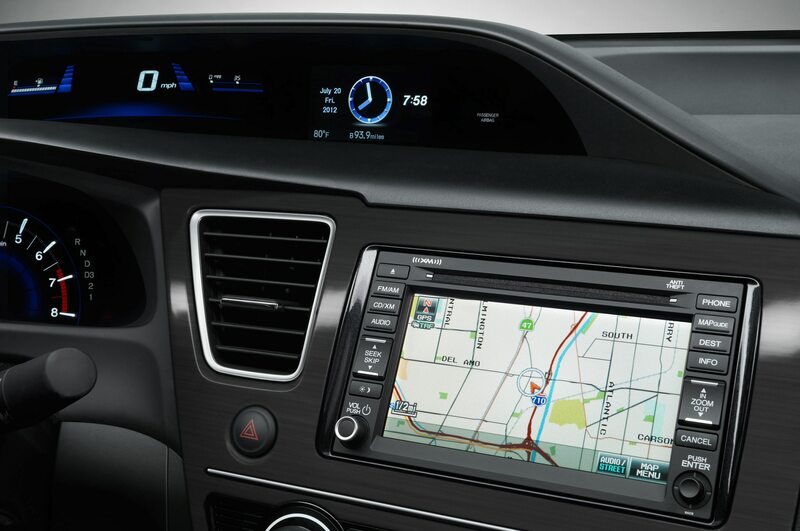 It’s also intrusive at low speeds when you’re approaching a turn, especially if you’re trying to following directions from the navigation system, although you can turn it off. 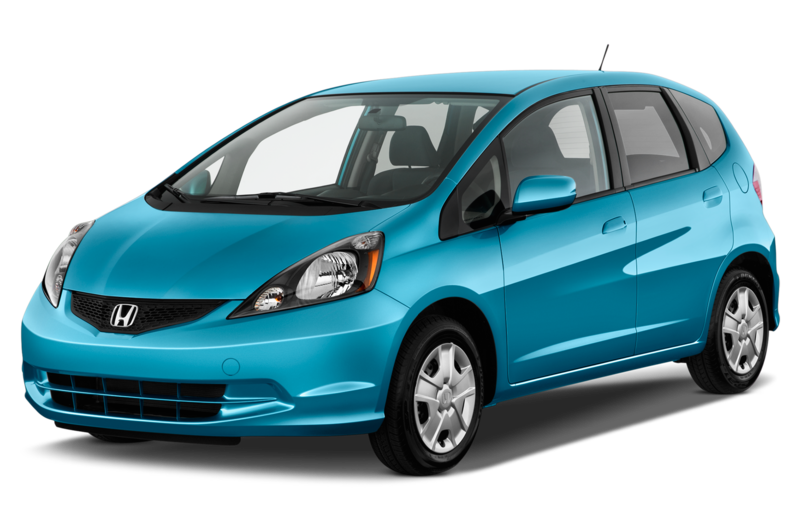 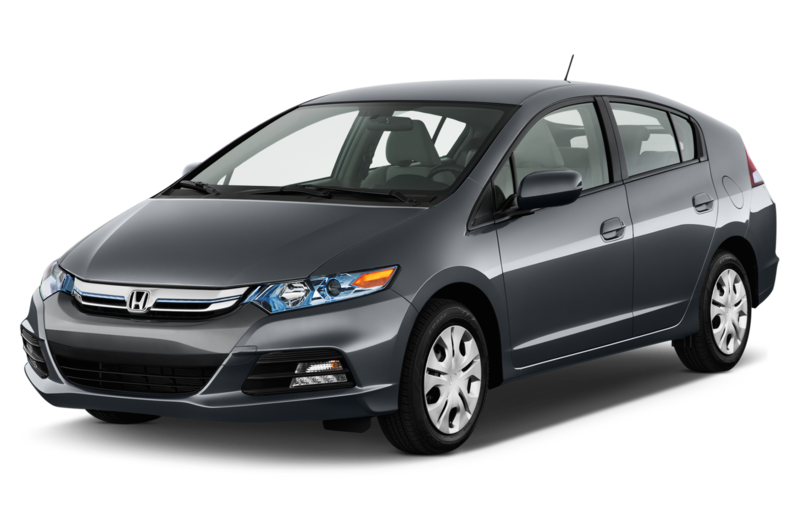 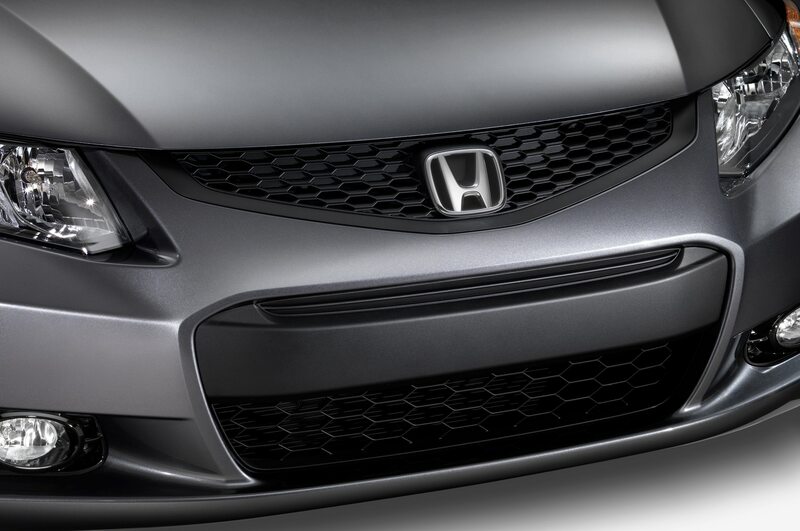 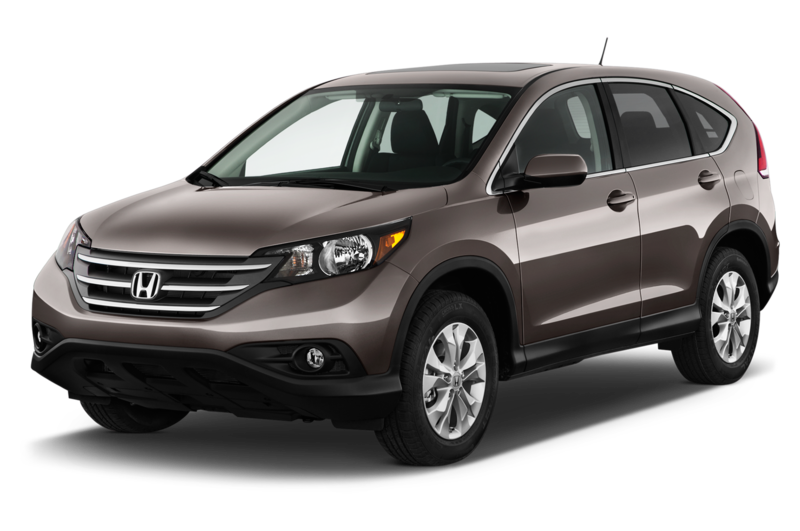 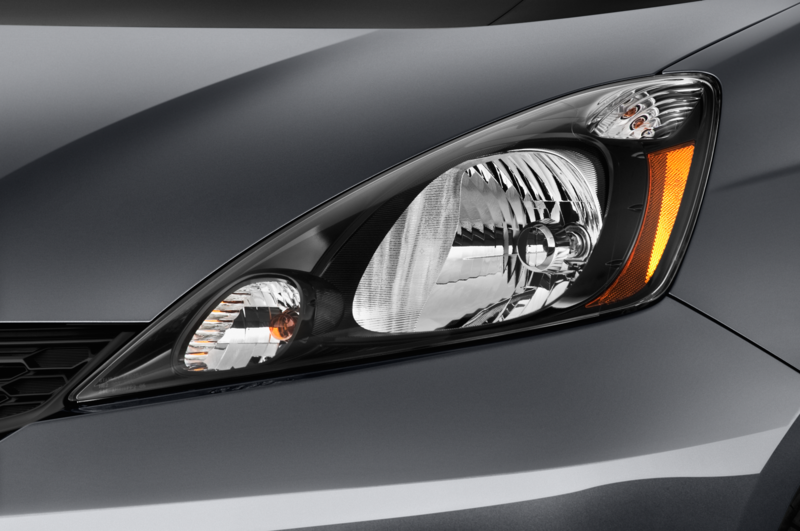 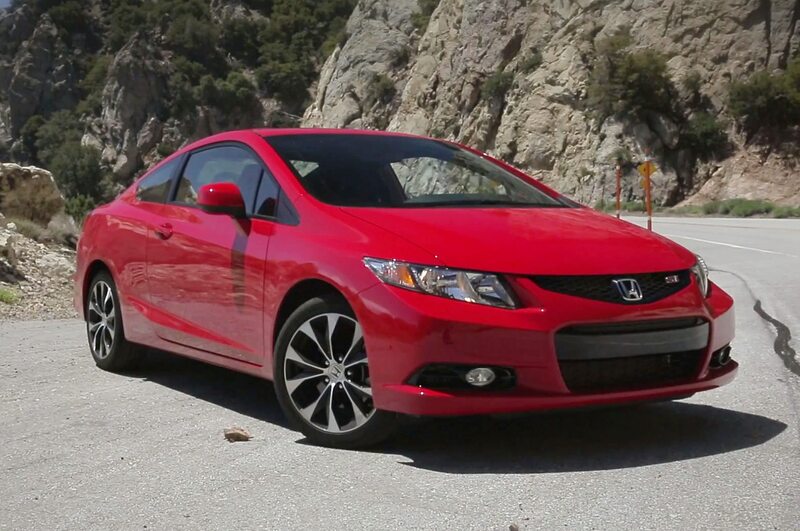 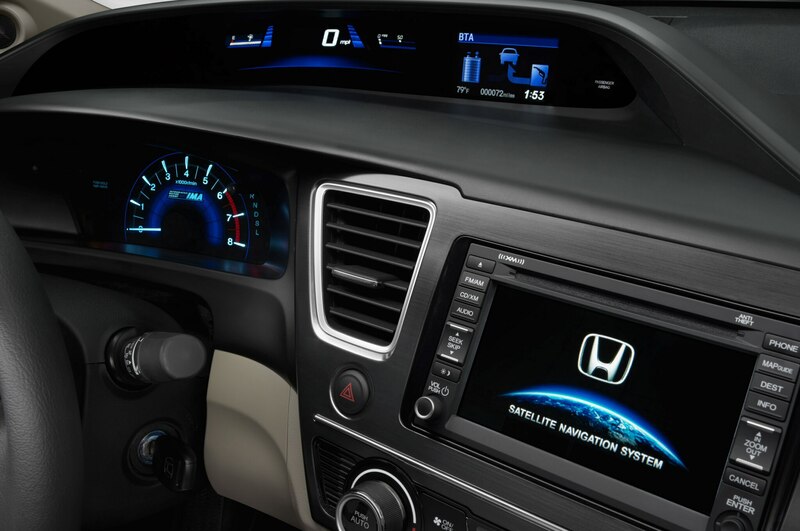 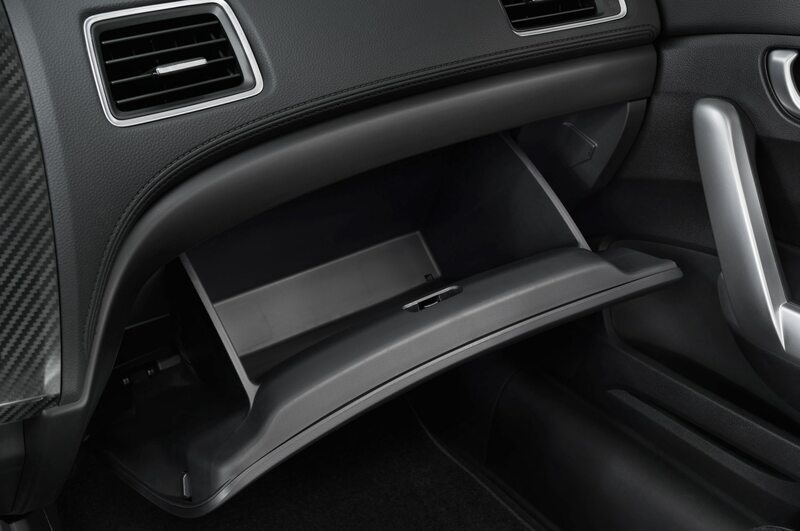 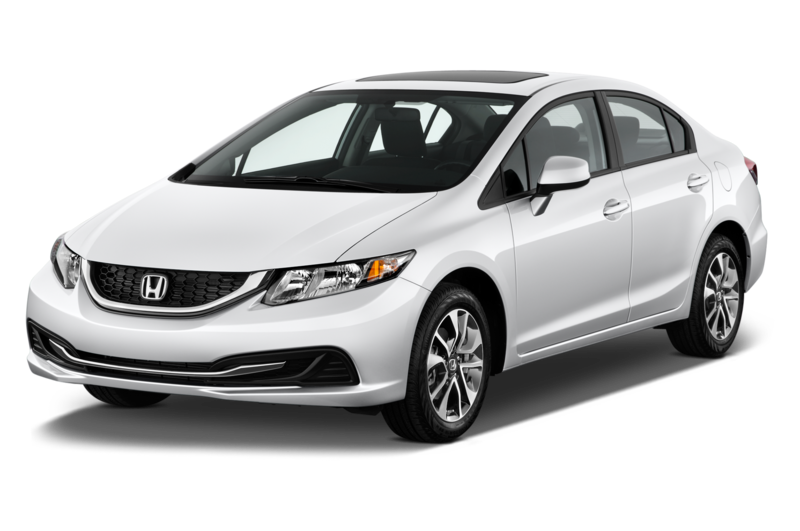 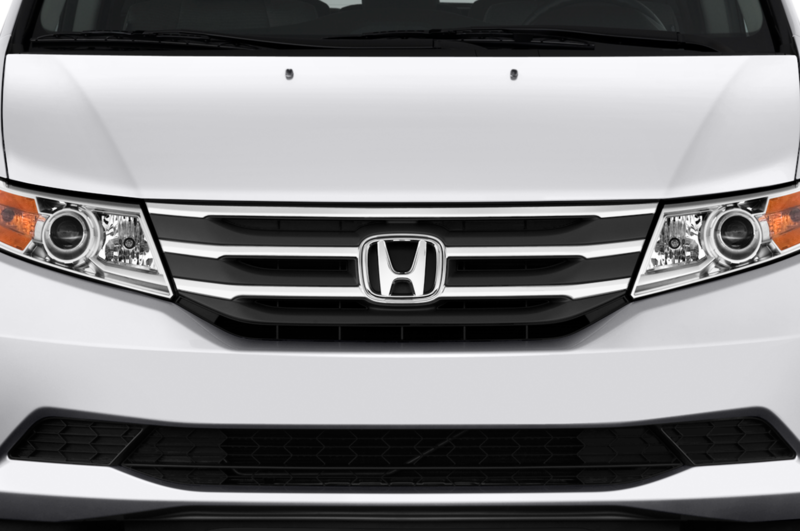 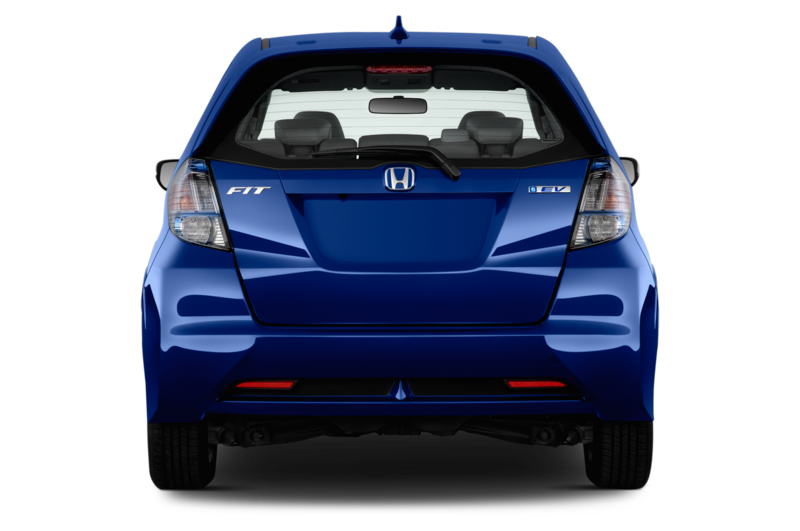 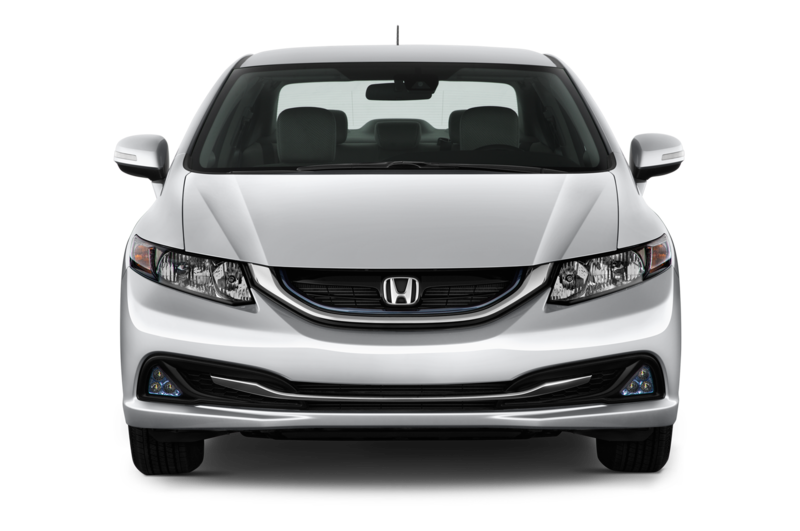 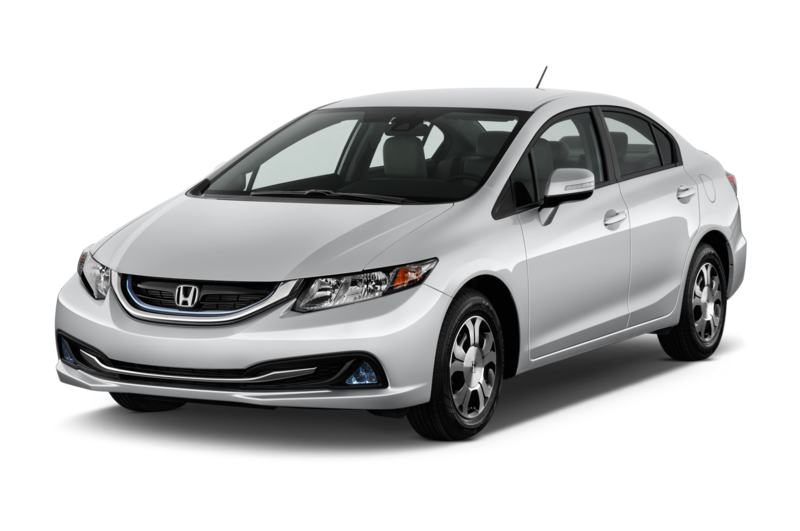 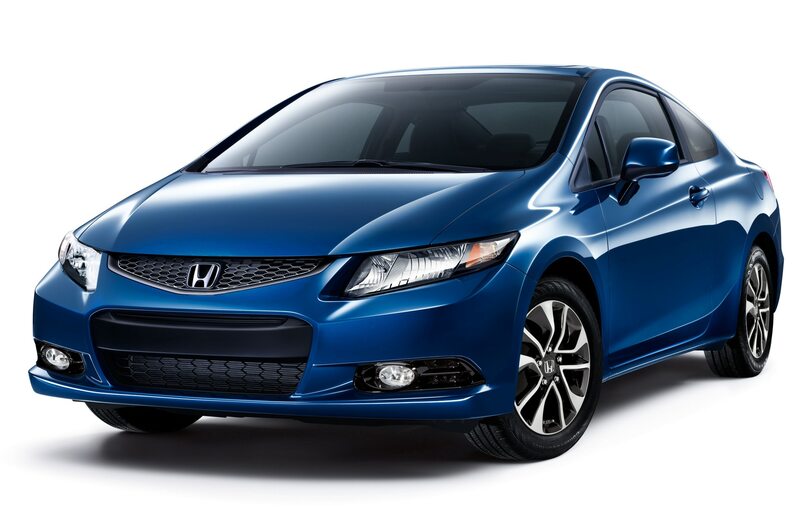 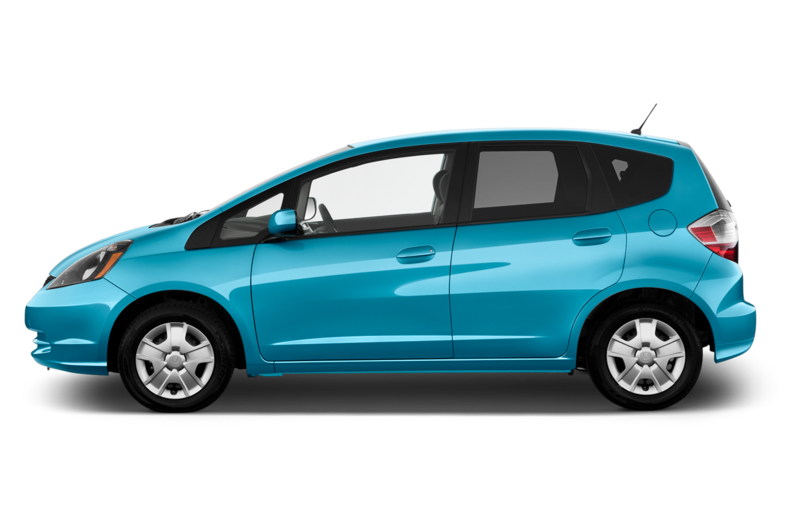 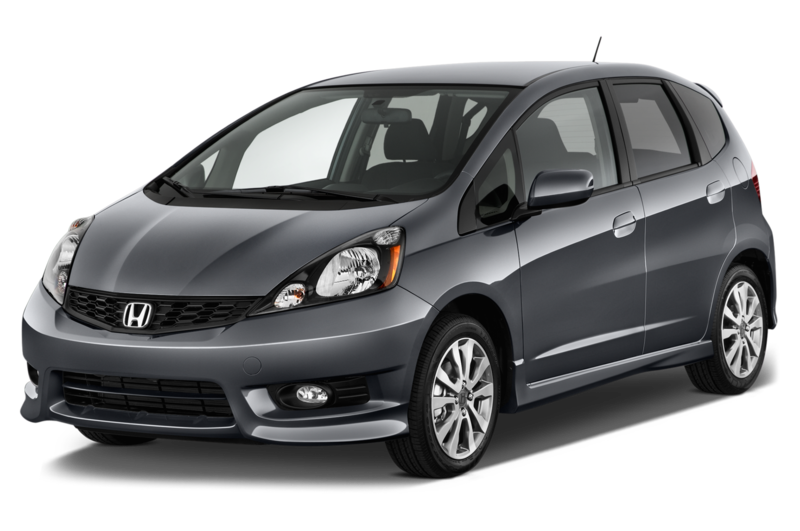 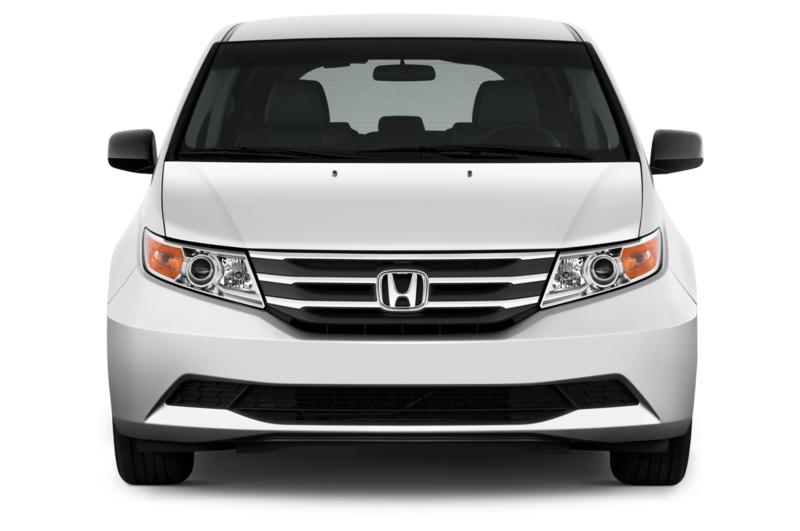 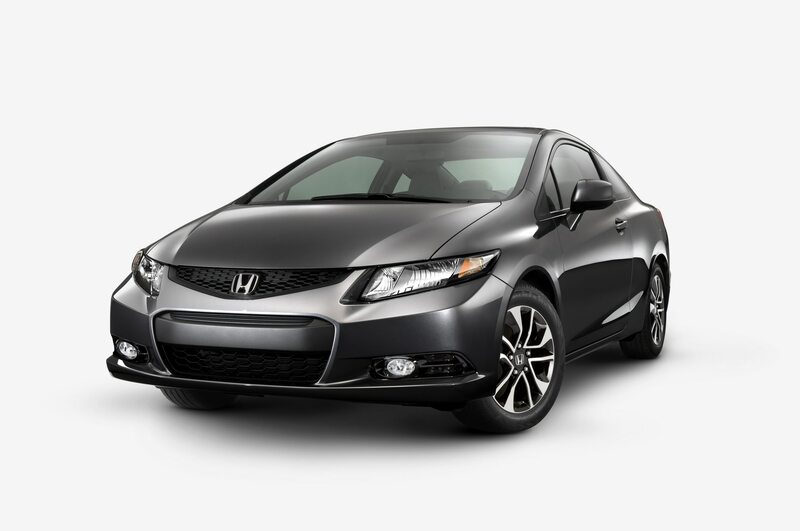 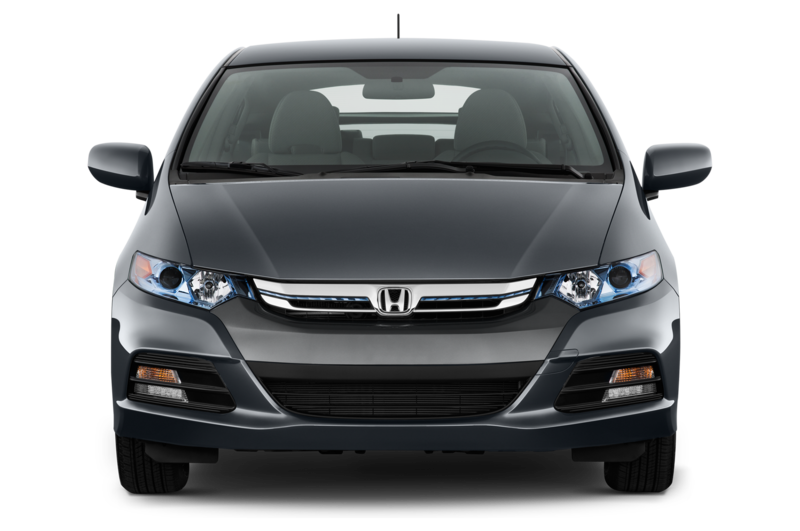 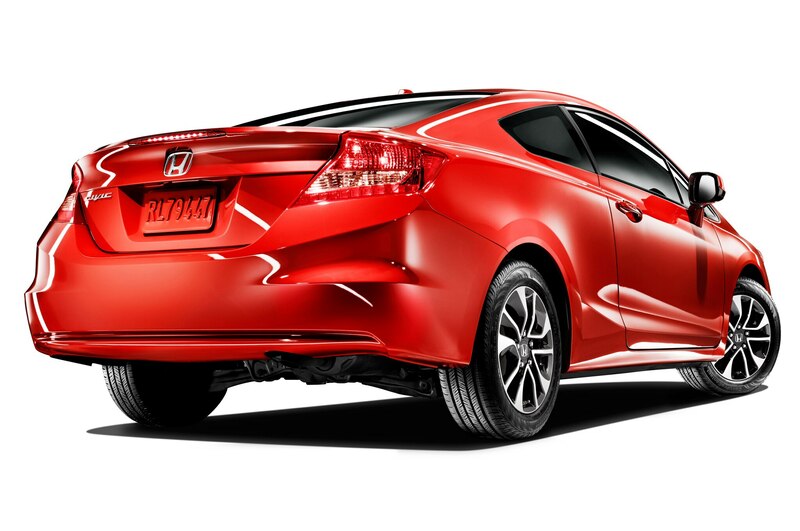 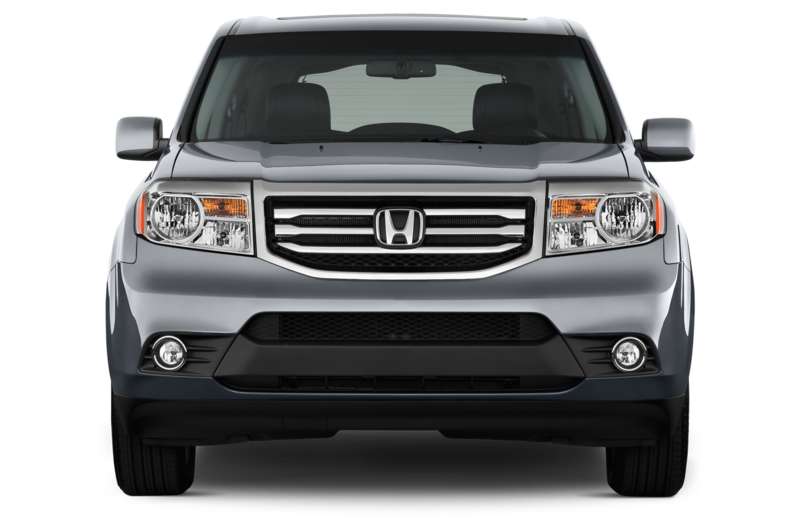 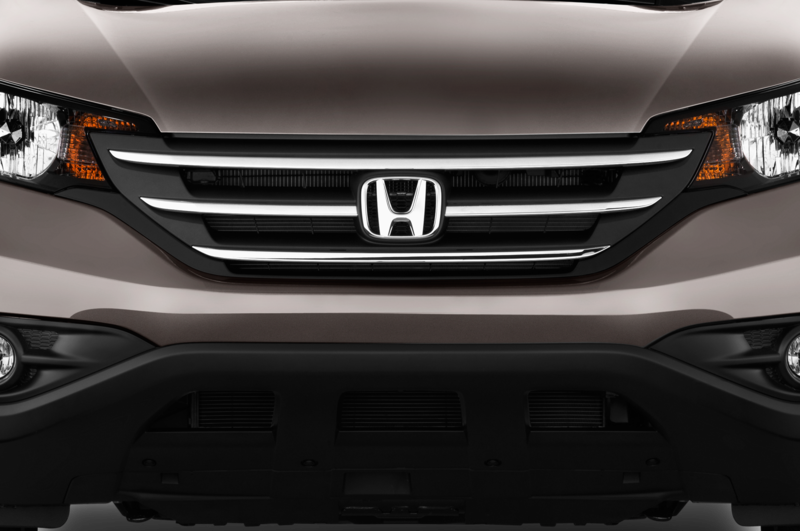 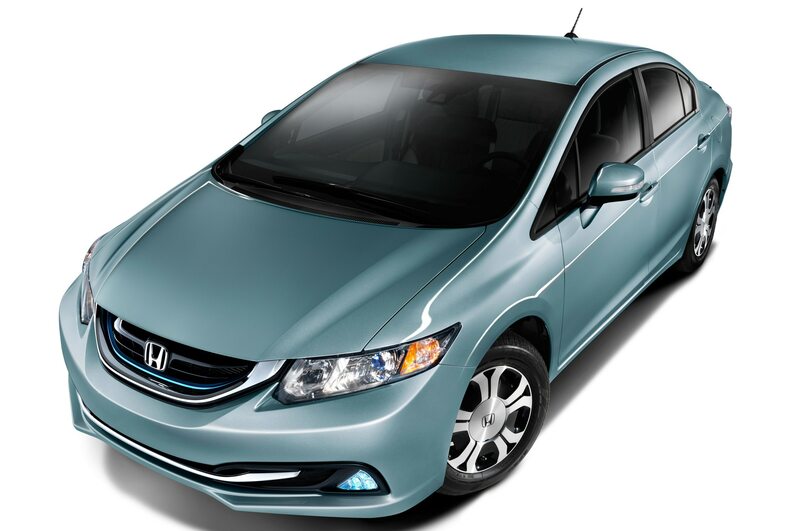 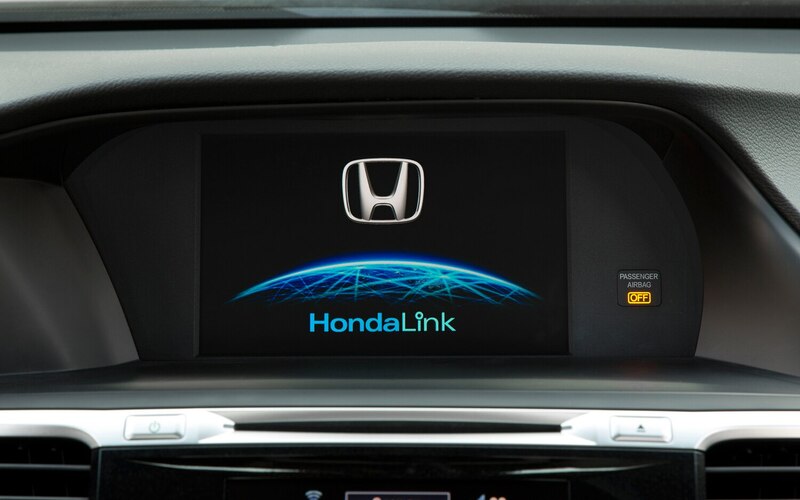 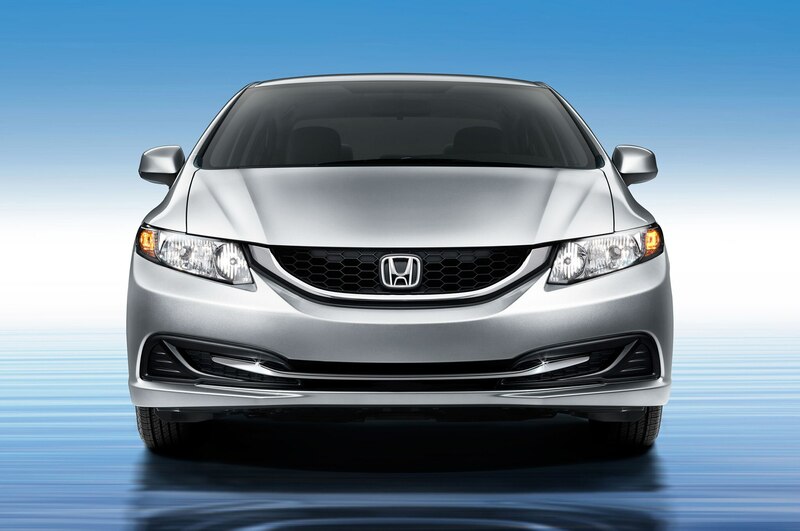 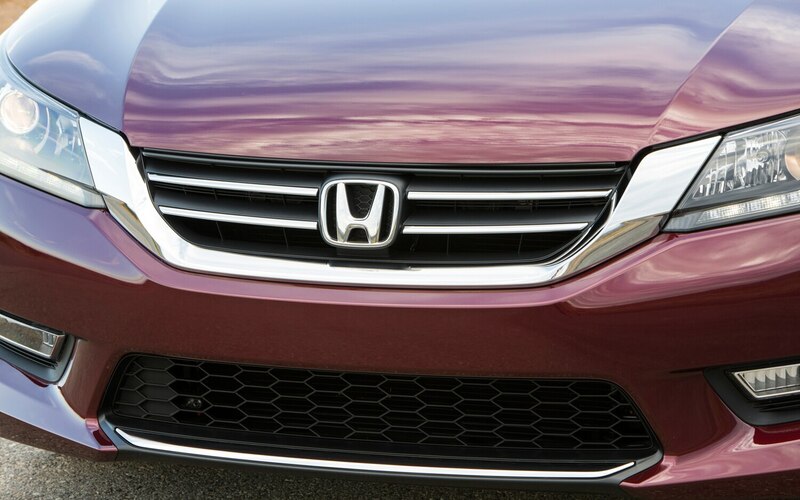 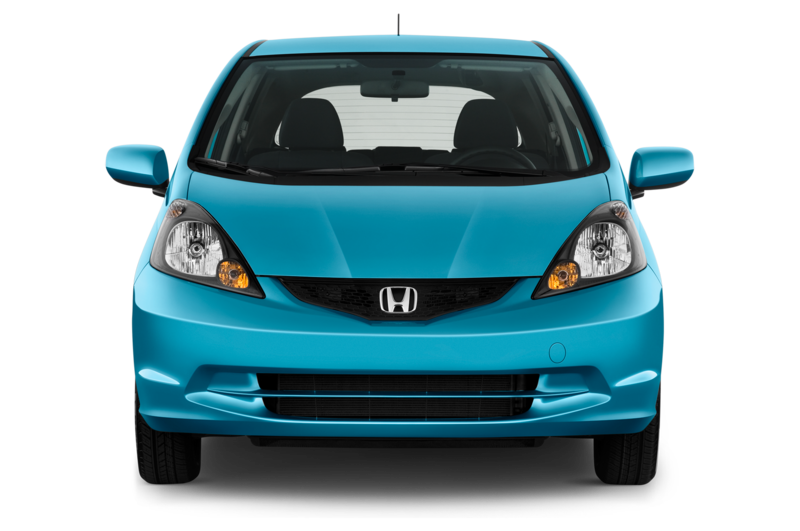 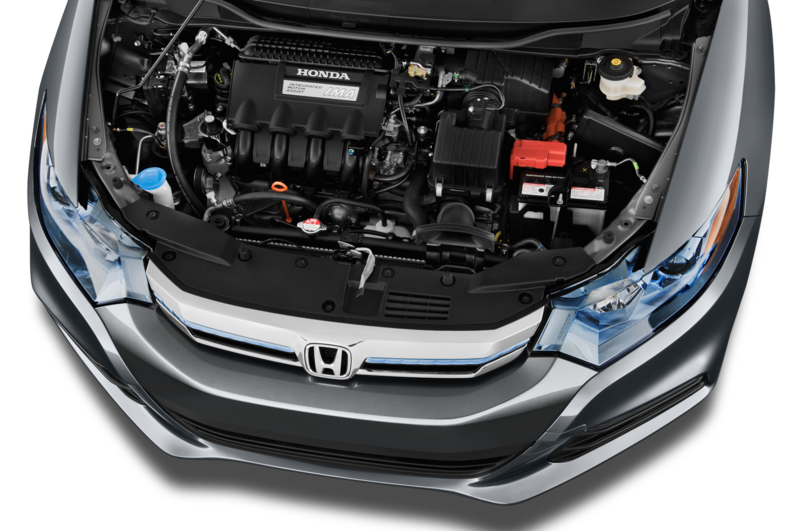 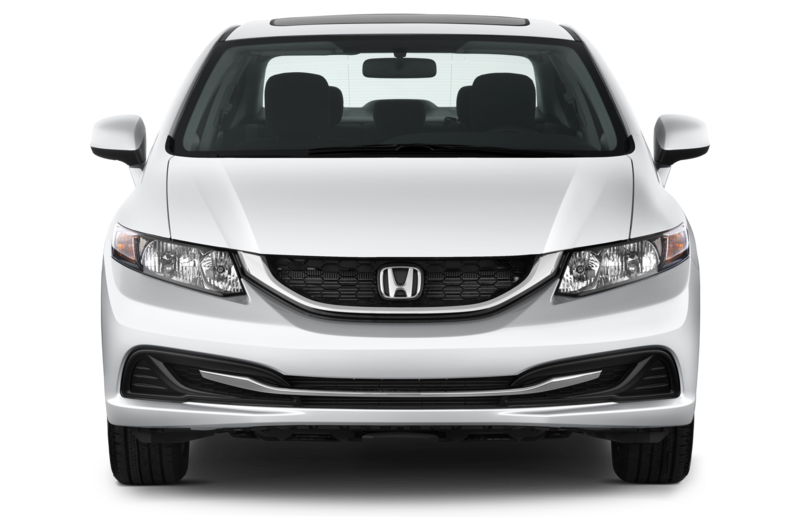 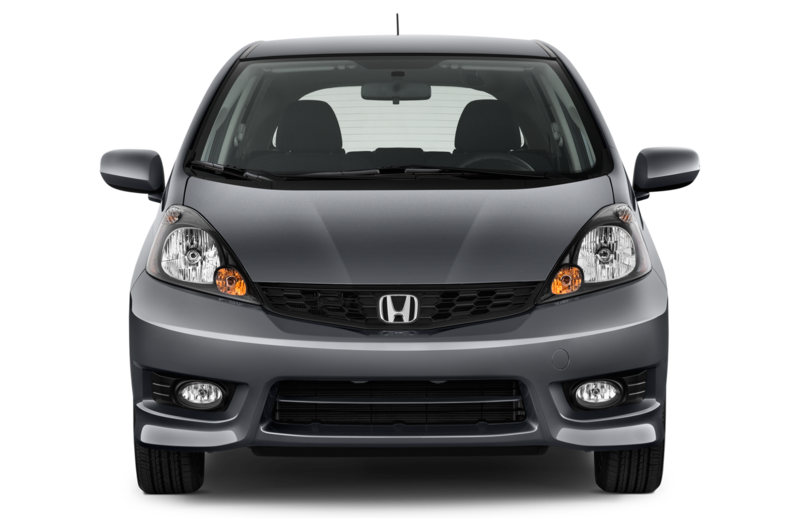 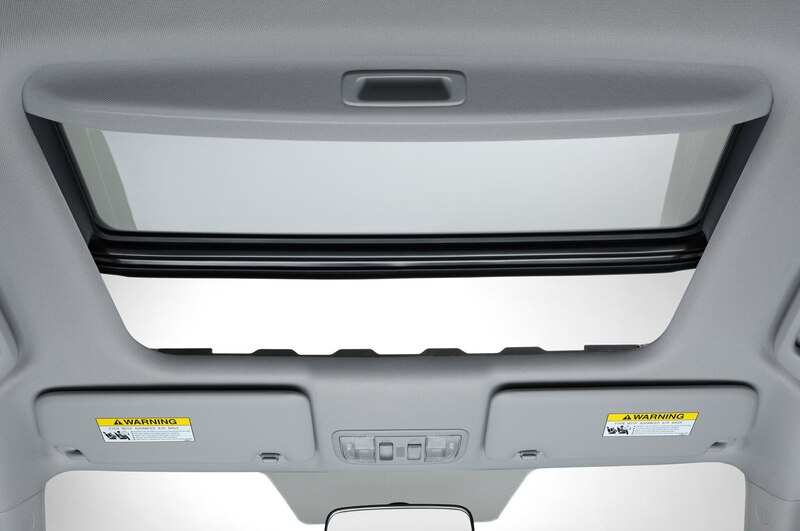 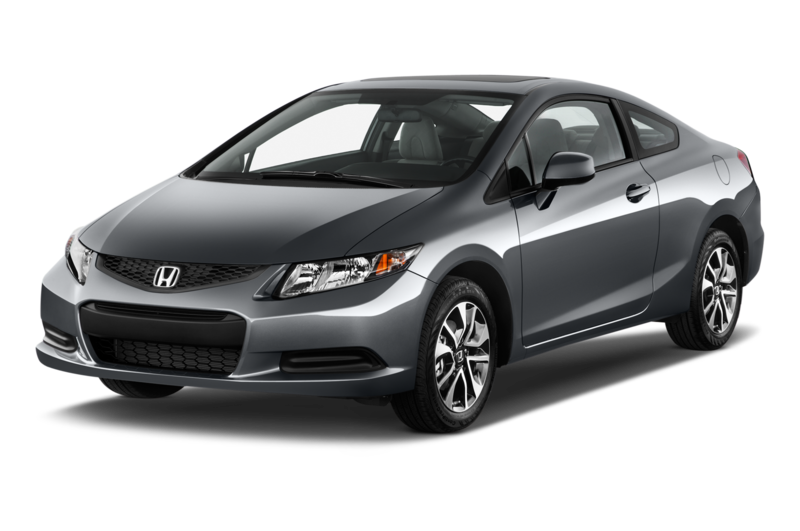 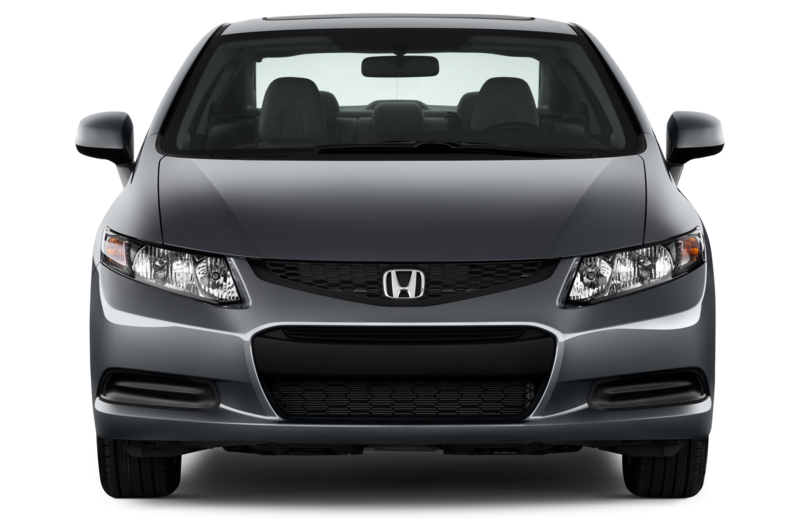 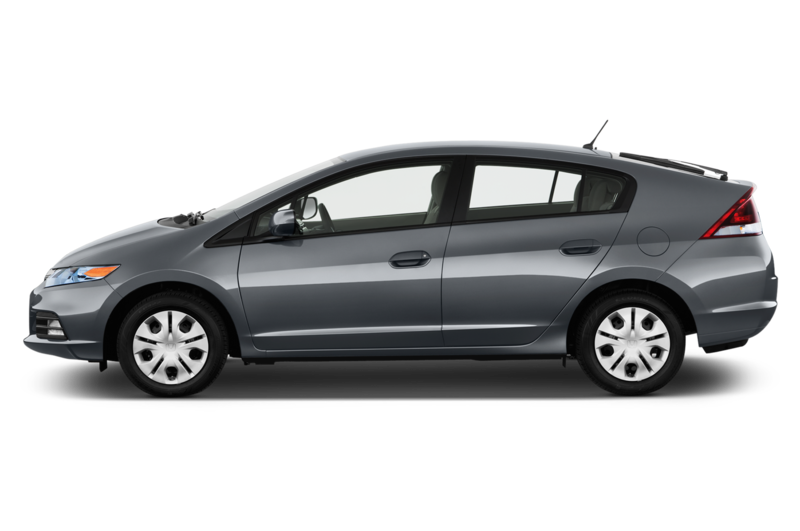 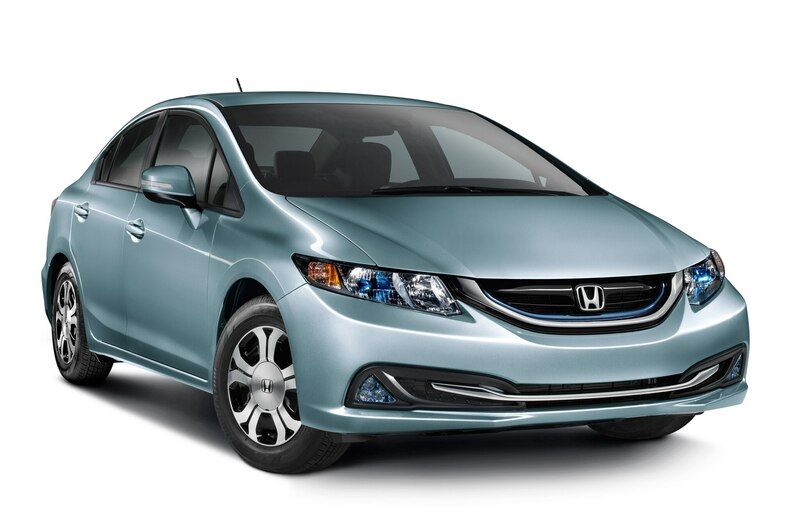 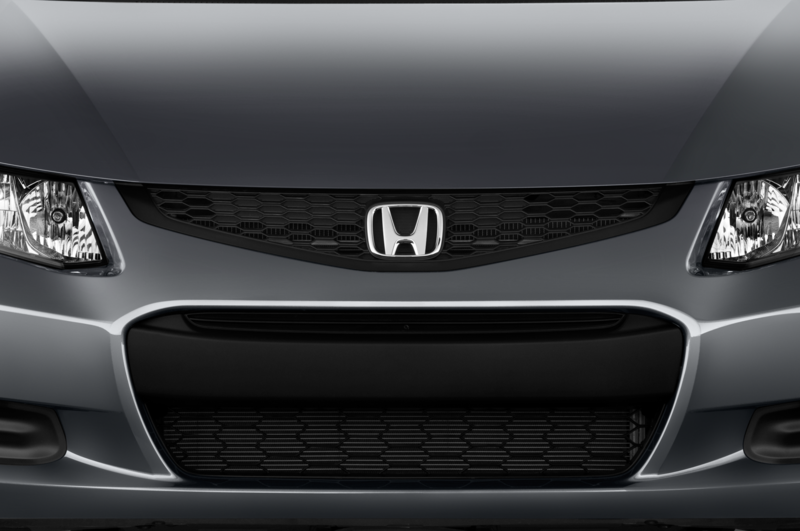 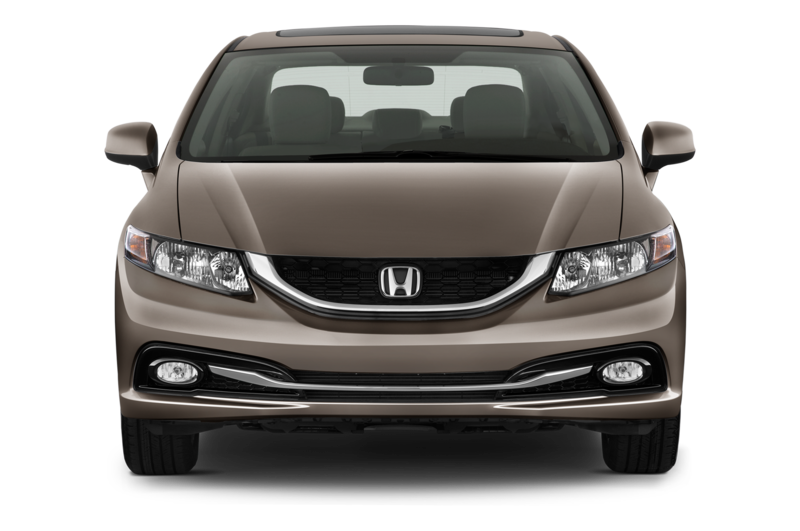 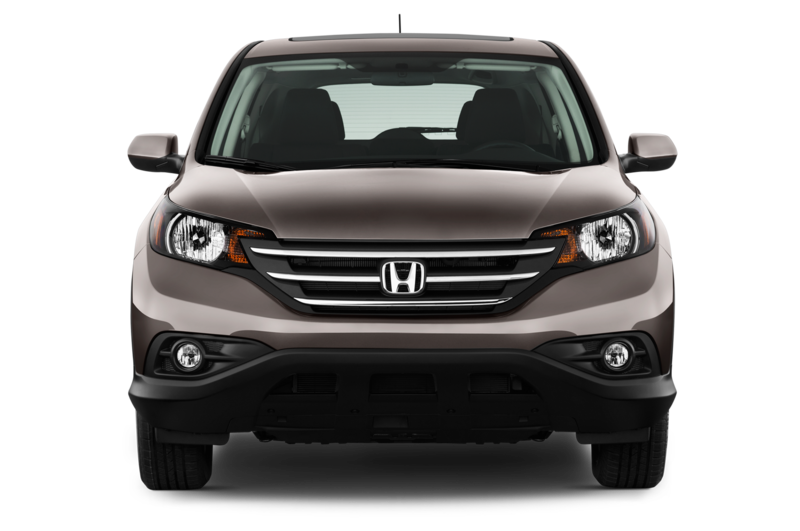 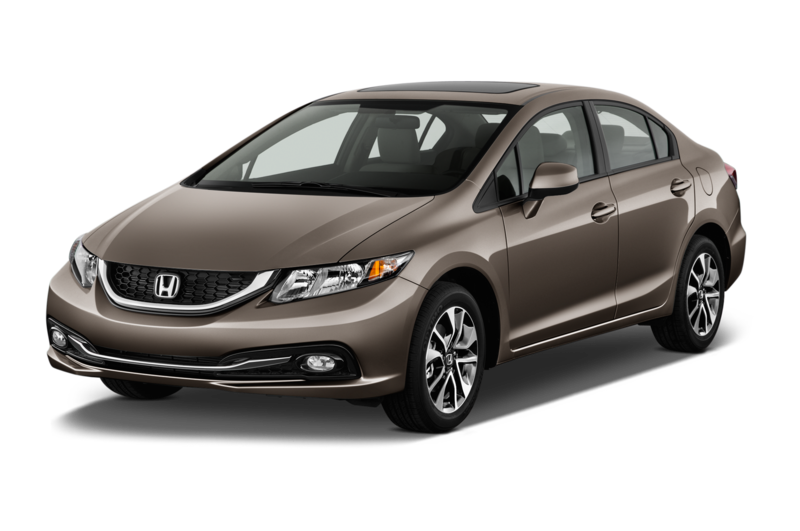 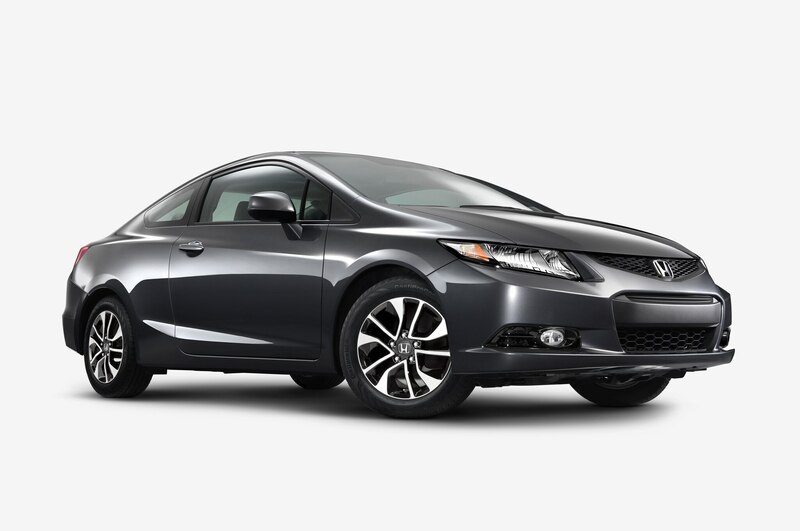 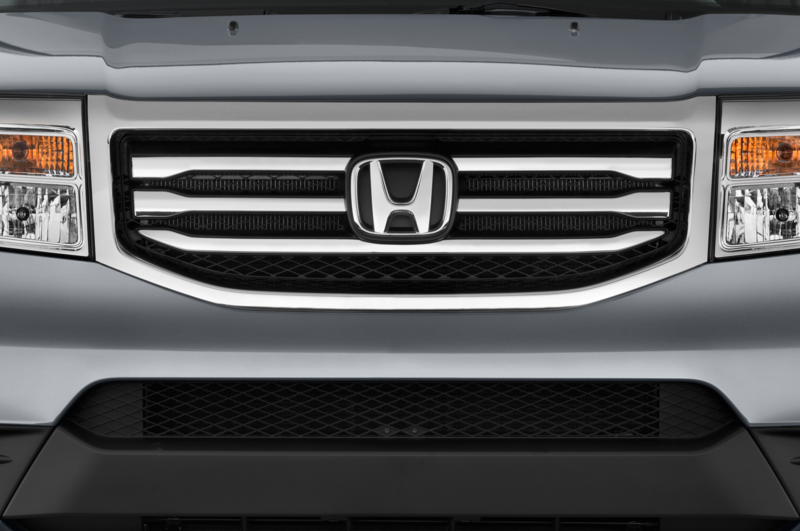 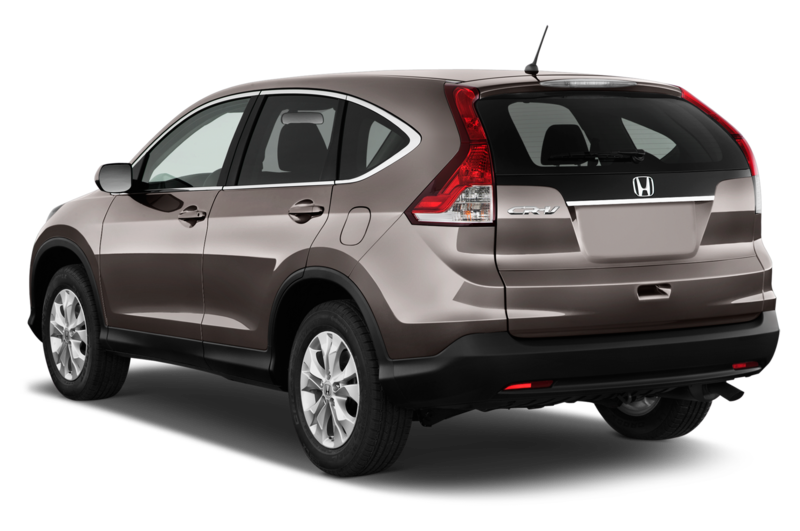 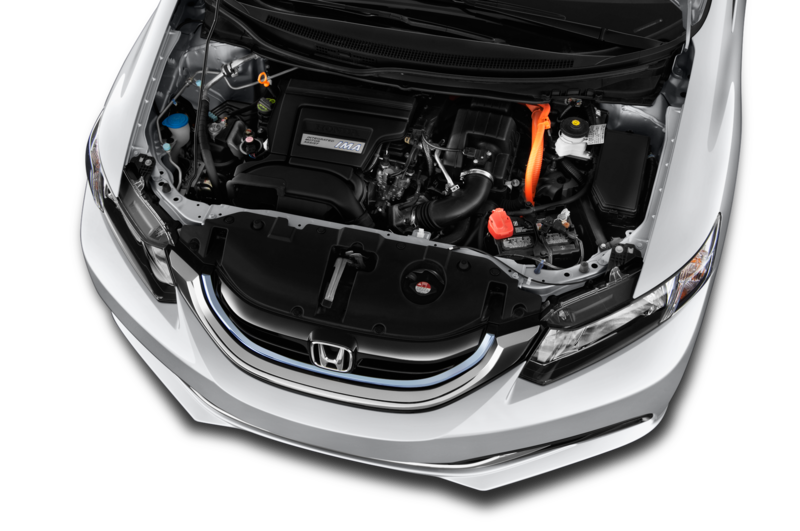 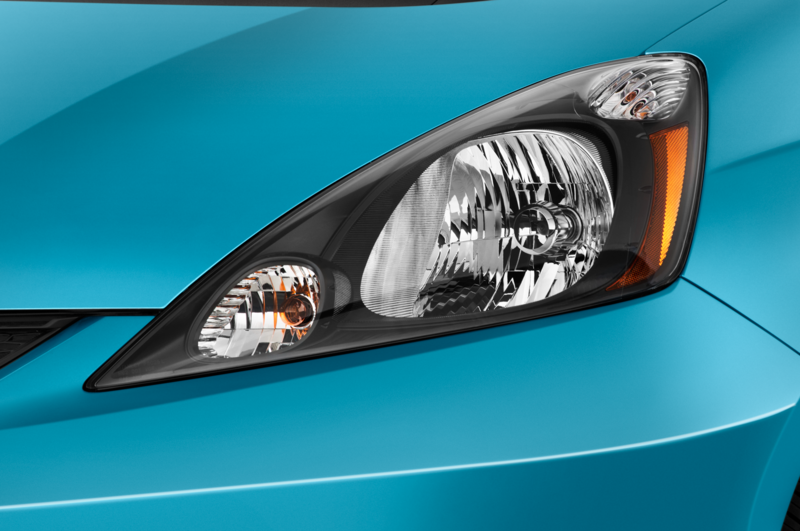 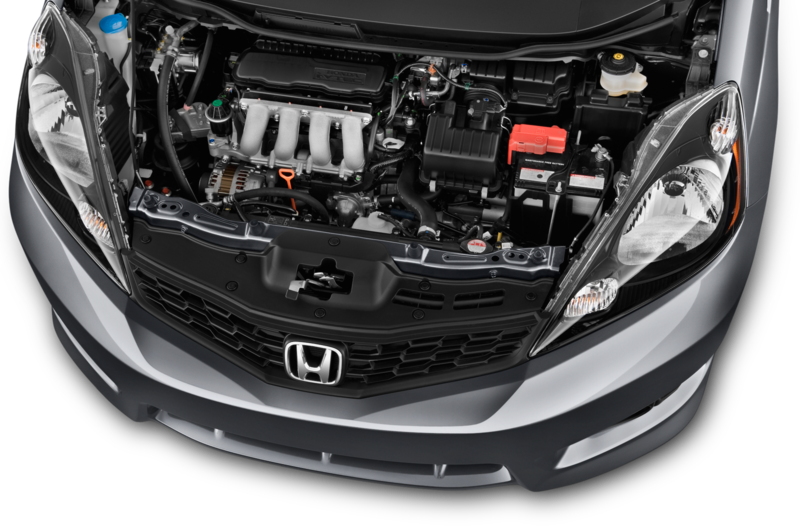 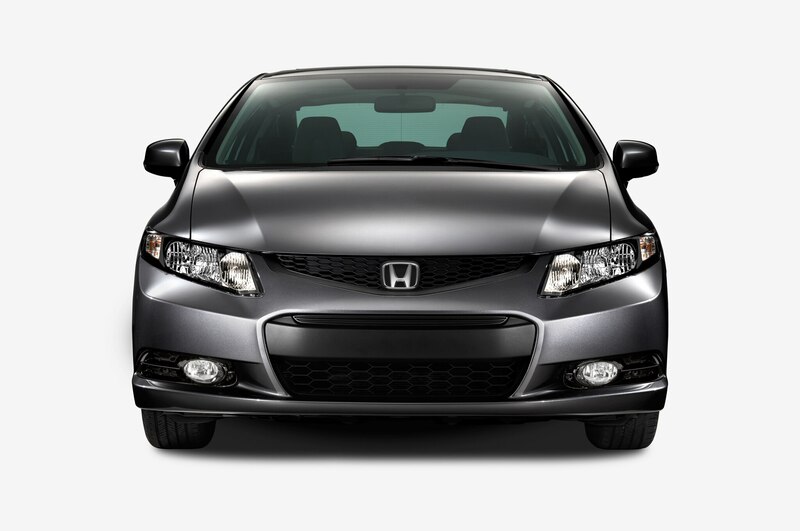 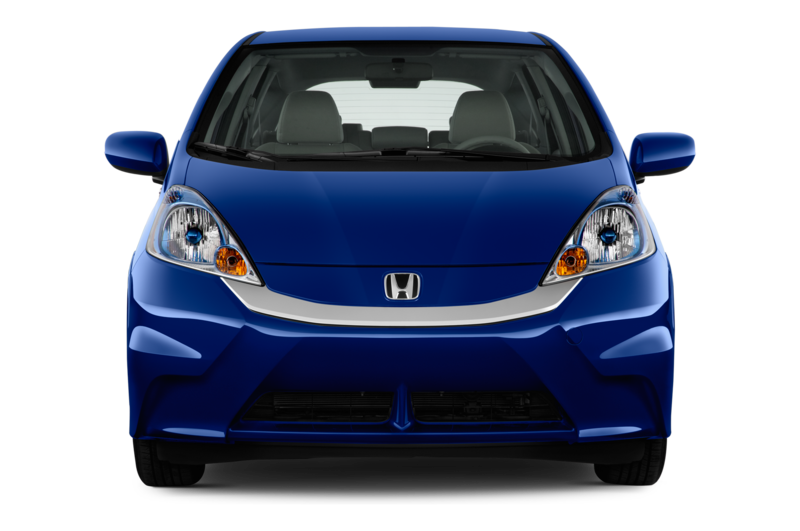 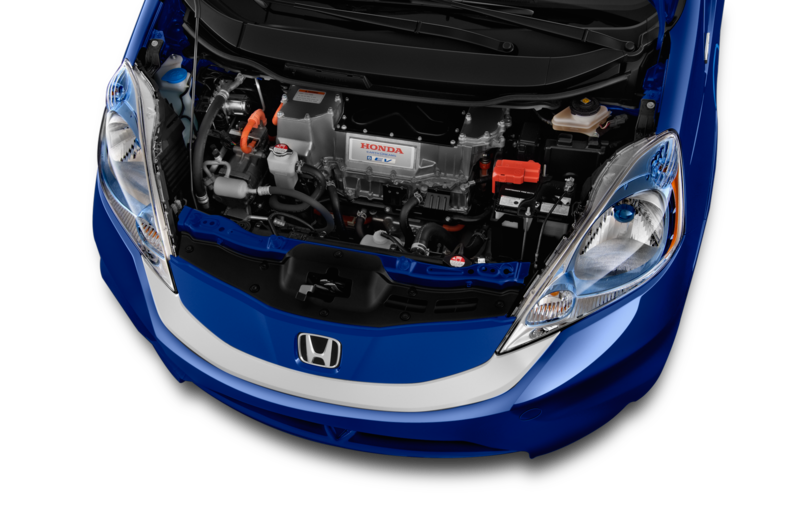 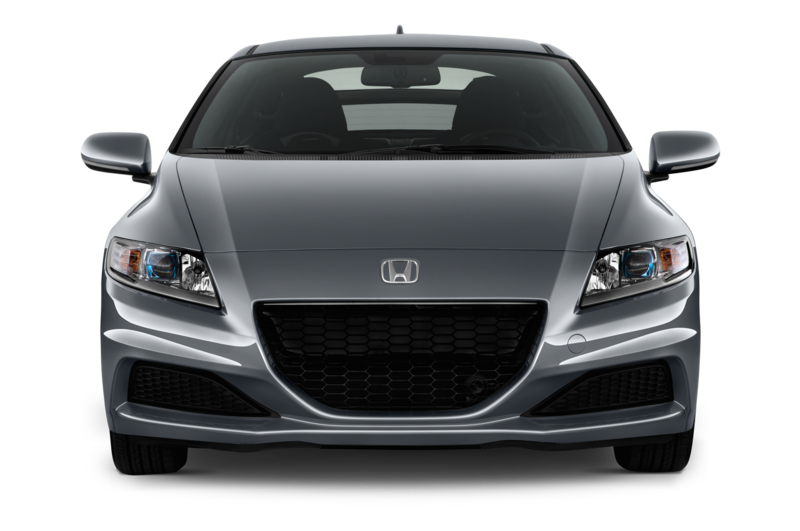 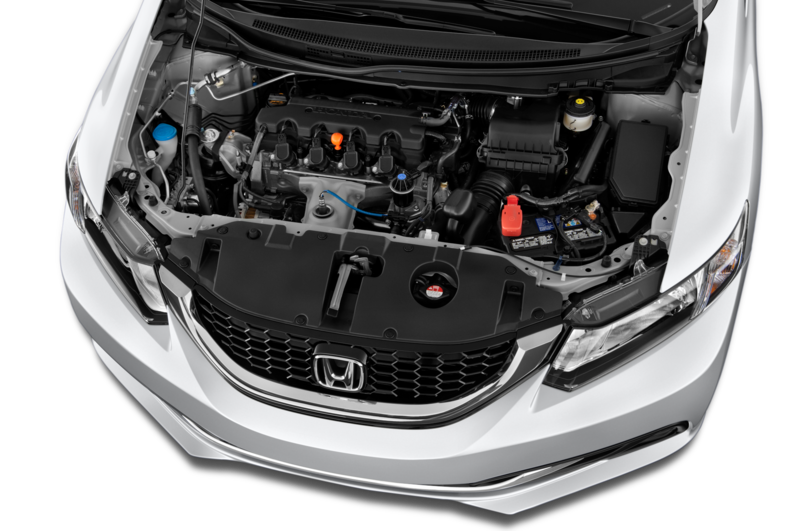 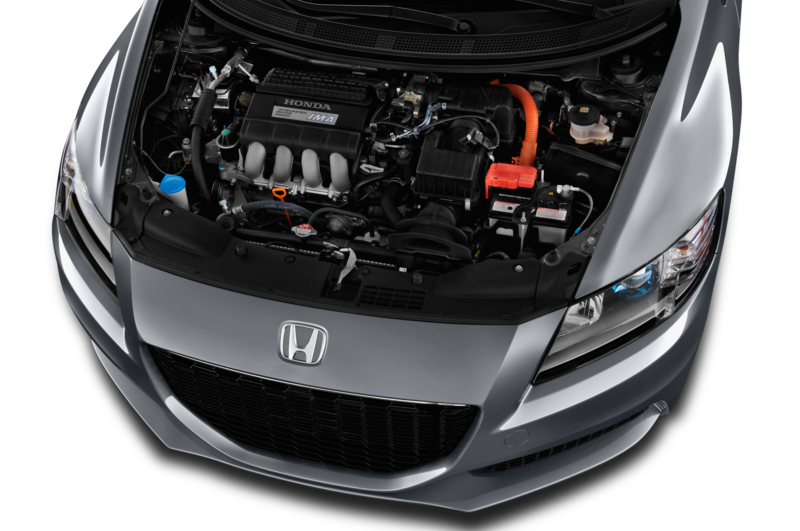 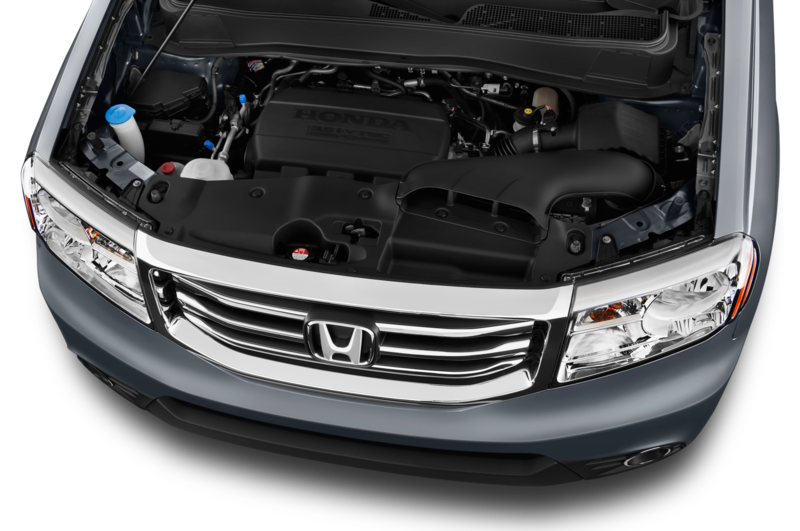 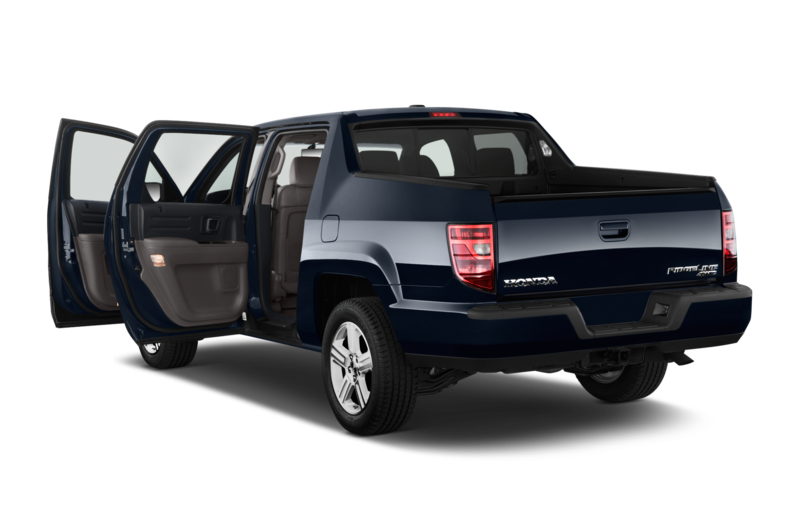 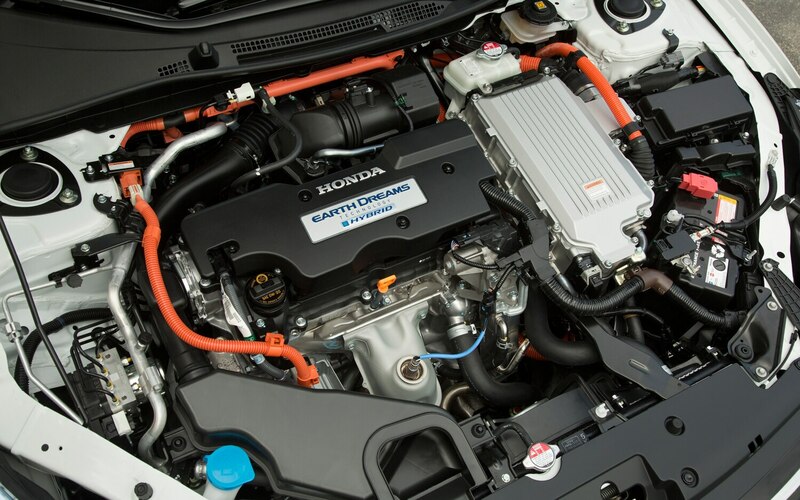 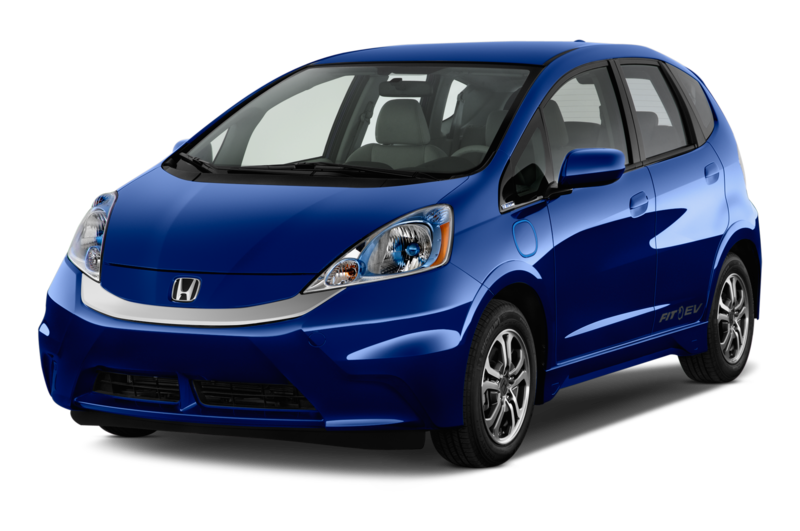 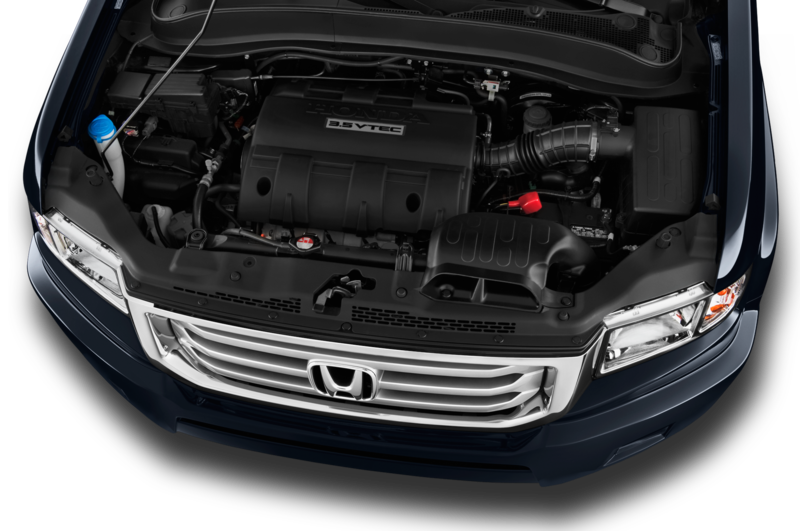 Honda uses both 28-volt active engine mounts and cabin speakers to address NVH. 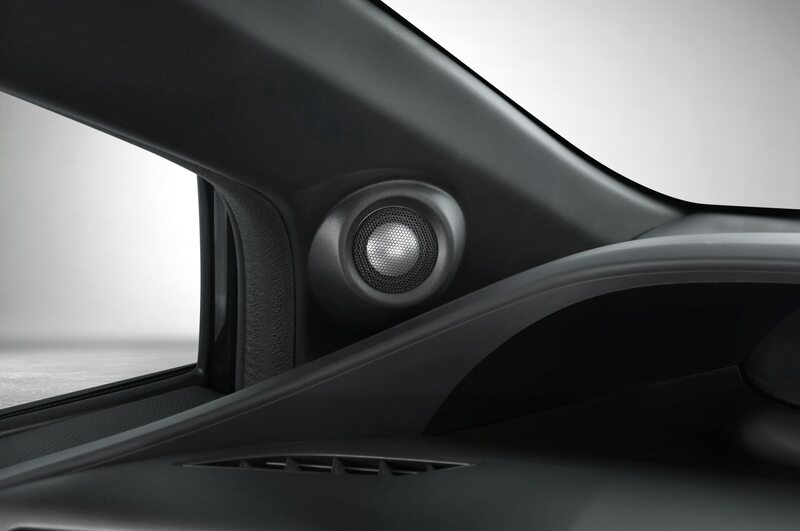 Active Noise Control (ANC) counteracts road noise, and then Active Sound Control (ASC) fine-tunes sounds from under the hood. 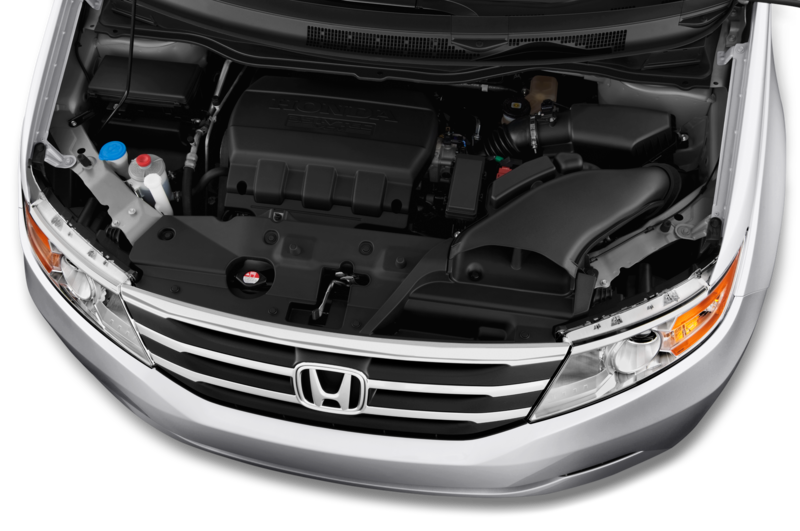 It can reduce the engine noise by up to 3 dB below 2000 rpm, but then is used to slightly alter the engine’s note at high revs. 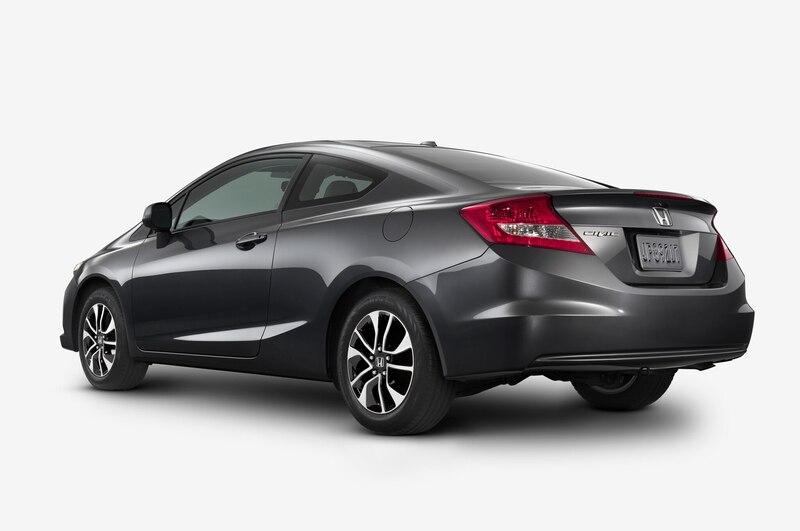 You don’t notice it working — the four-cylinder makes blender-like four-cylinder noises, and it’ll take a very well trained ear to hear the V-6 enter three-cylinder operation. 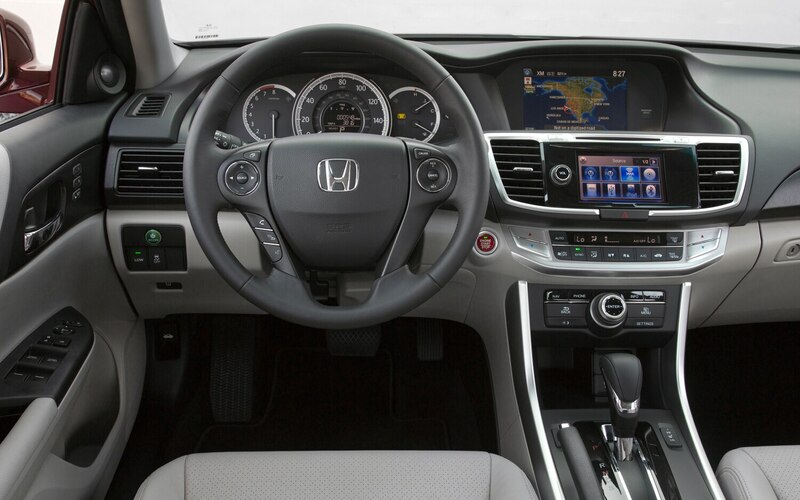 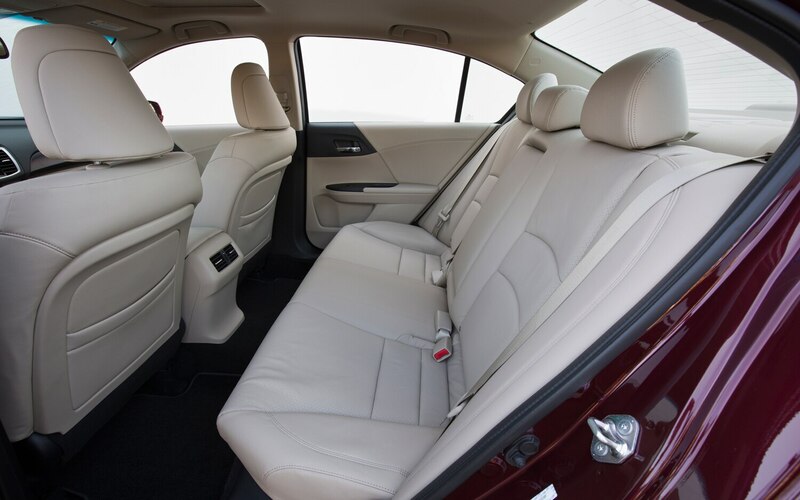 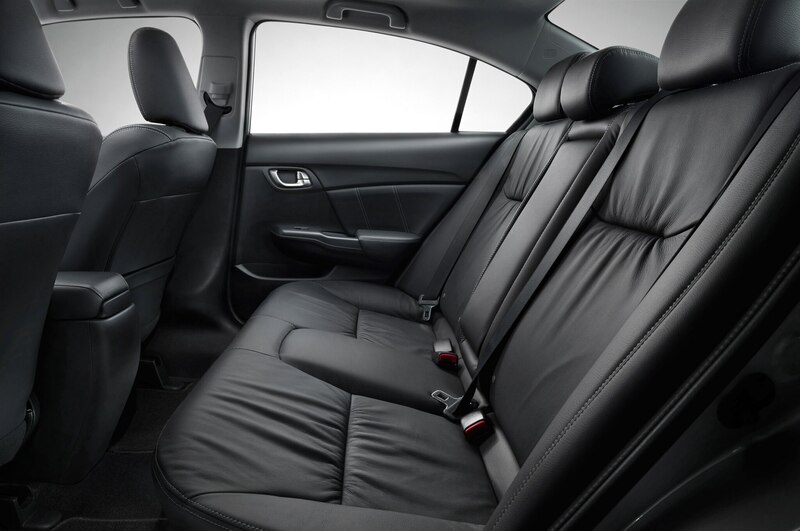 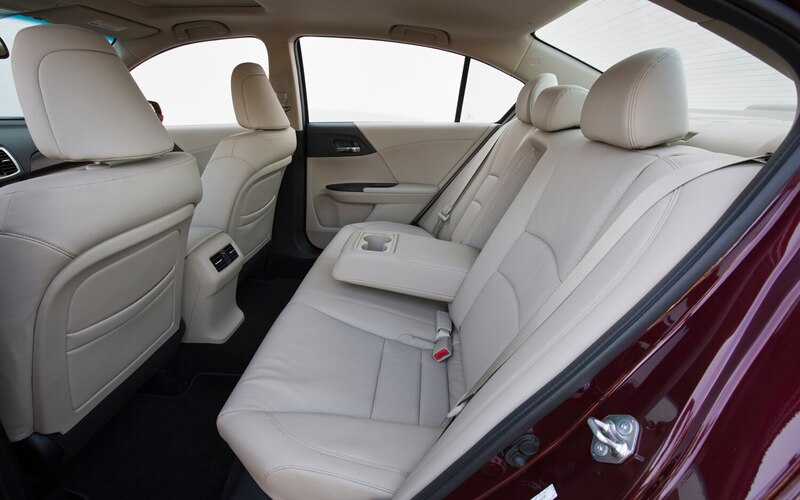 Mostly, the cabin of the Accord is just quiet and pleasant. 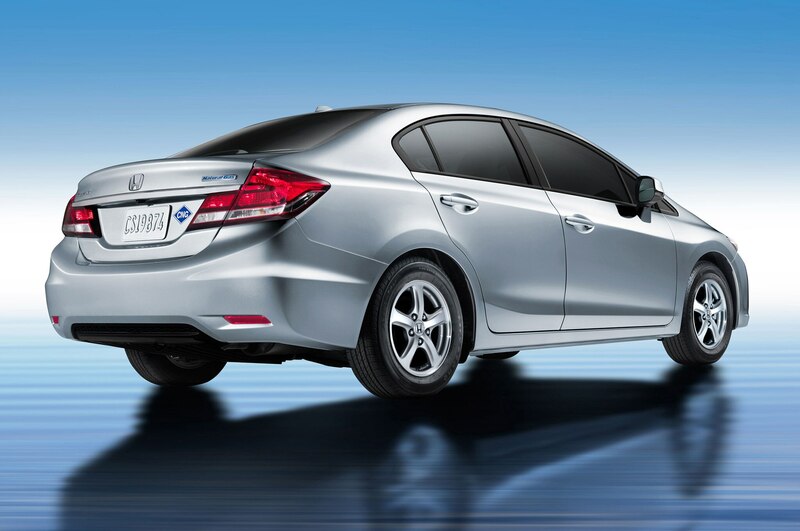 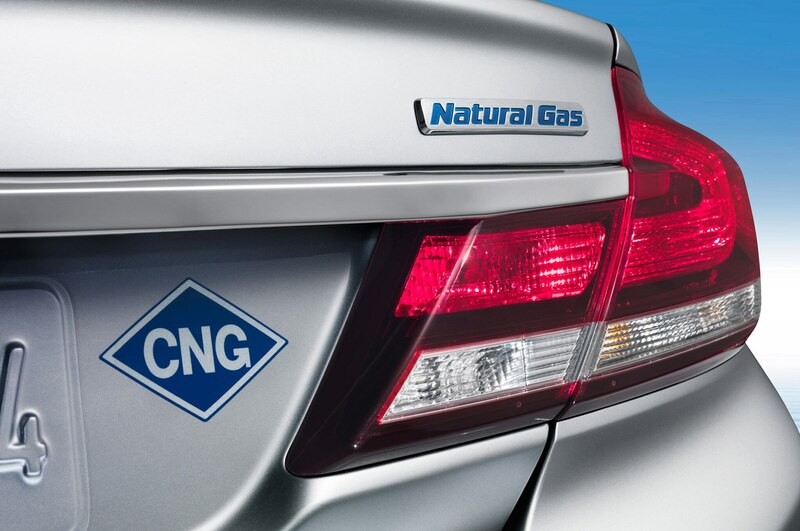 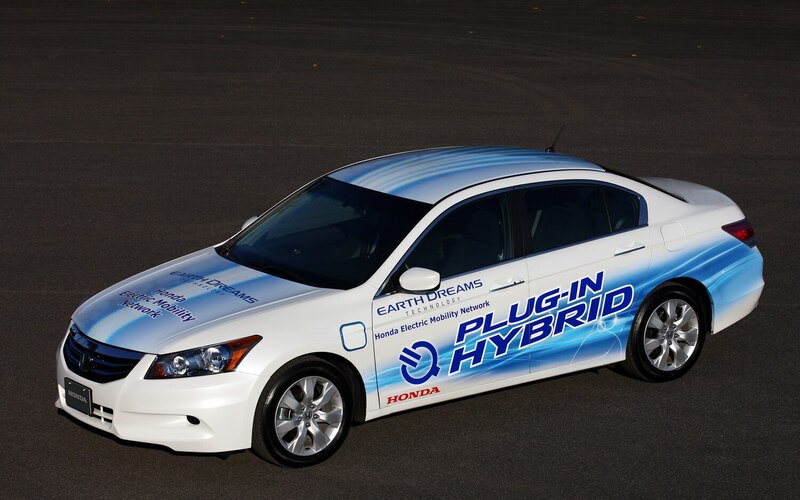 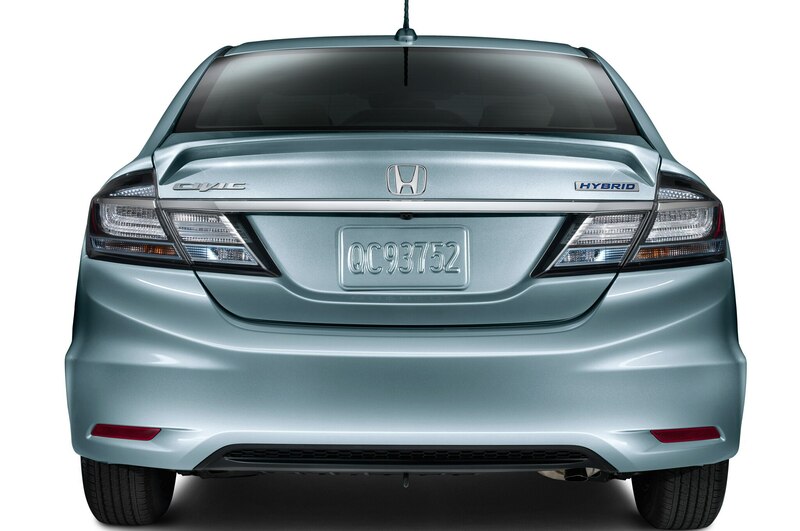 Beginning early next year, the Accord PHEV (plug-in hybrid electric vehicle) will go on sale as a 2014 model. 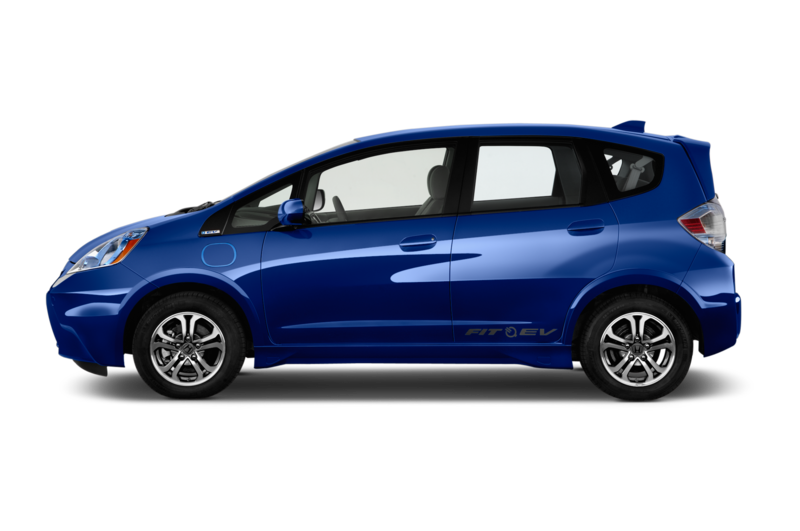 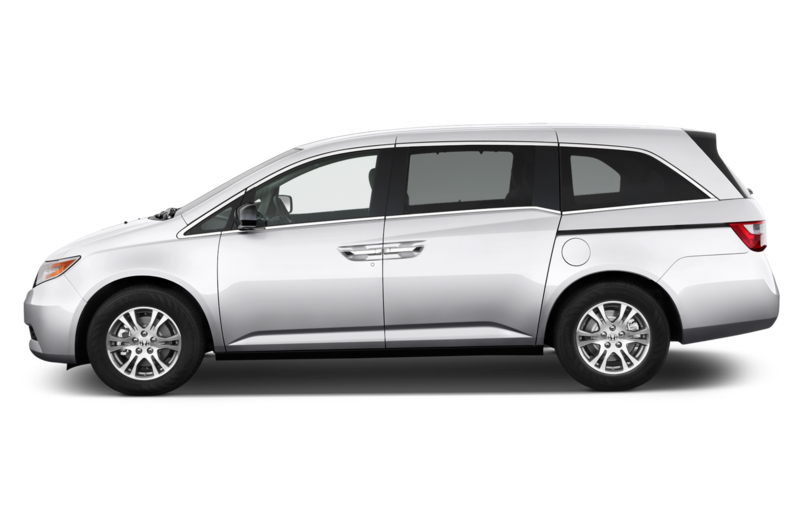 It uses a DOHC 2.0-liter Atkinson-cycle four-cylinder that produces 137 hp, assisted by a 124-kW electric motor for a total system output of 196 hp. 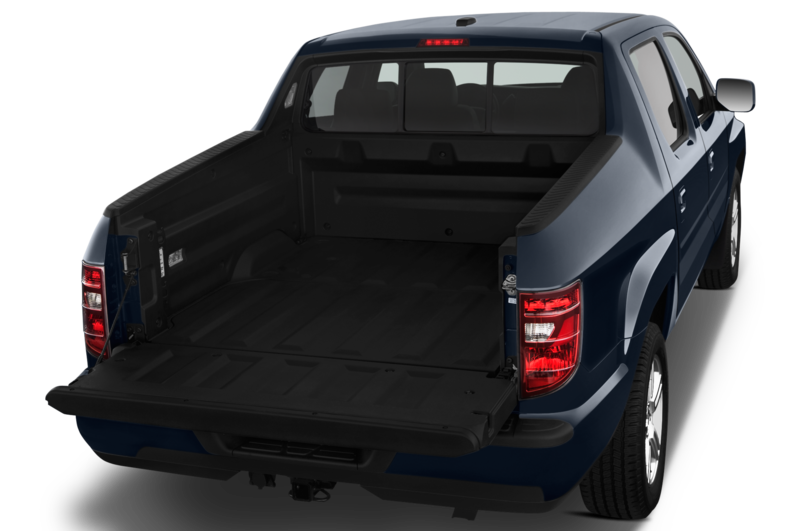 The 6.7-kWh lithium-ion battery pack promises up to a 15-mile range on battery power alone. 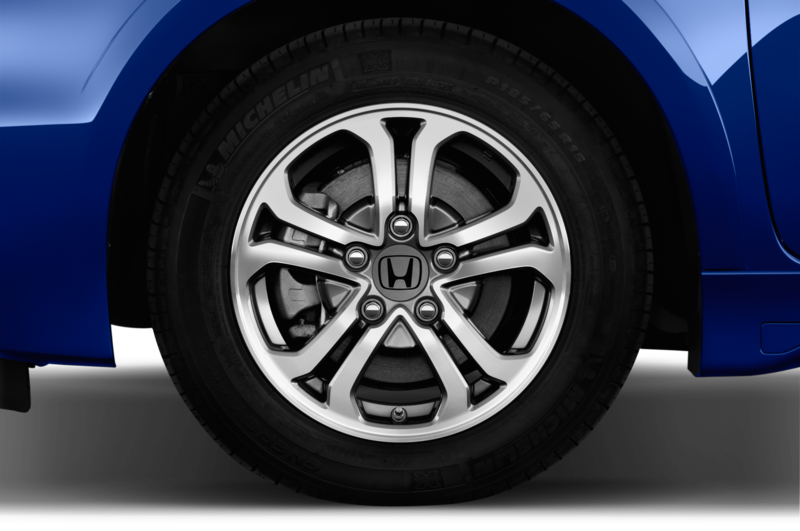 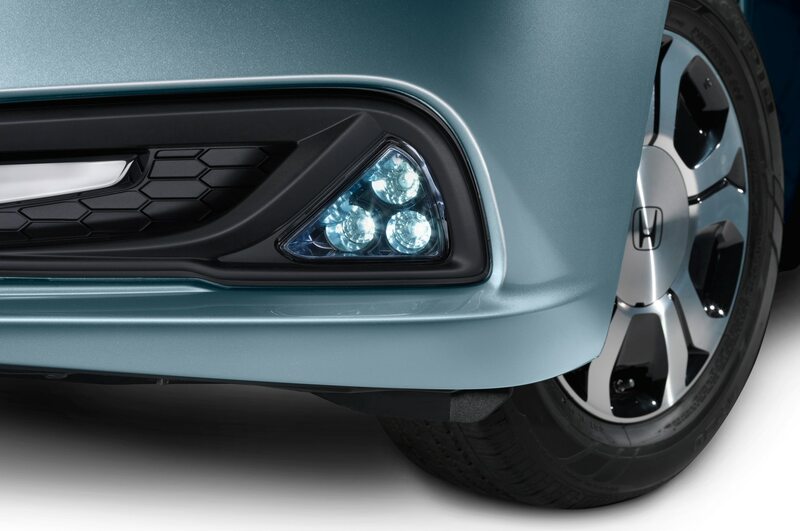 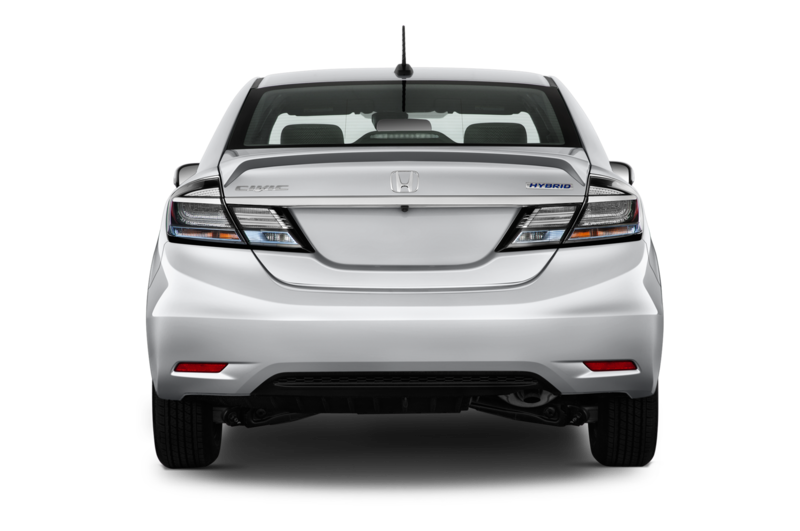 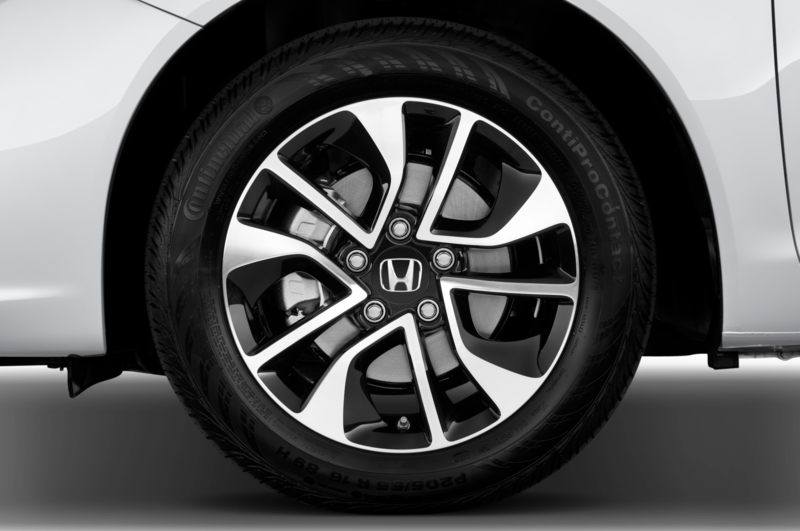 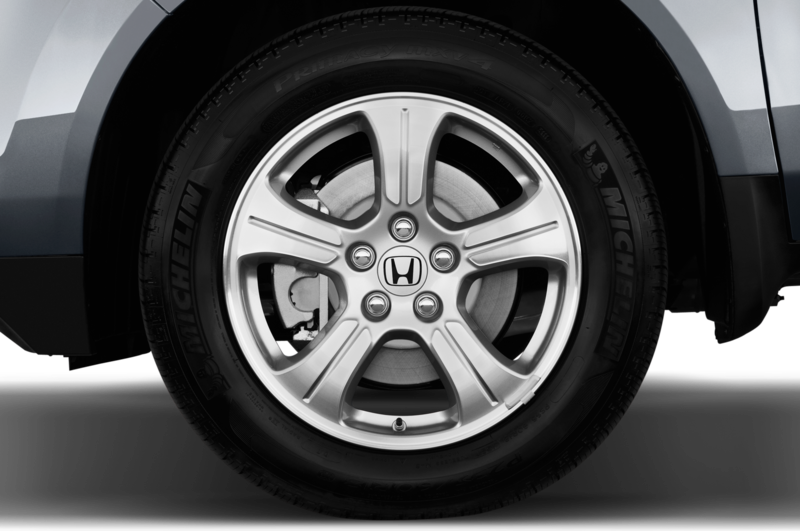 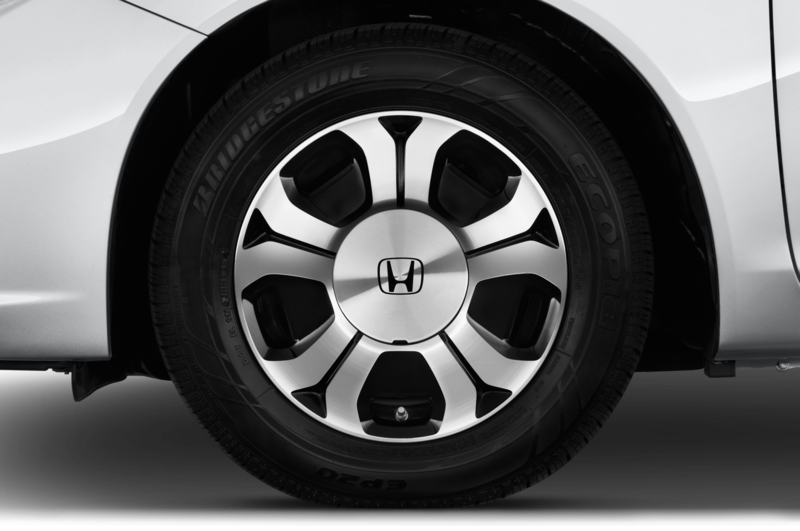 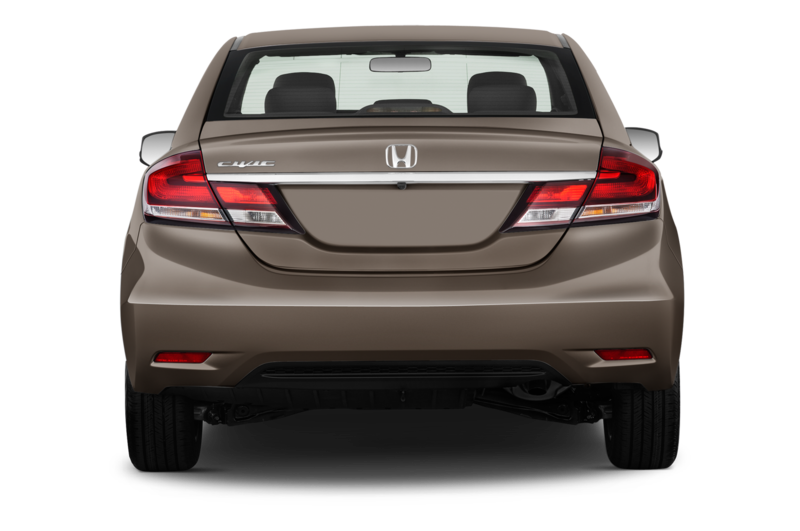 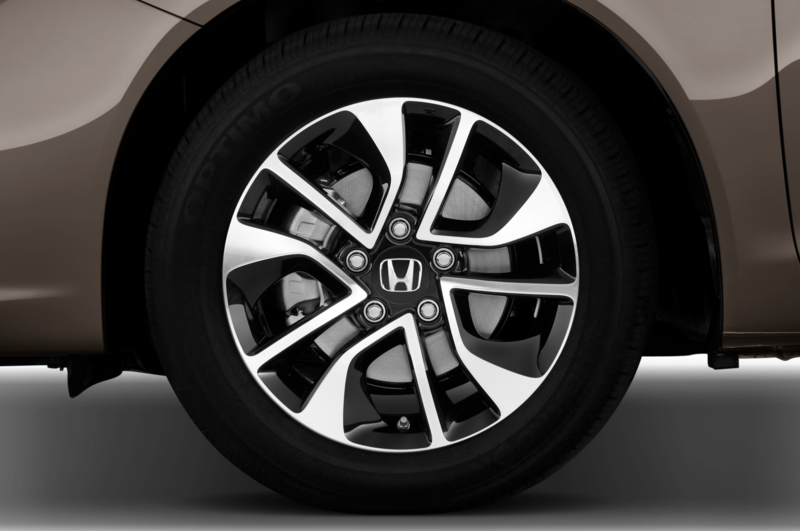 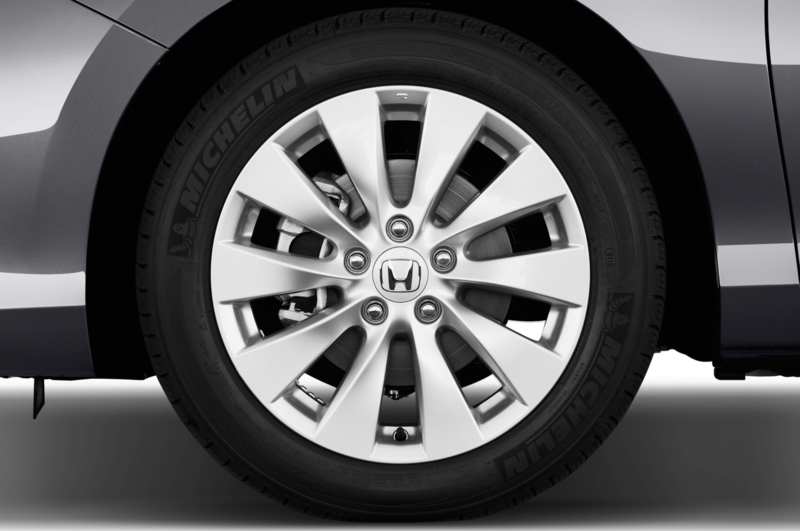 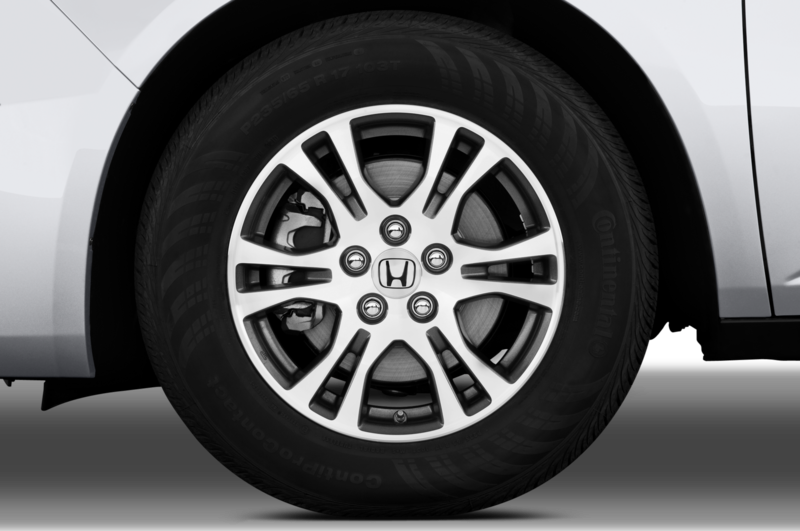 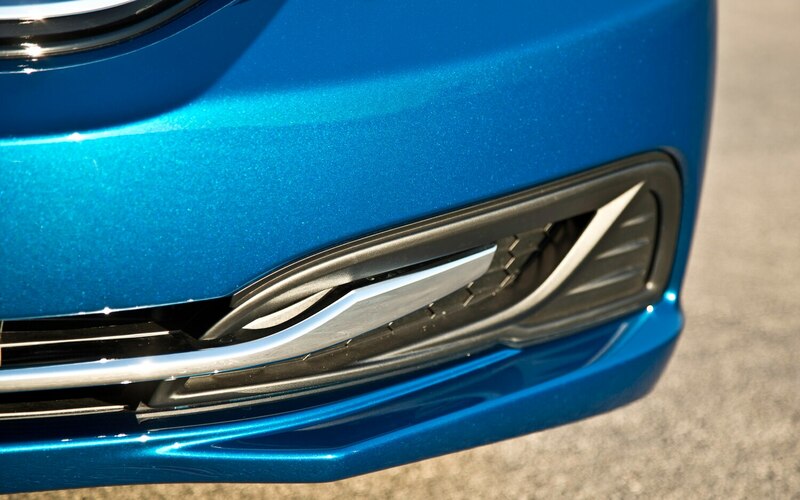 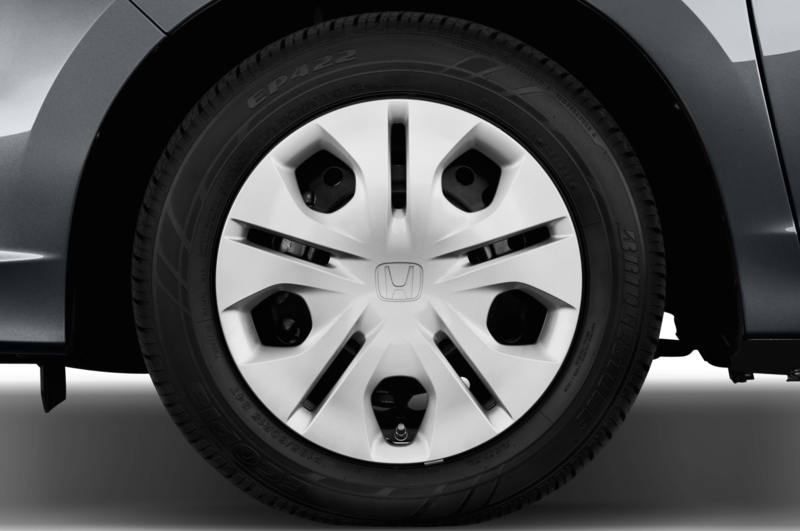 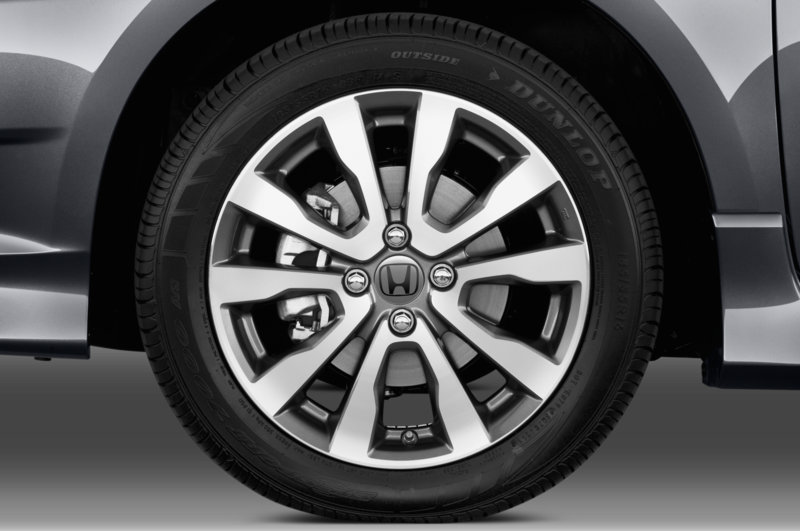 The Accord PHEV’s front-end styling is significantly different than the conventionally powered sedans, and it wears dramatic wheels designed to reduce aerodynamic drag. 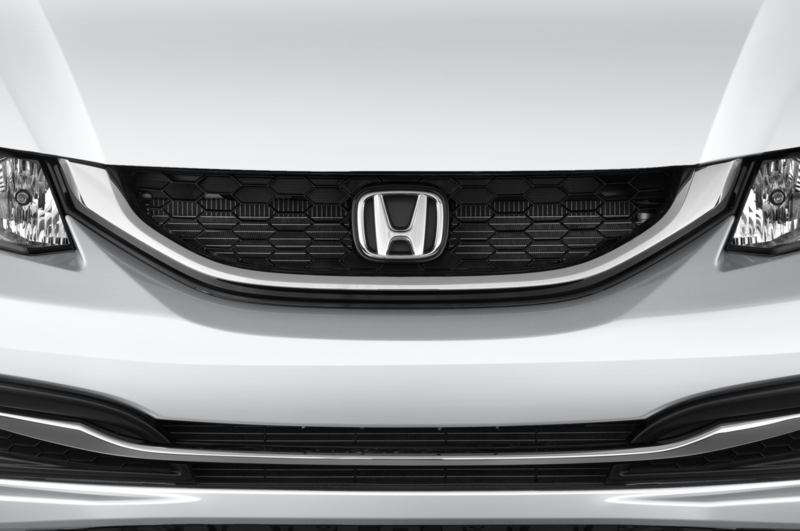 Honda allowed us to take a quick spin in a prototype vehicle that seemed nearly production-ready. 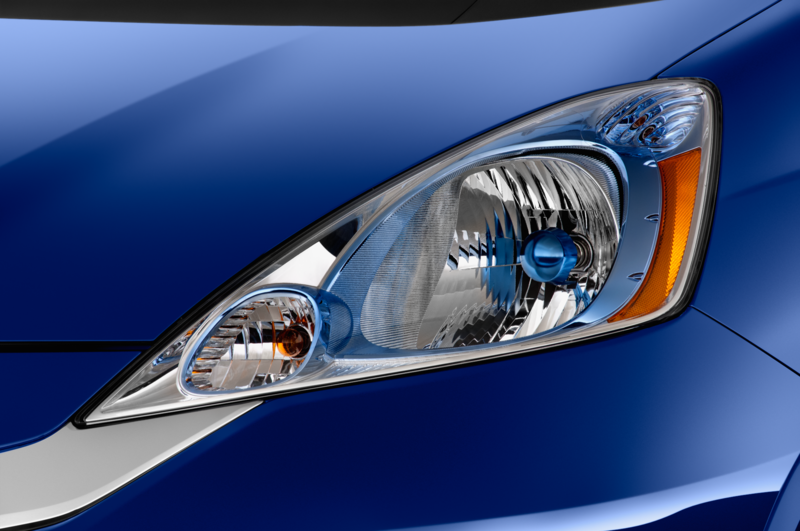 The blended brakes’ handoff between regenerative and friction braking as you approach a stop — historically one of the hardest things for car companies to get right — is the best we’ve ever experienced. 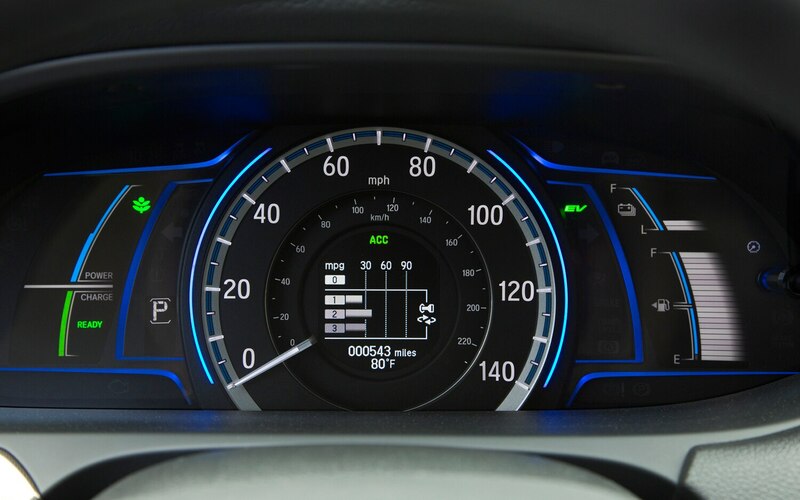 The Accord PHEV is not quick off the line — in fact, it’s painfully slow — but it accelerates quite rapidly at highway speeds. 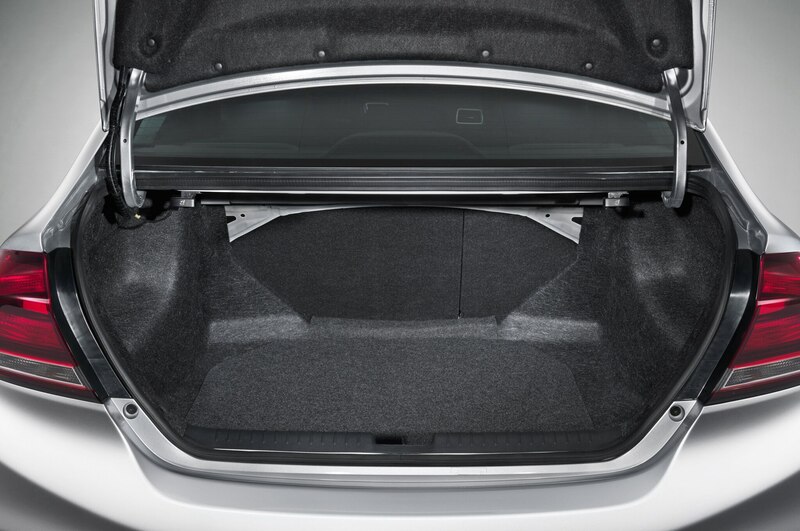 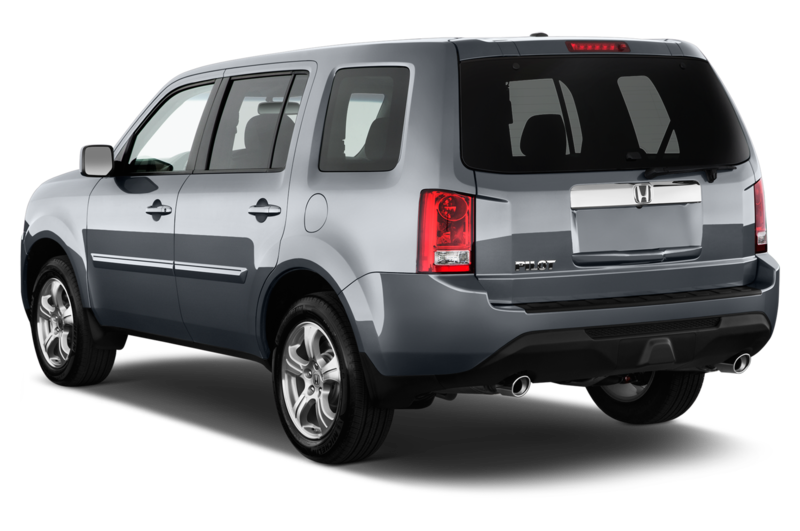 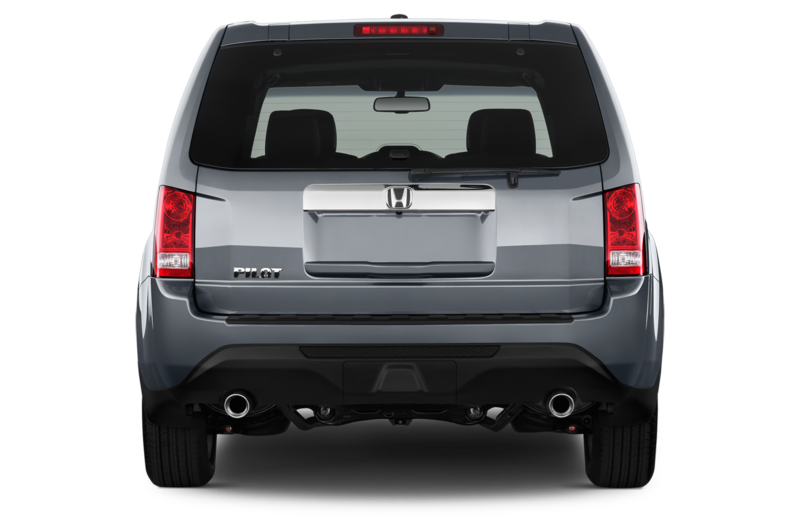 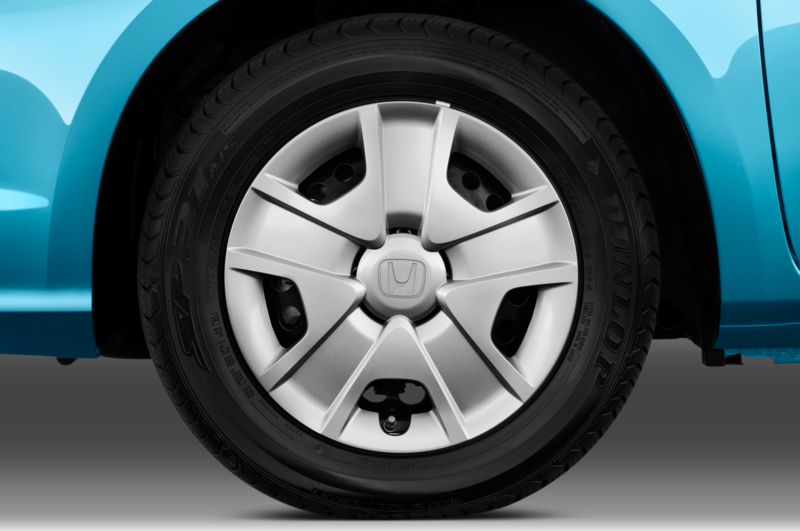 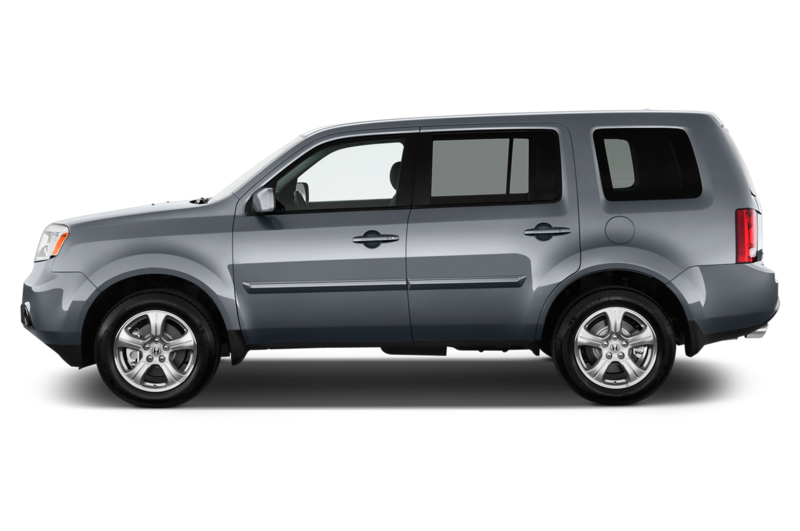 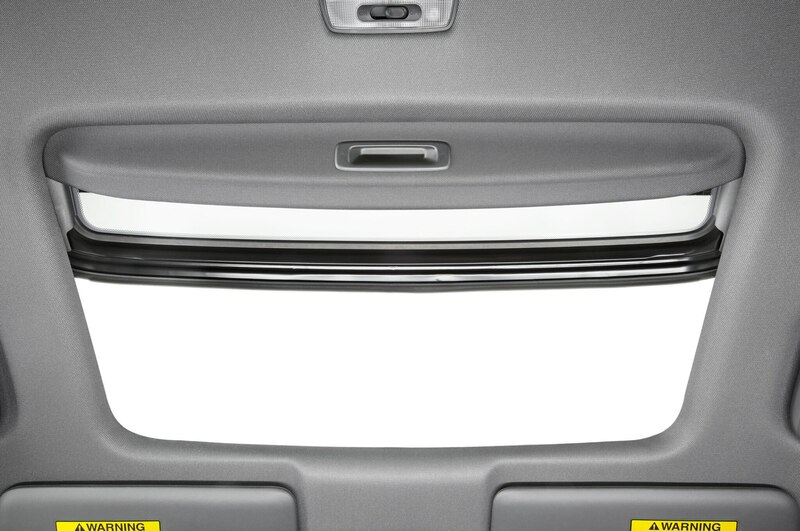 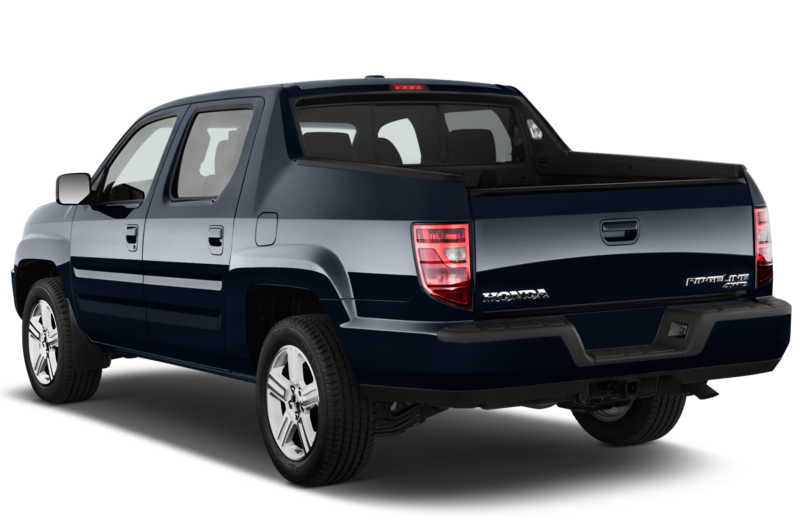 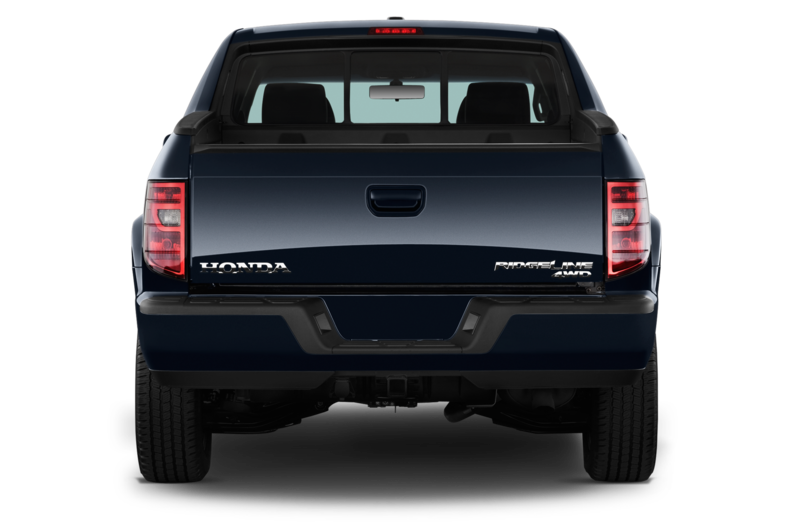 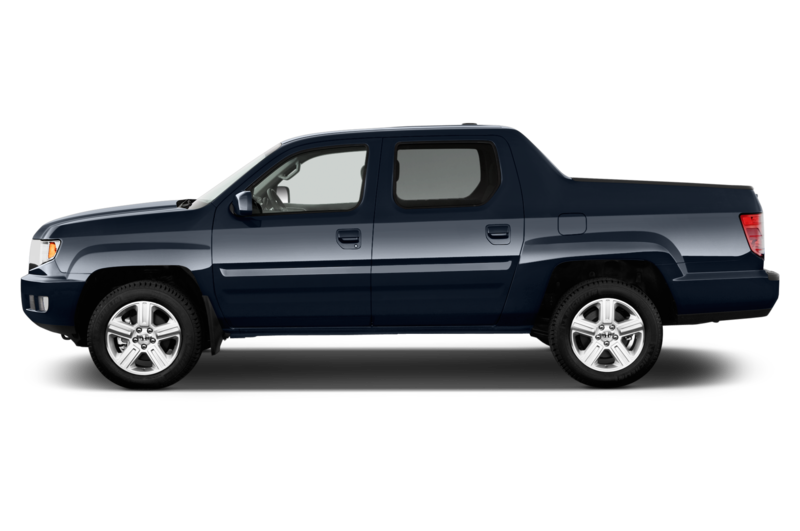 Cornering maneuvers betray the additional weight in the back, where the battery is mounted. 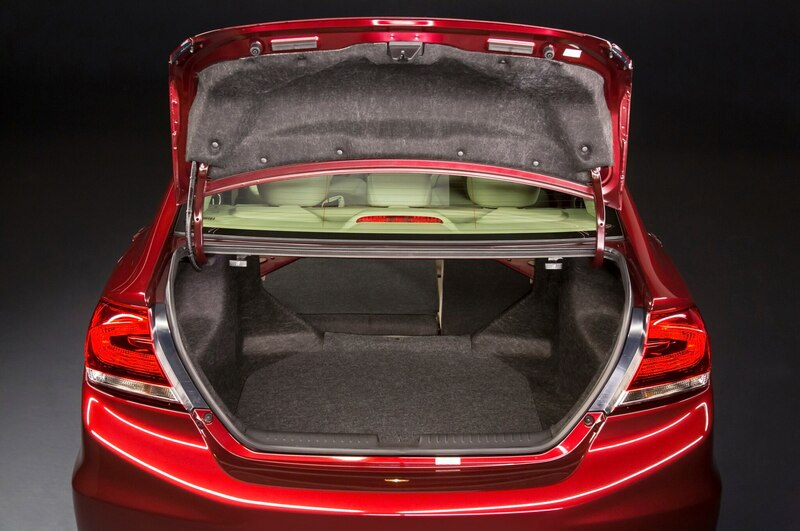 (It takes up what seems like half of the trunk.) 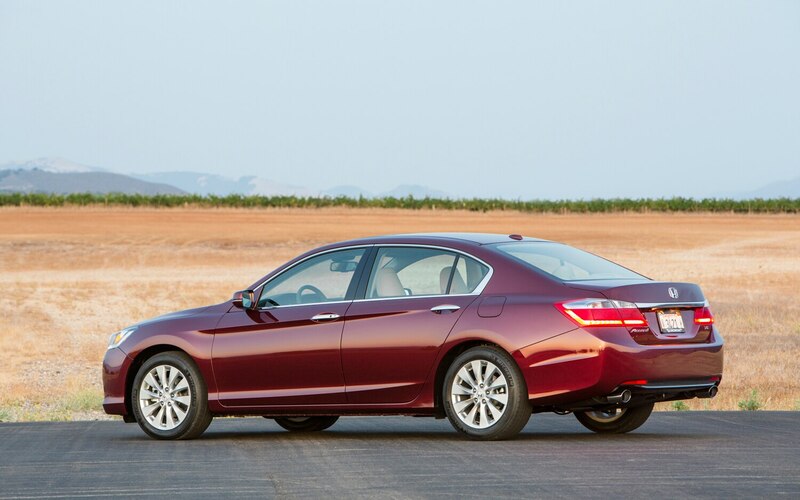 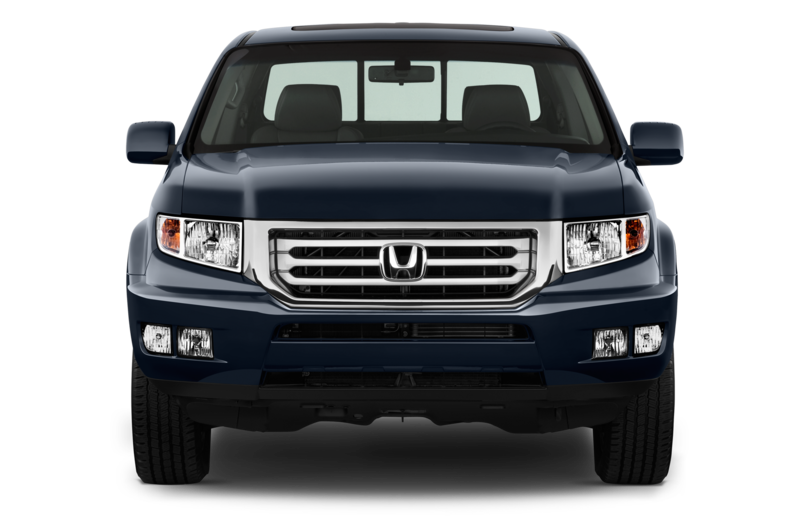 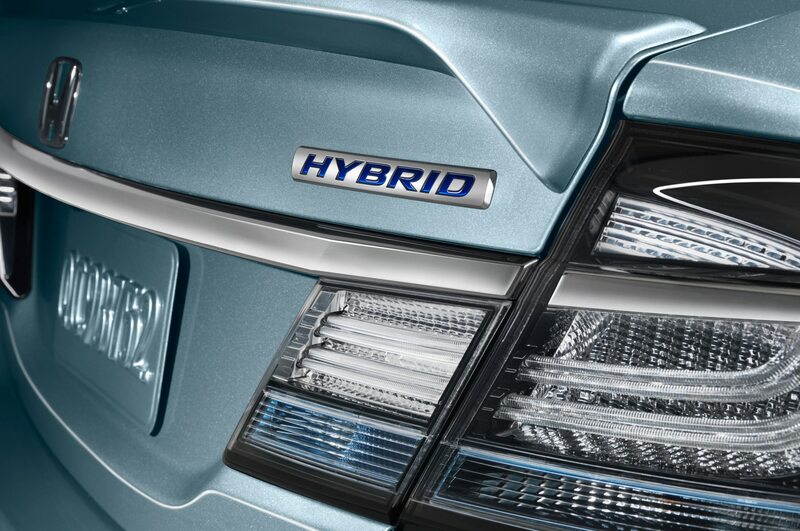 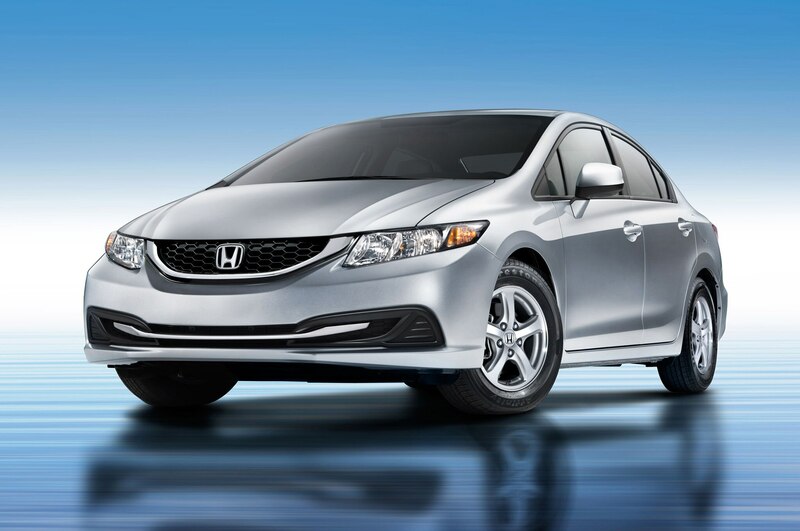 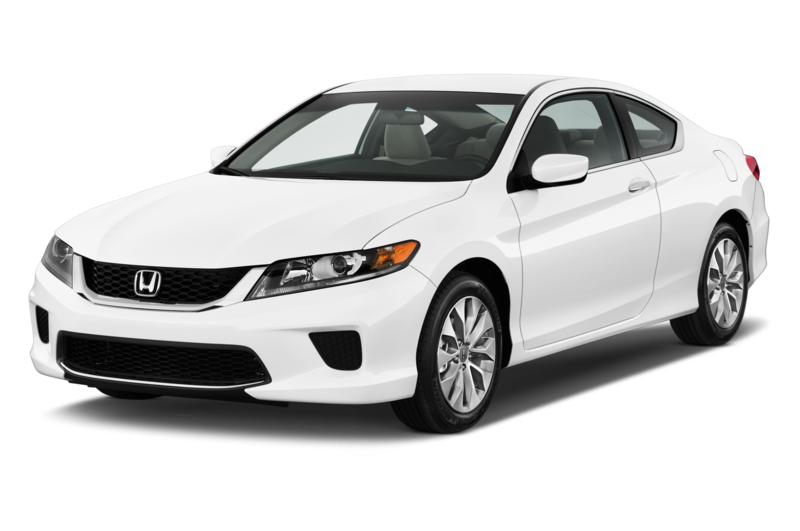 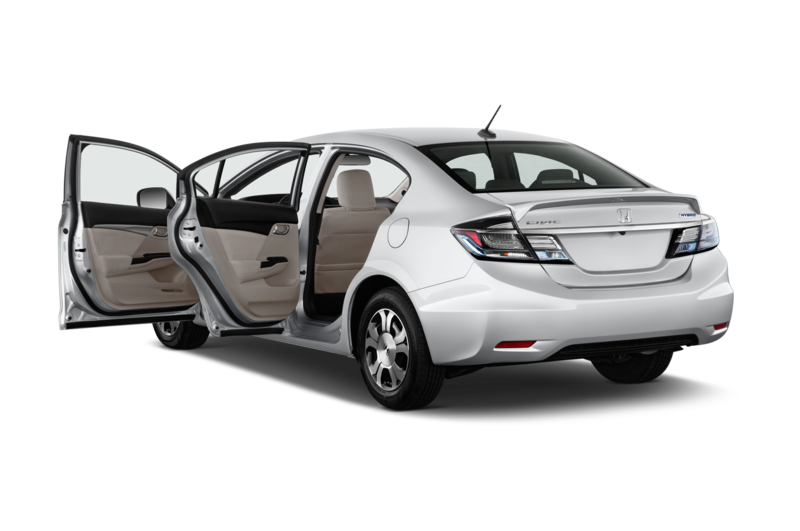 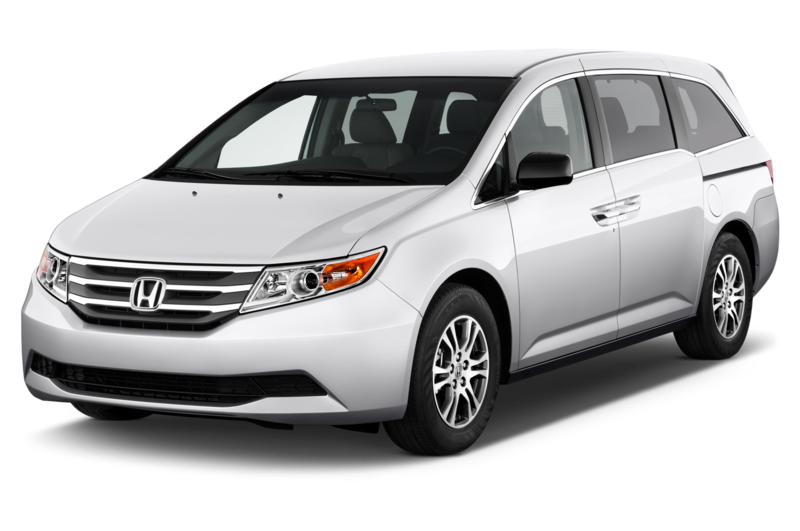 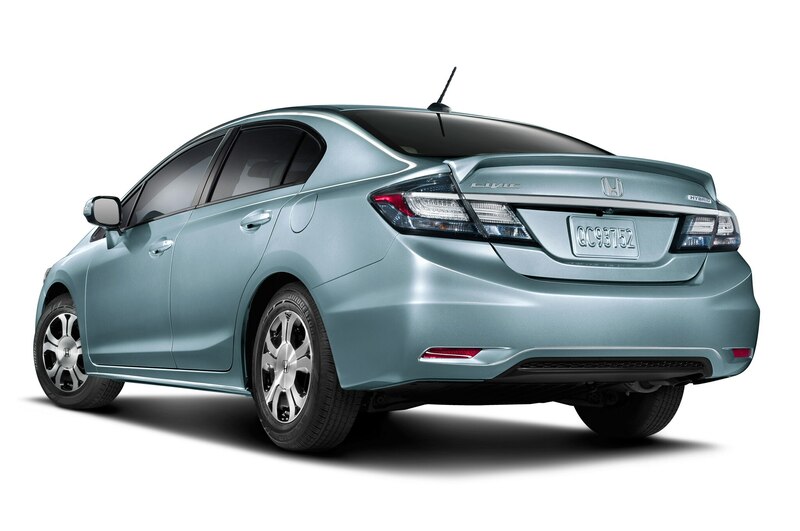 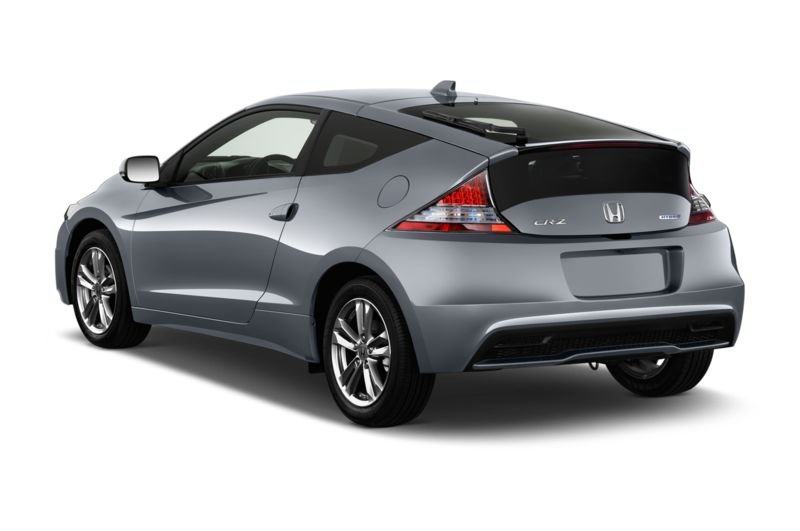 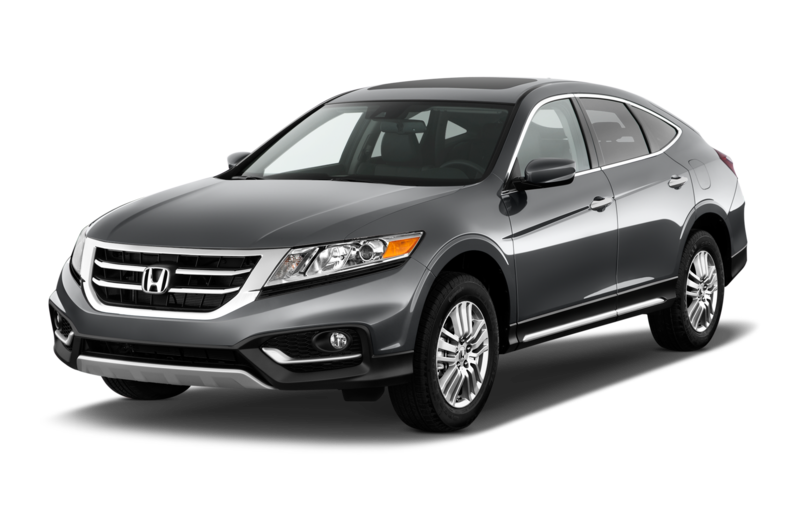 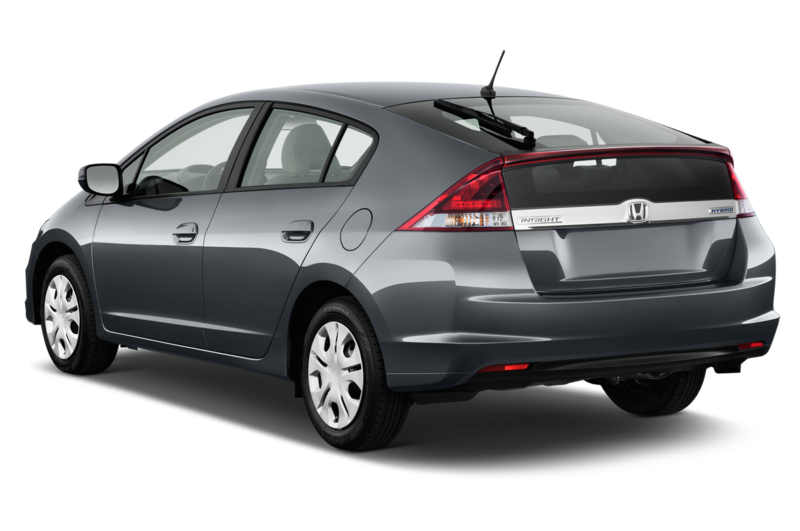 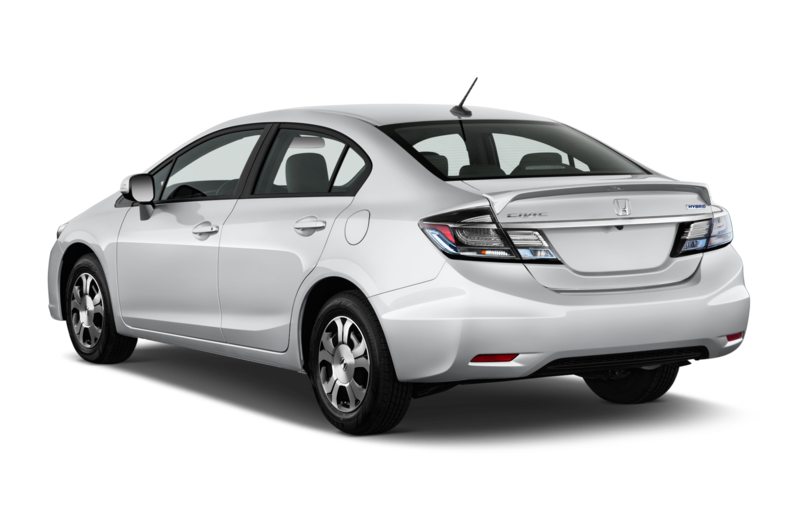 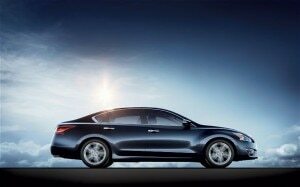 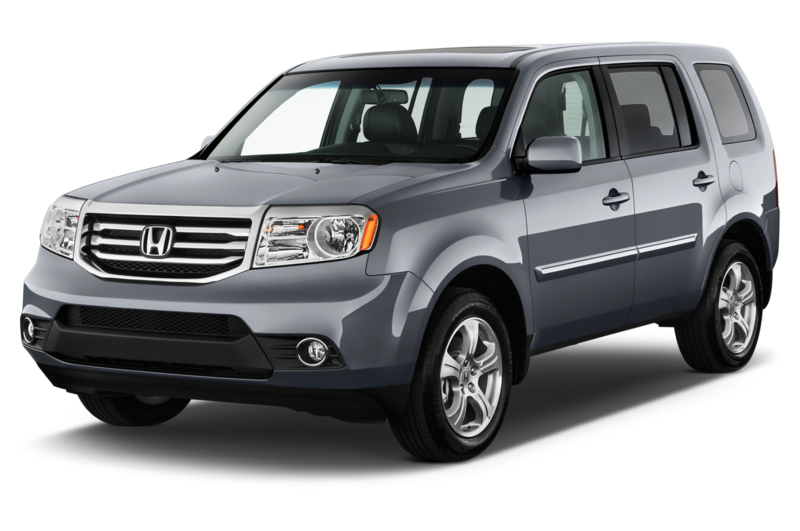 A full hybrid (non-plug-in) Accord will go on sale in the summer of 2013. 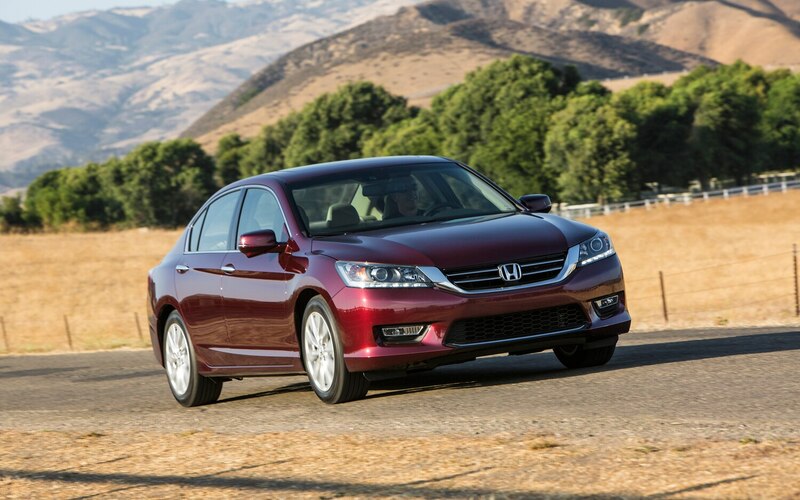 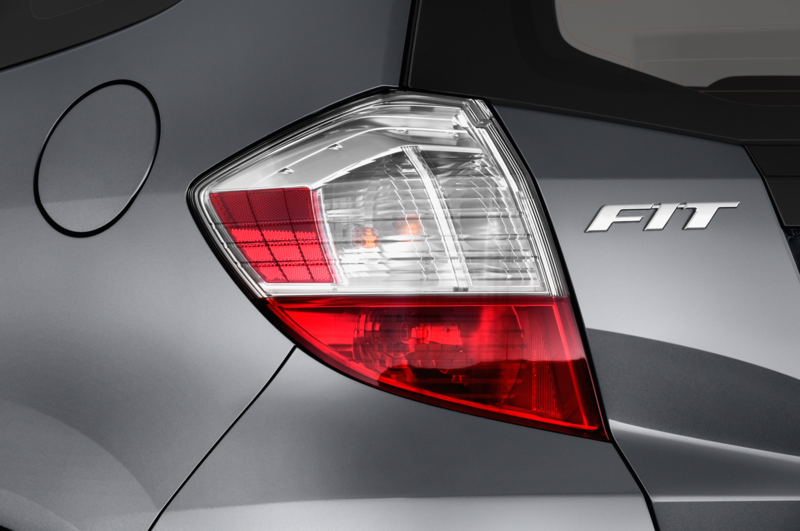 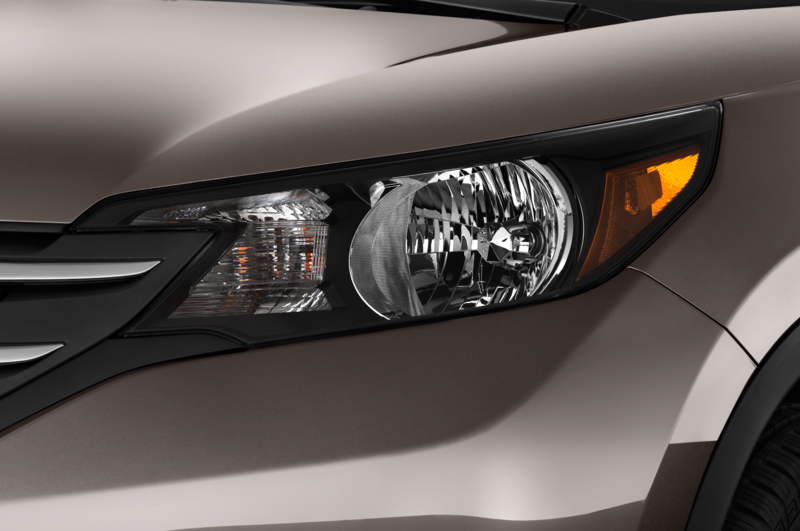 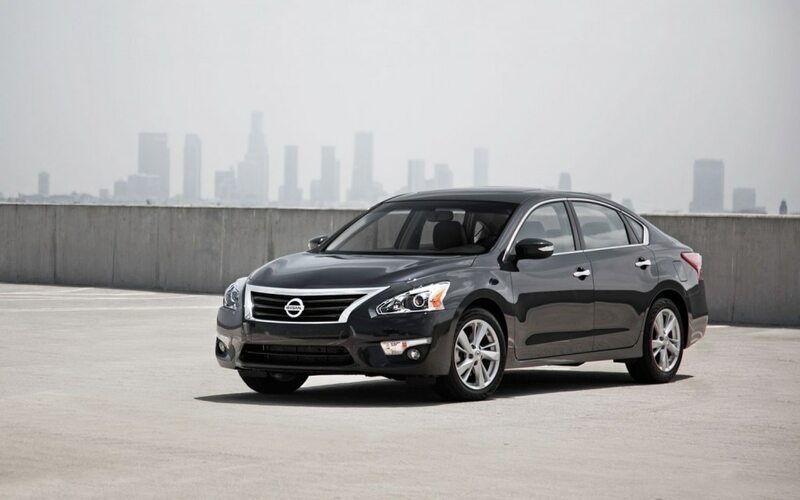 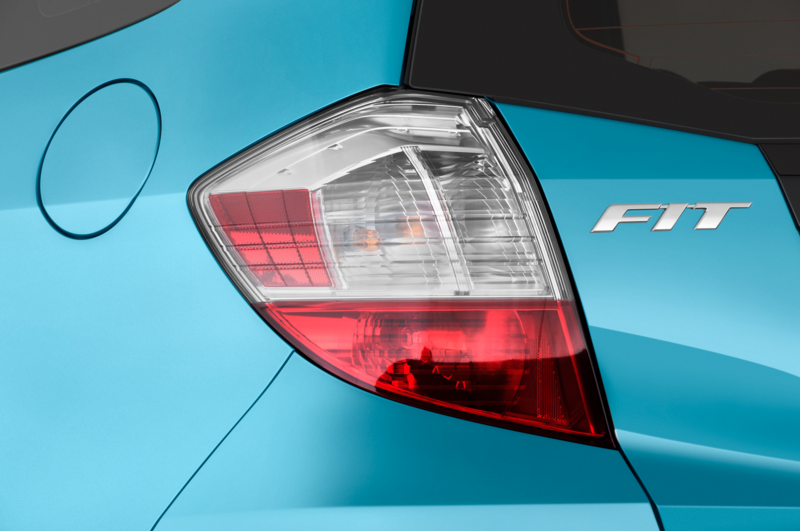 This family sedan segment has always been hotly contested, and is now even more so. 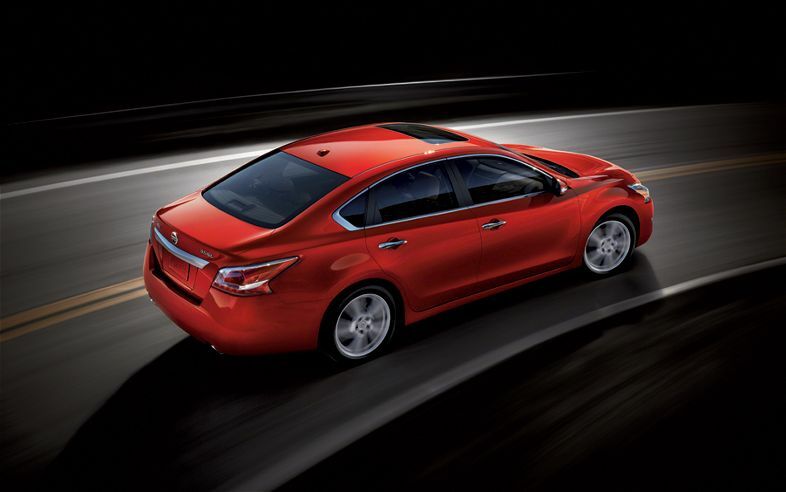 The Accord reenters the market against a highly styled Hyundai Sonata (and drop-dead gorgeous Kia Optima), a vastly improved Toyota Camry, and a highly competent new Nissan Altima. 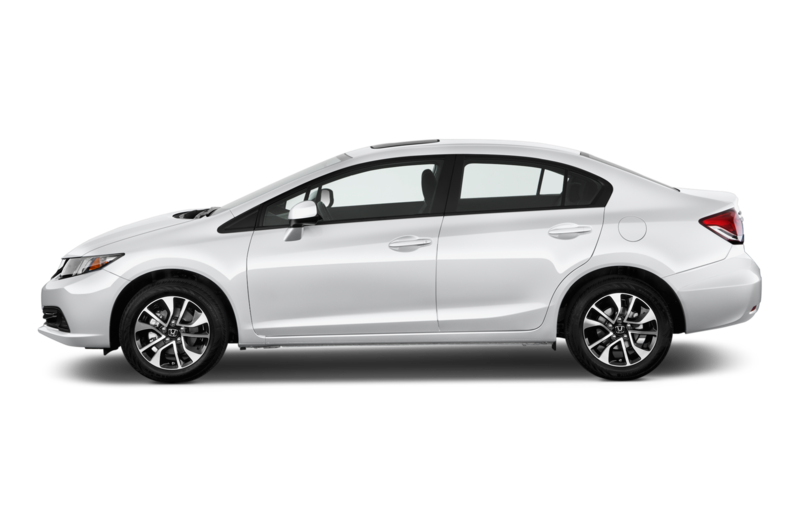 Great as those competitors are, they’re not perfect — the Hyundai/Kia twins are rough around the edges where NVH, ride quality, and steering are concerned; the Camry is still plagued with milquetoast exterior styling; the Nissan is frumpy looking and its four-cylinder lags way behind in refinement. 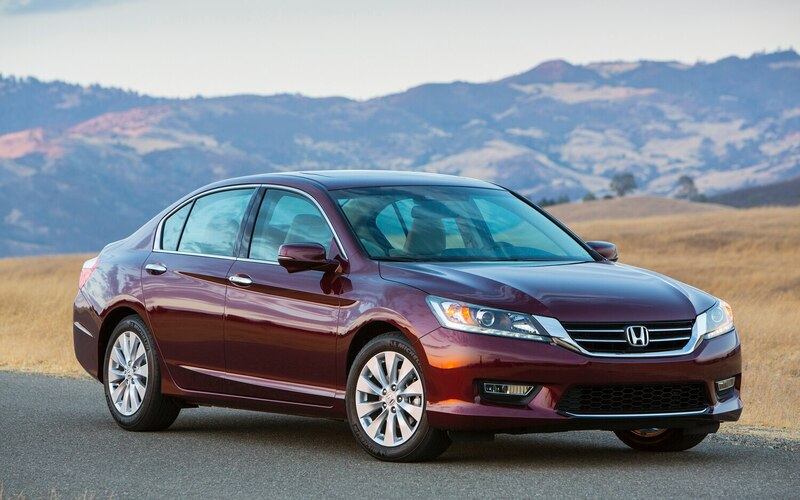 The four-cylinder Honda Accord, despite its copycat styling, suffers from very little in the way of drawbacks. 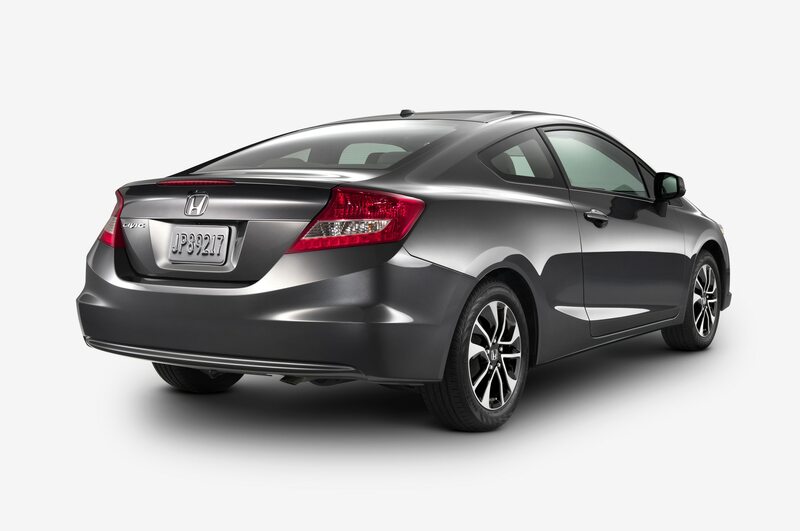 In fact, it’s good enough for us to say it has squeaked past the Toyota Camry and regained its spot at the top of the class. 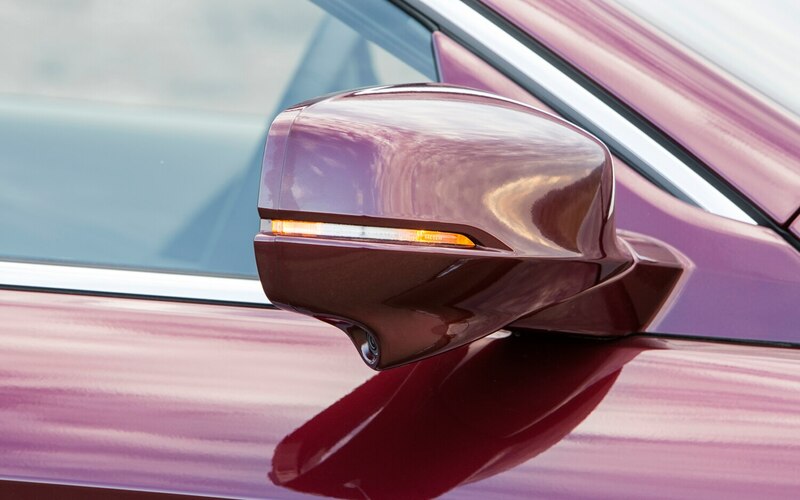 How long will that last? 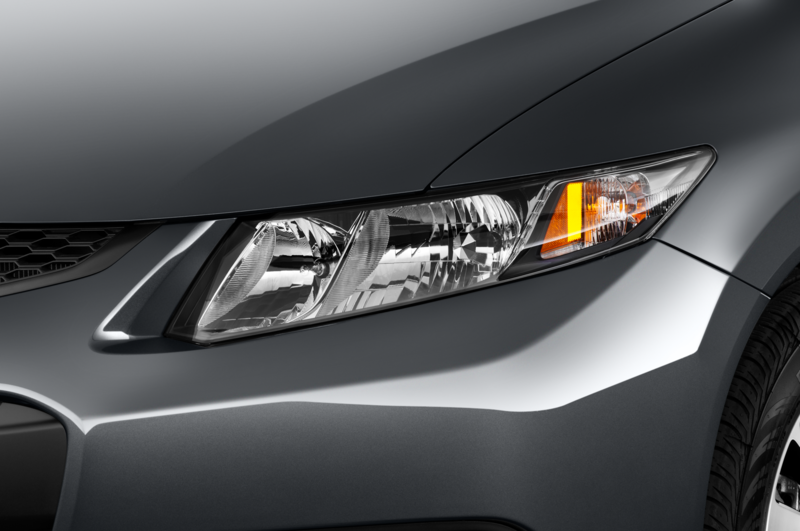 Well, we’ll be driving the new (and talk about good-looking!) 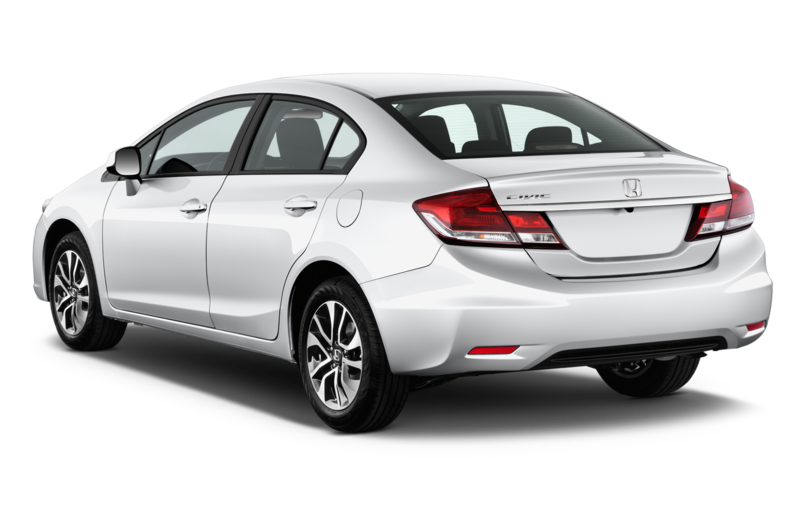 Ford Fusion and an all-new Mazda 6 very shortly… and we’ll then see whether this Accord of a certain age can remain ahead of its peers.